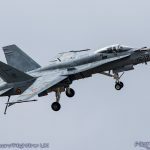 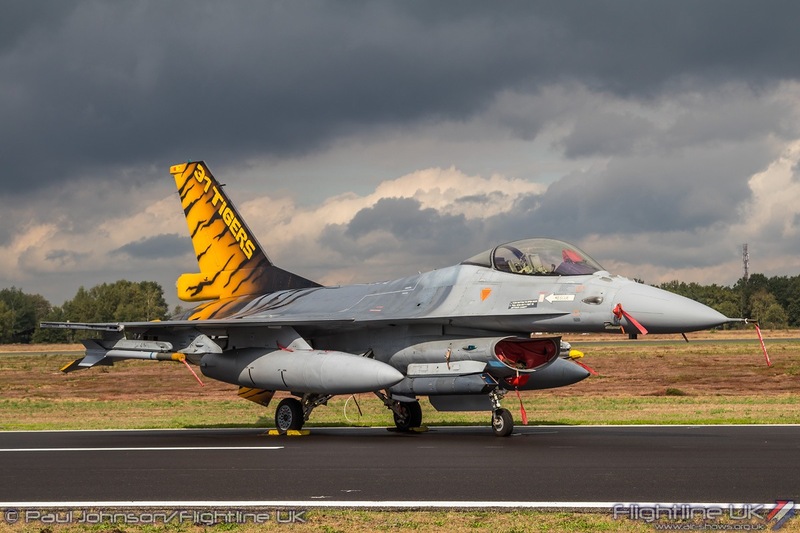 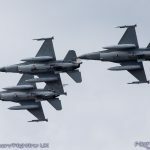 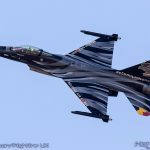 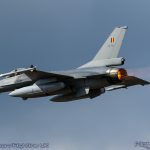 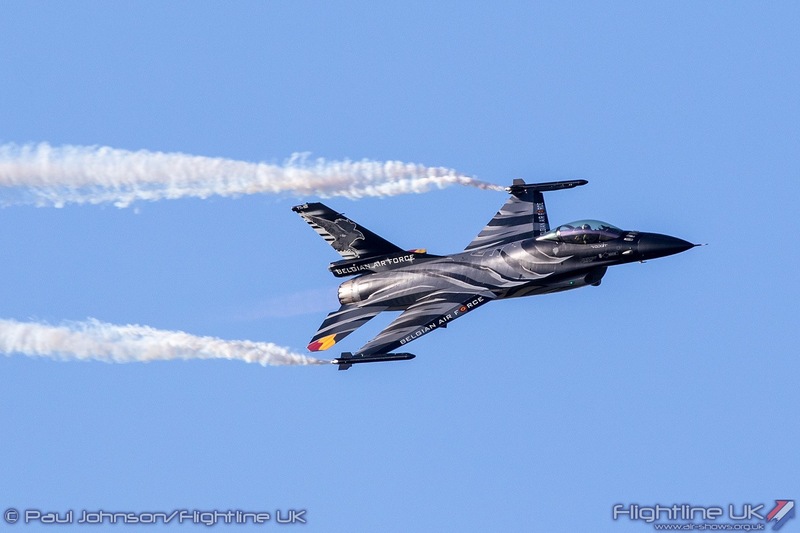 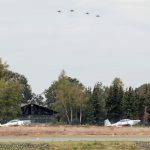 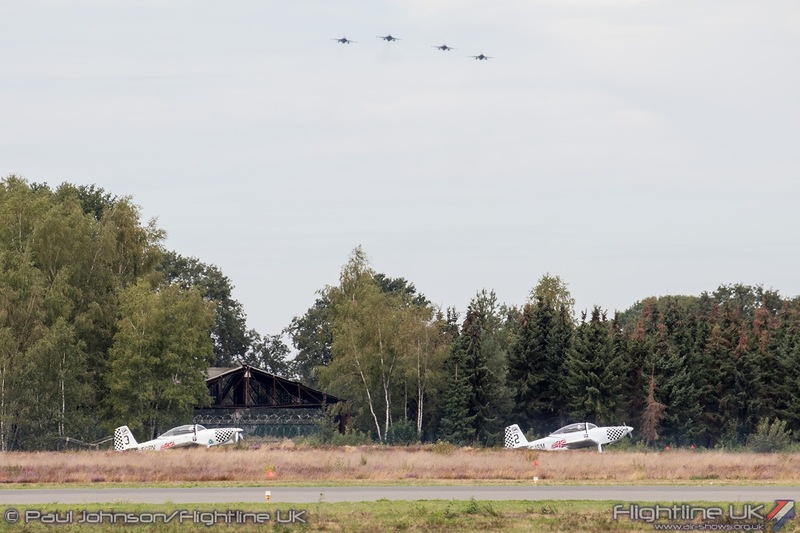 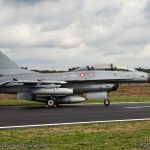 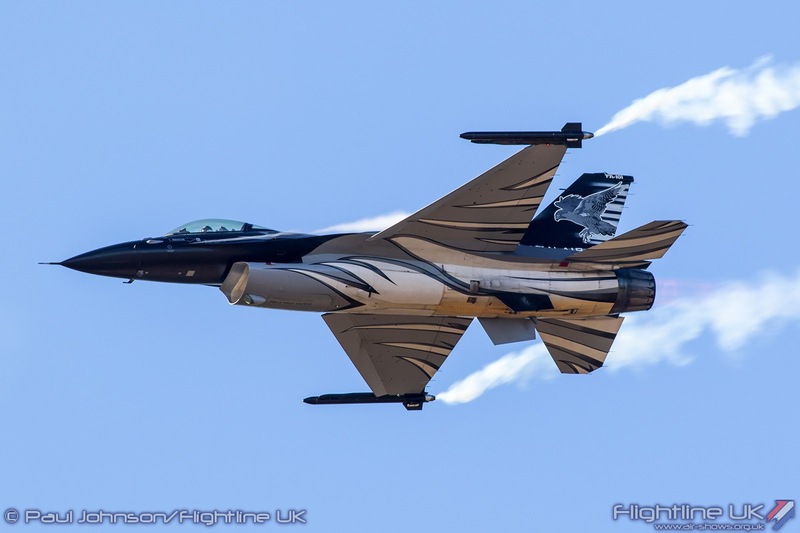 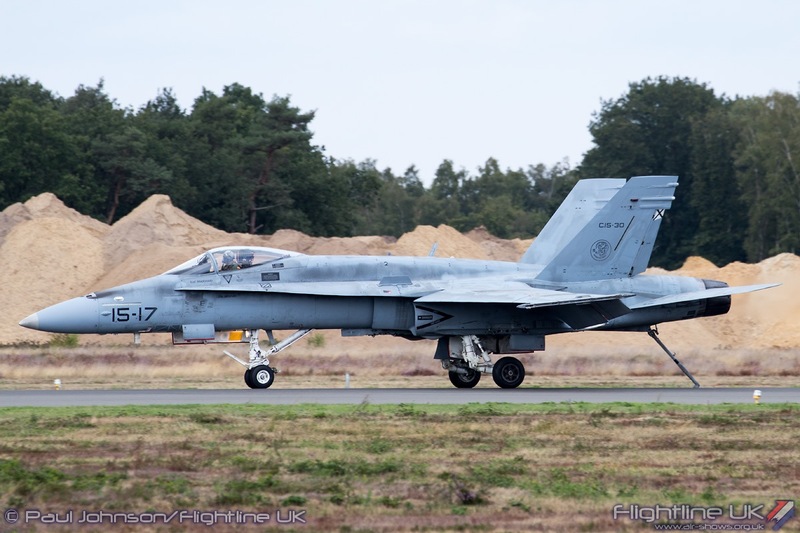 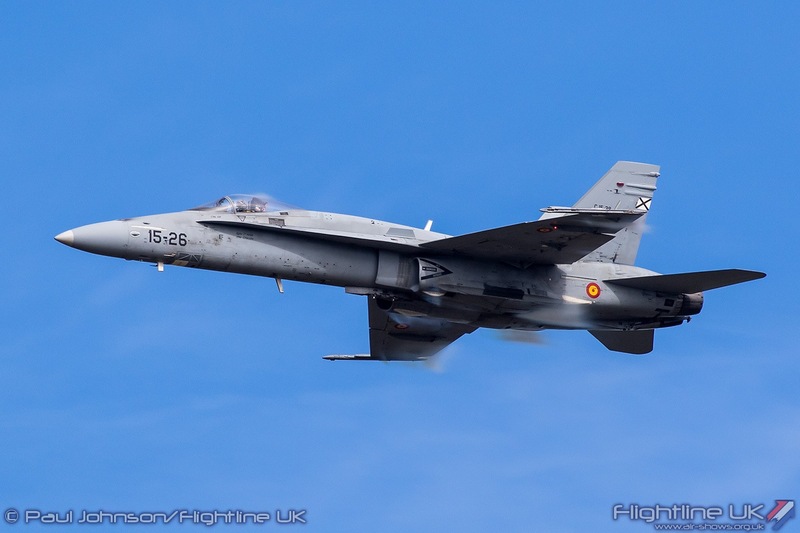 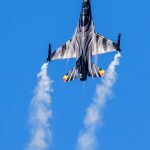 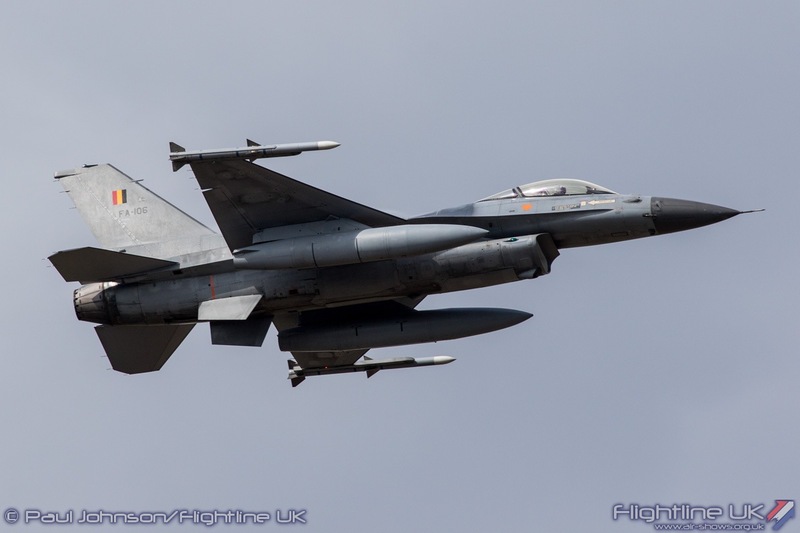 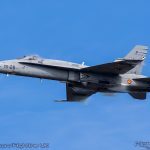 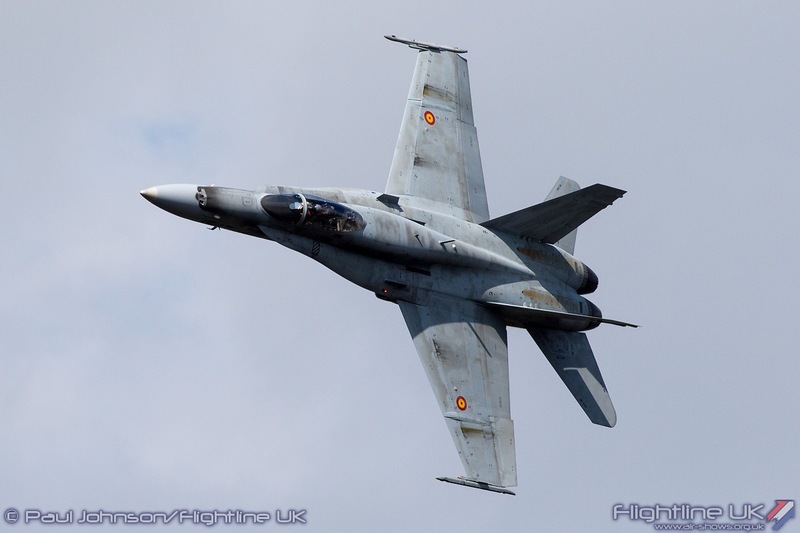 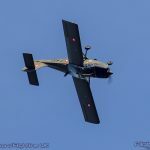 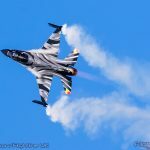 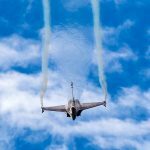 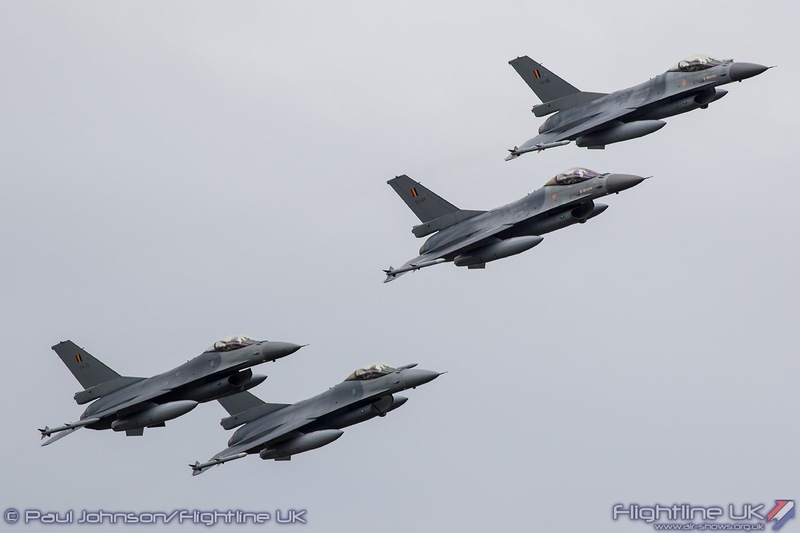 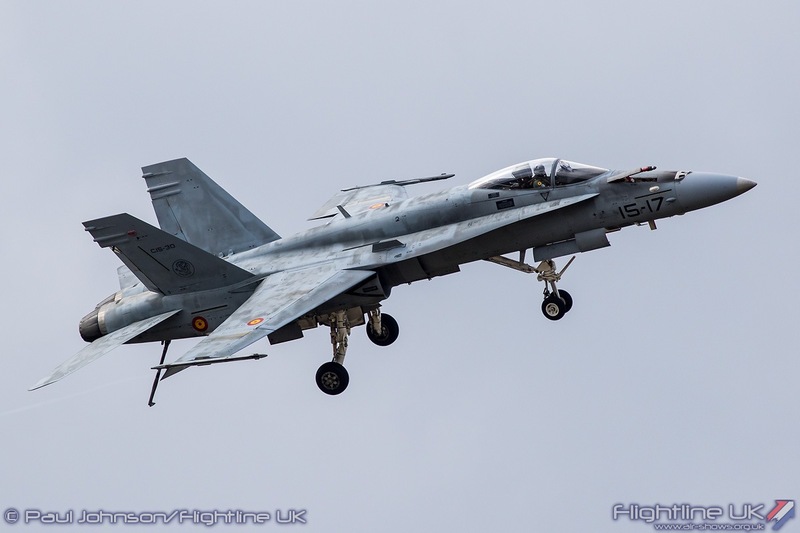 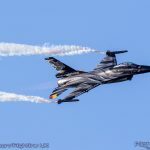 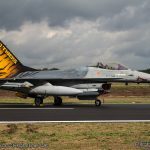 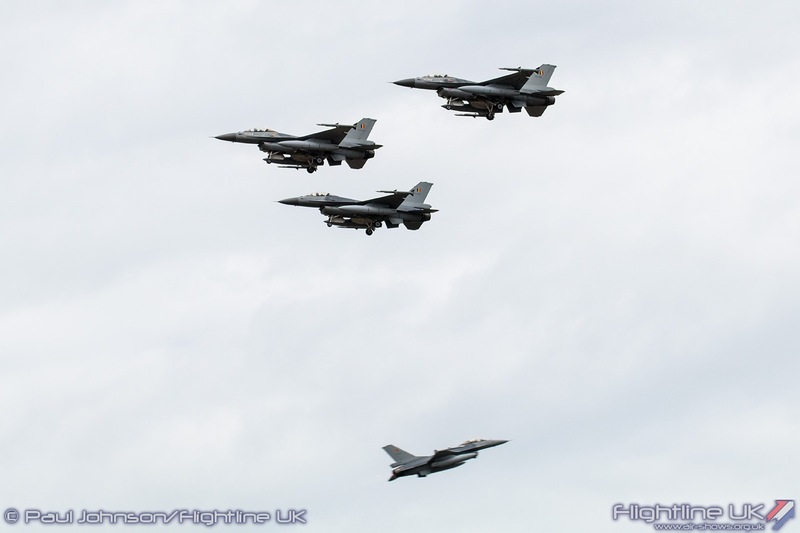 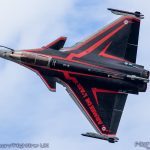 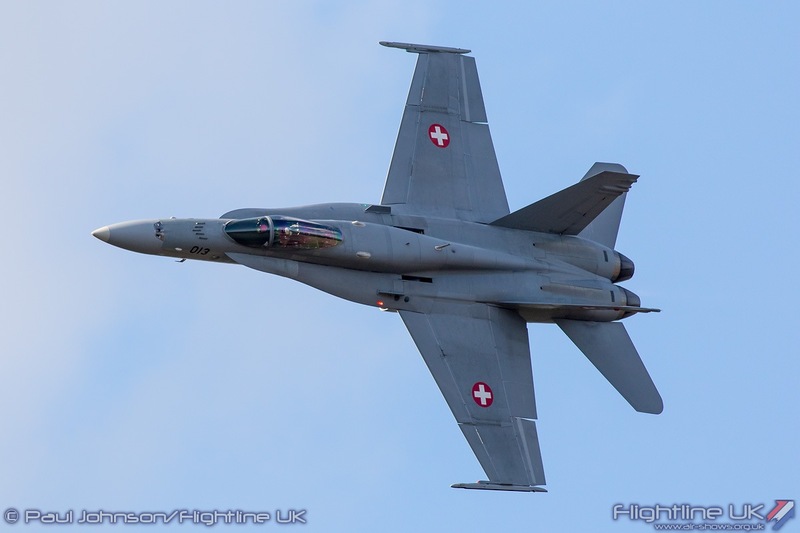 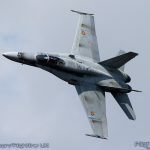 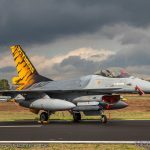 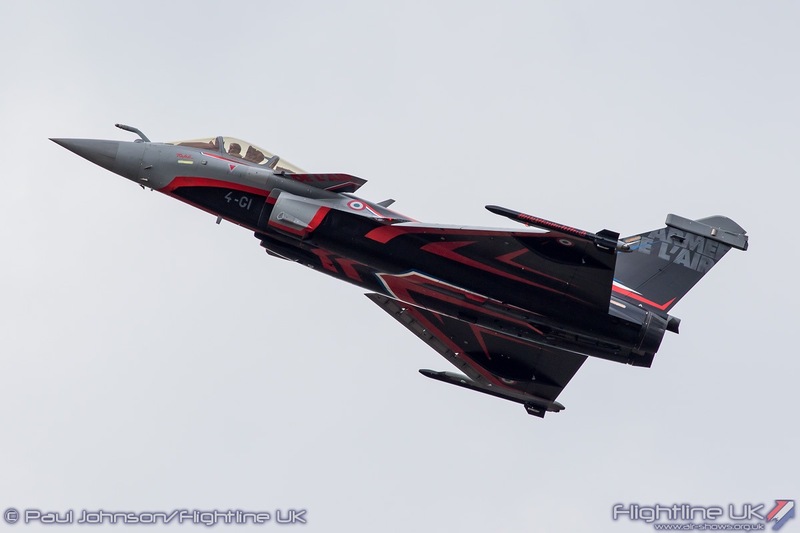 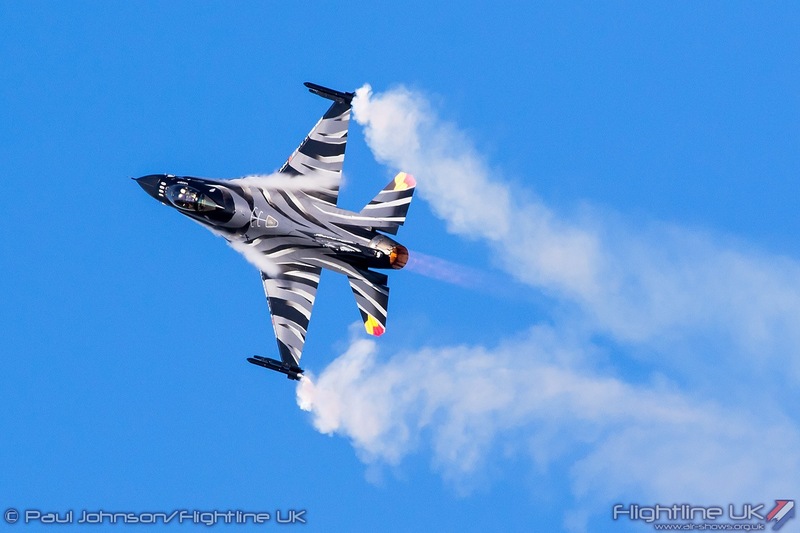 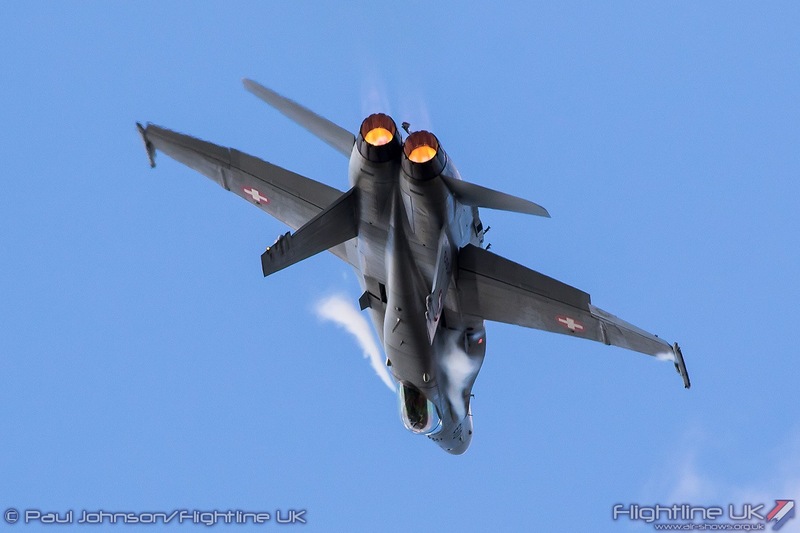 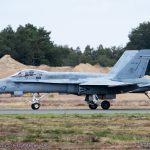 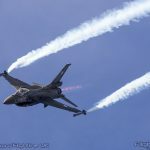 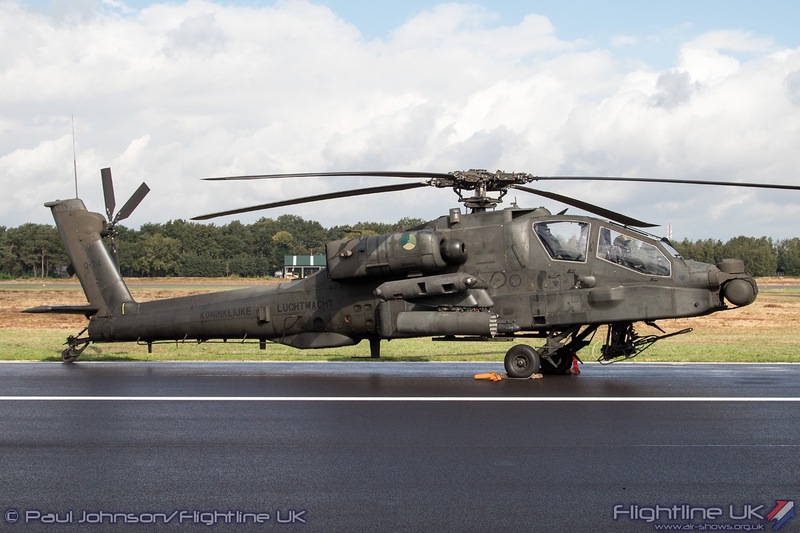 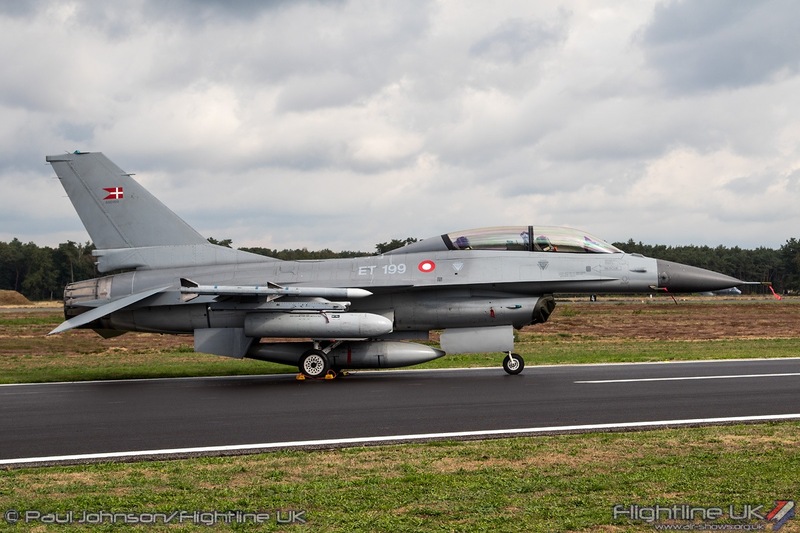 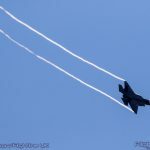 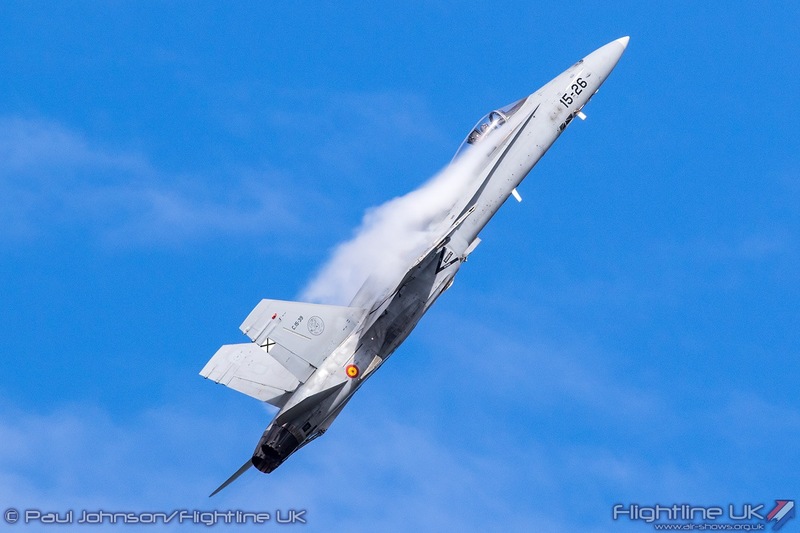 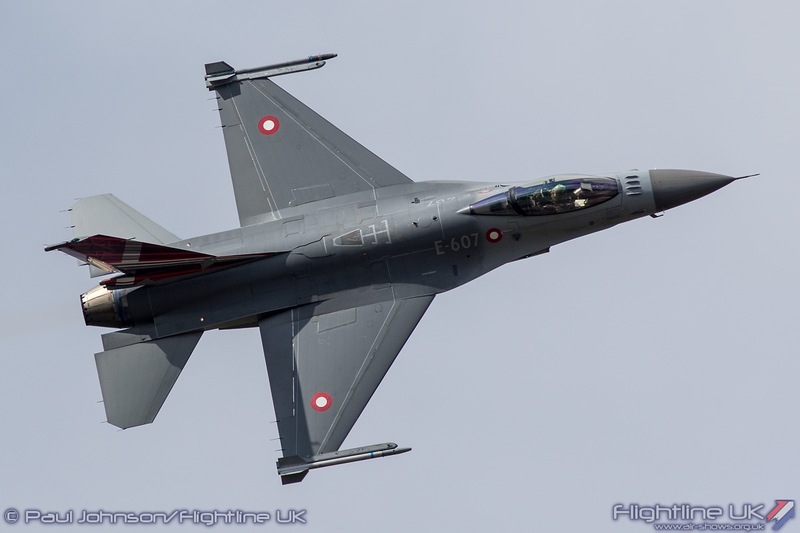 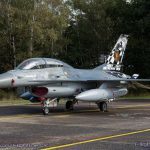 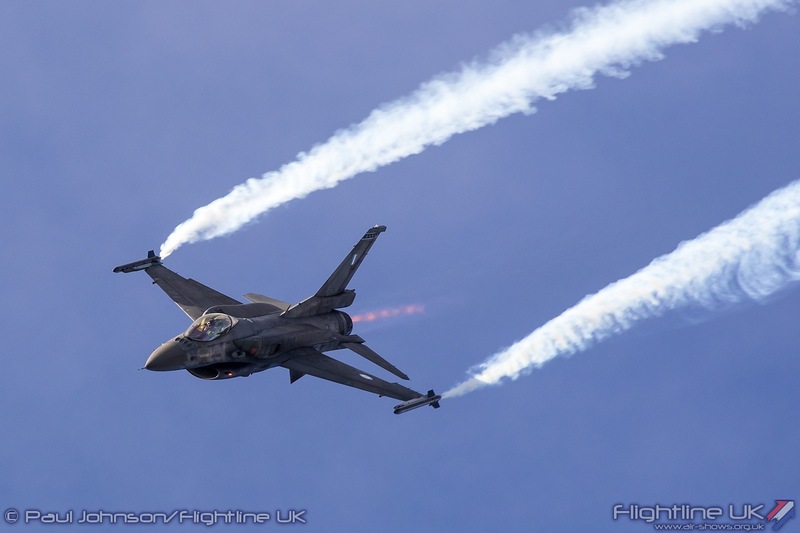 Belgium’s biennial military airshow, Belgian Air Force Days, returned in 2018 and was back at Kleine Brogel Air Base in the Limburg region of the country. 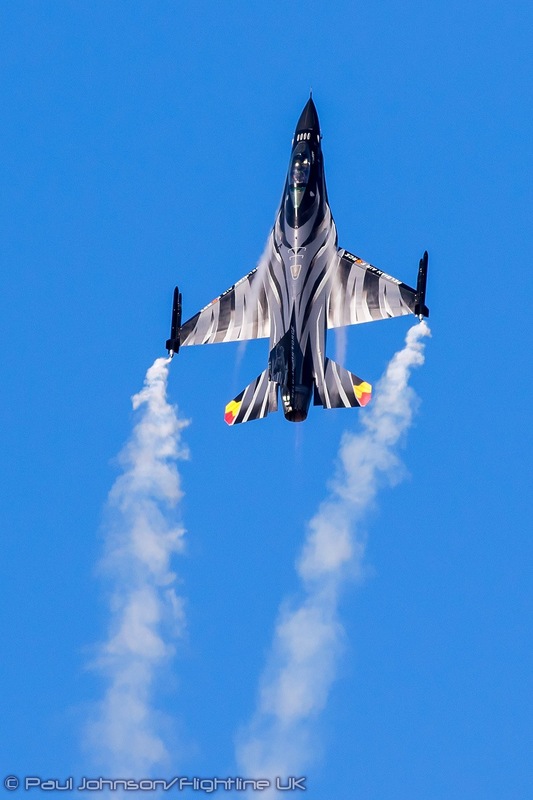 The show’s tagline was “Ready for the Future” with the event showcasing the current Air Force as well as glimpses of the possible future direction of the service. 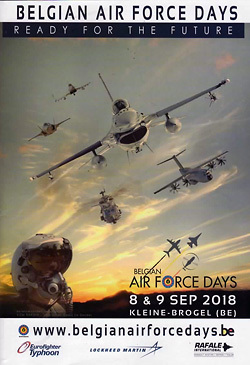 Air Forces Days is a major international events with contributions from a number of partner nations joining the Belgian military displays. 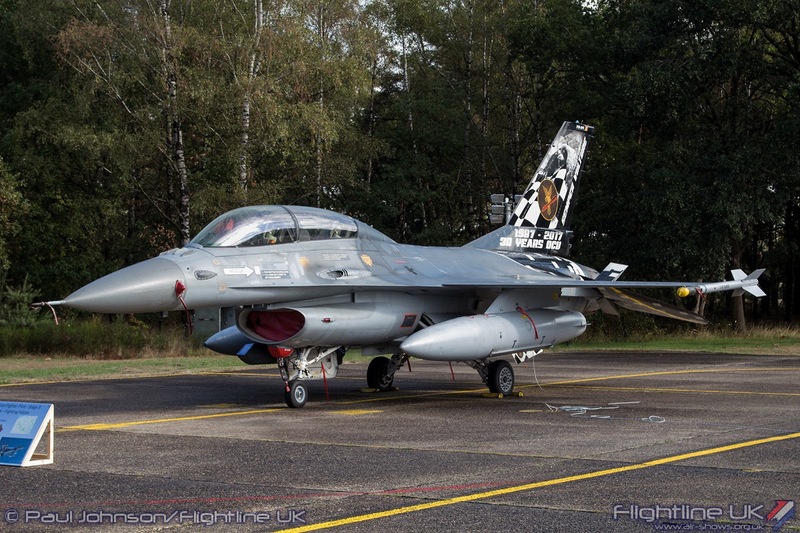 Kleine Brogel is one of two F-16 bases in Belgium and is home to the 10th Tactical Wing of the Belgian Air Force. 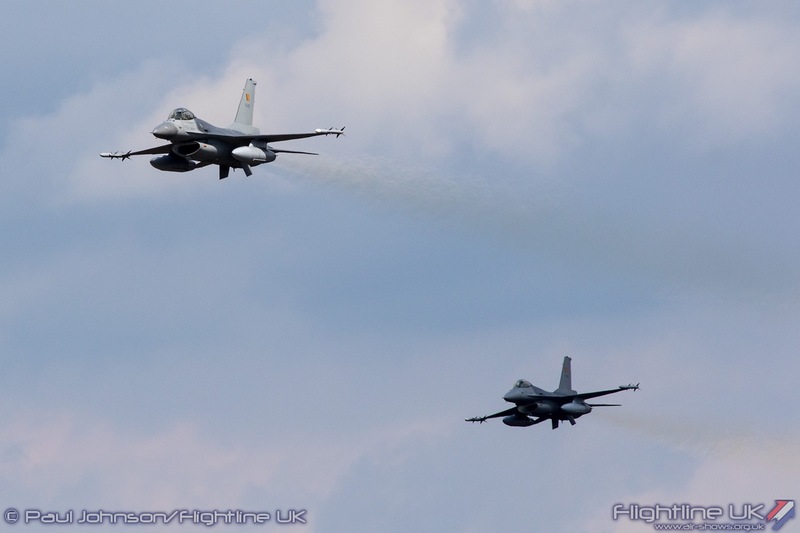 Two frontline fighter squadrons are based across the wooded dispersals together with the F-16 Operational Conversion Unit. 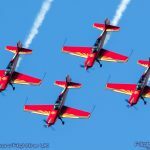 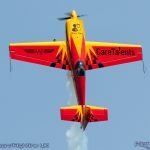 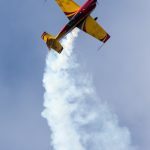 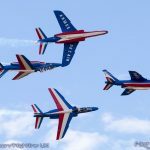 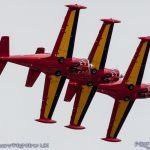 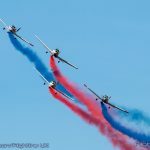 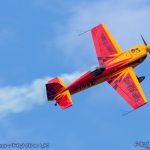 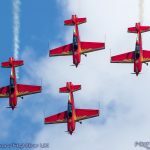 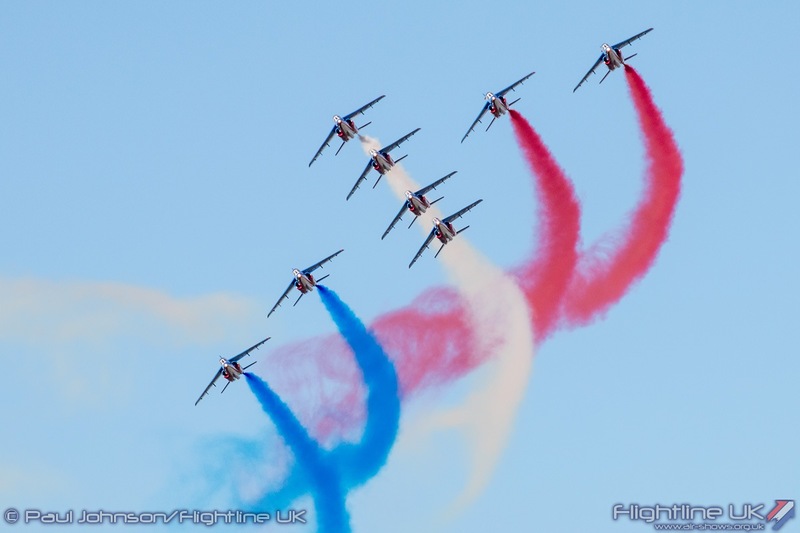 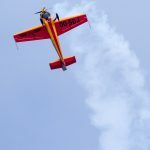 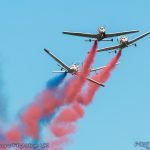 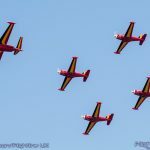 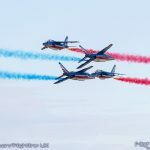 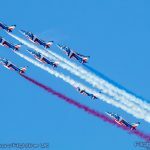 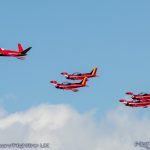 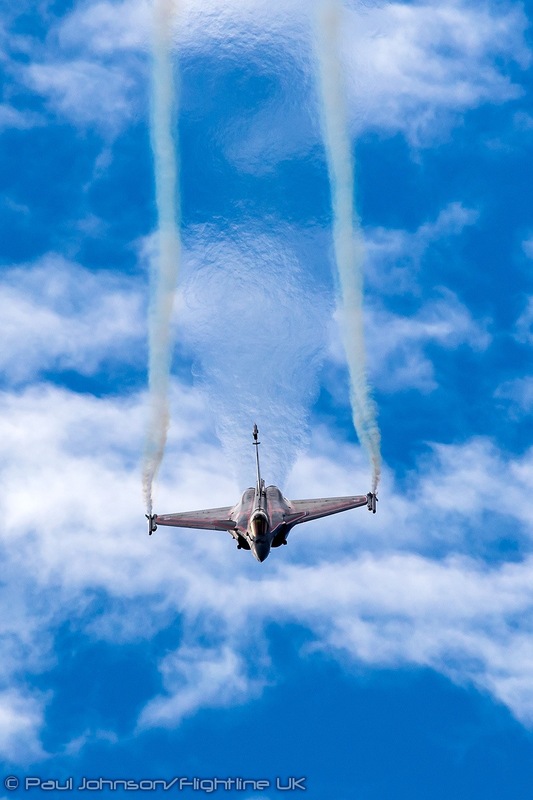 The base has a long association with hosting airshows and public events not only supporting Belgian Air Force Days, but also the nearby International Sanicole Airshow. 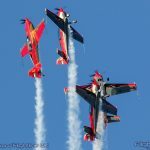 With the return of Air Force Days to KB, the Sanicole Airshow took a break for 2018 to support the Belgian Air Force in staging the event as they did in 2014. 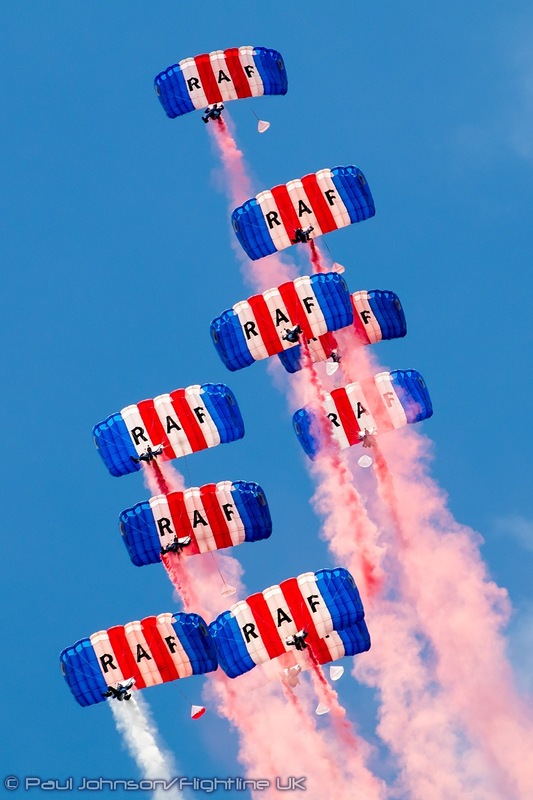 BAF Days is a two-day show held over the weekend. 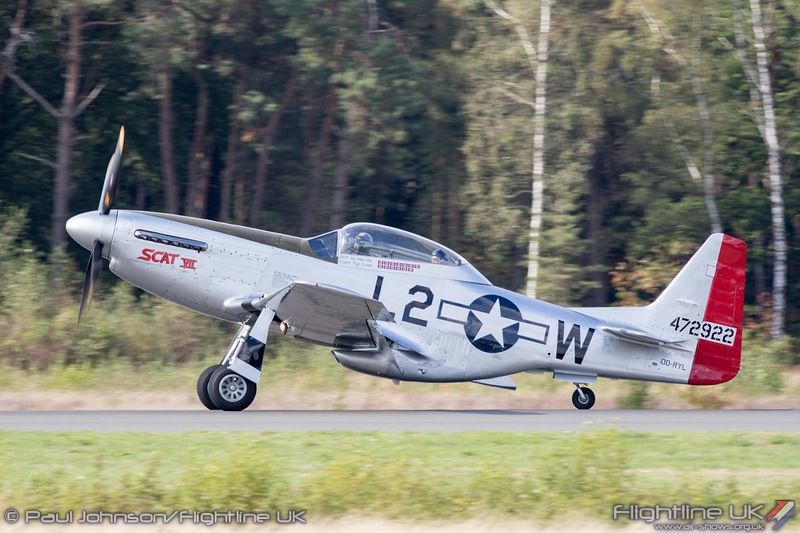 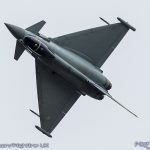 However, the Friday before the event is also opened as a “Spottersday” allowing enthusiasts to catch the final few arrivals and many of the display rehearsals in relaxed surroundings. 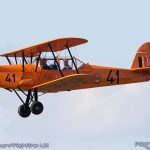 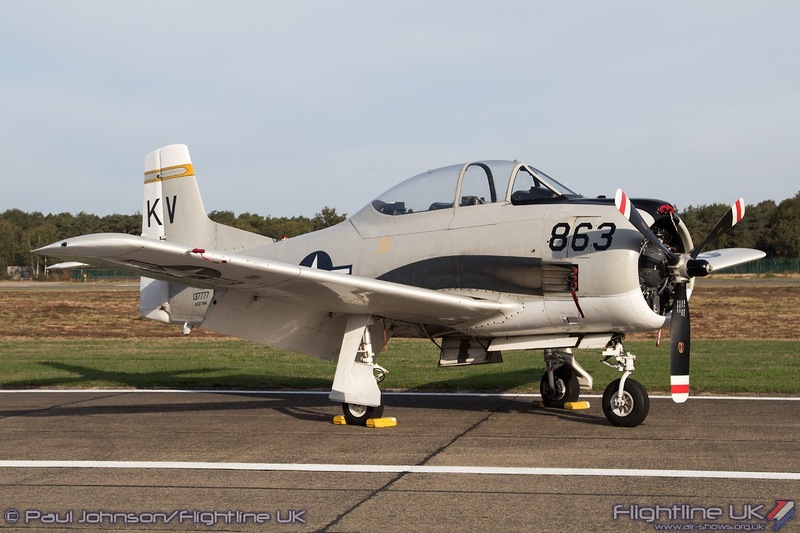 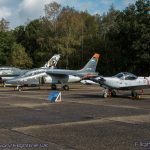 KB is a particularly popular venue with enthusiasts as the public areas look north with the sun behind you and also offers very close access to many of the aircraft arriving for both static and flying displays. 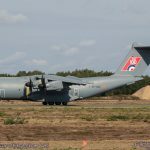 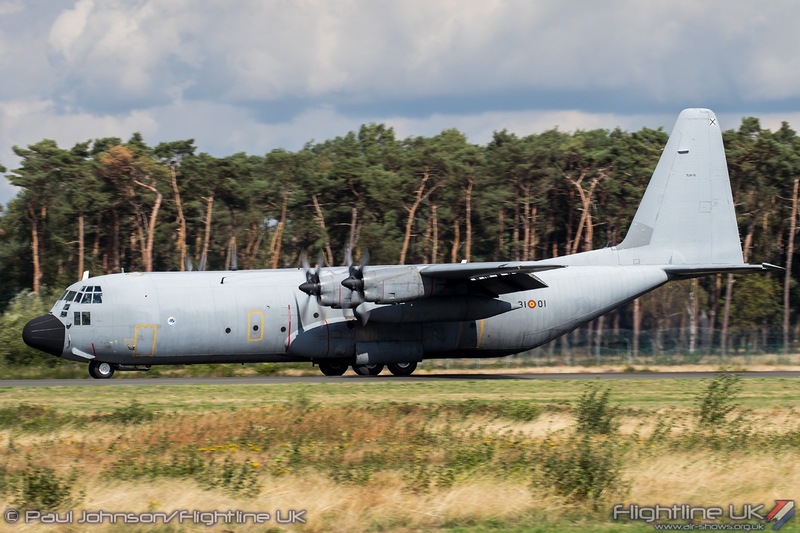 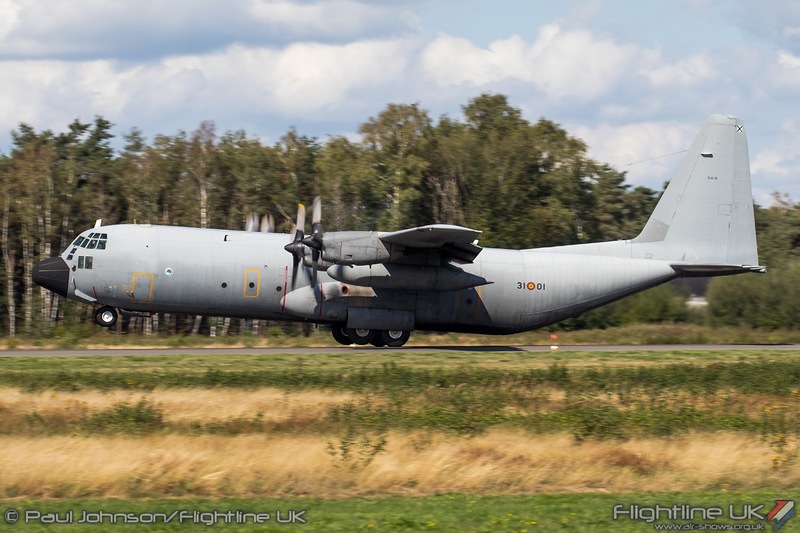 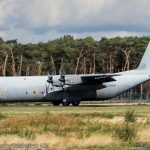 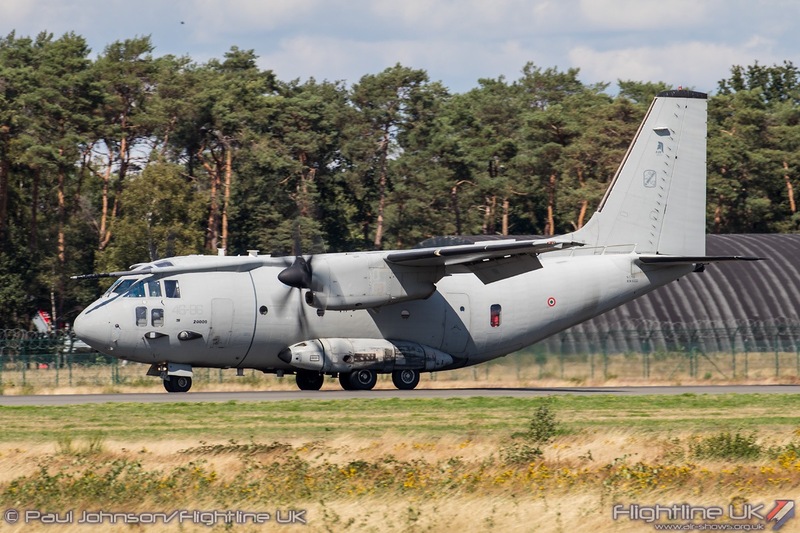 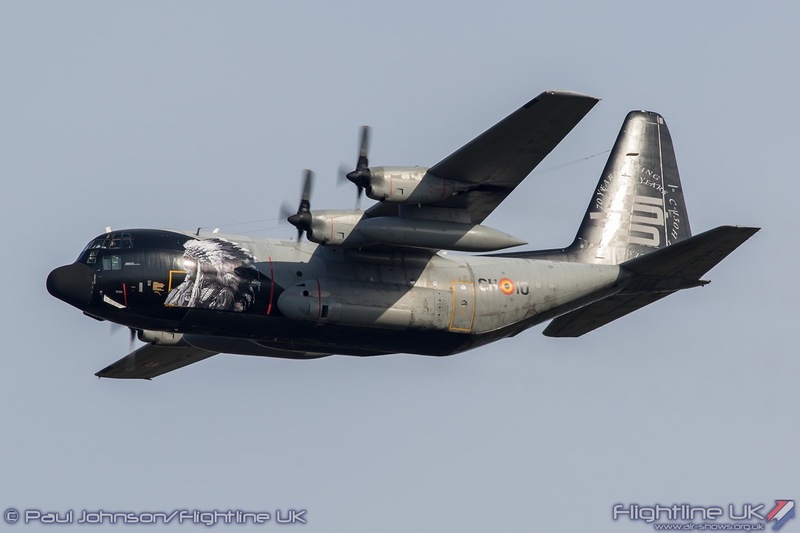 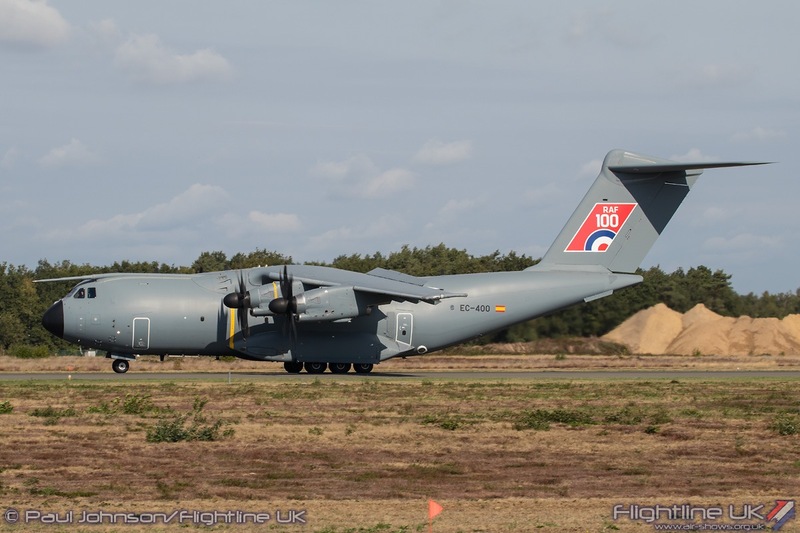 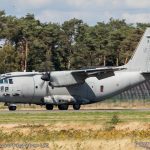 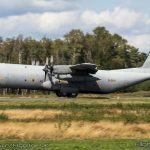 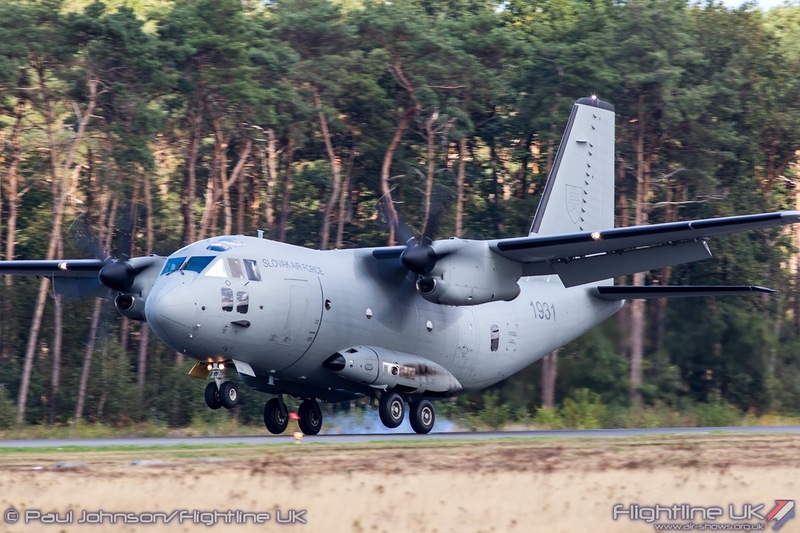 Spotterdays also often present a chance to catch the odd interesting support aircraft and this year those included a Spanish Air Forced Lockheed C-130H Hercules and an Italian Air Force Alenia C-27J Spartan. 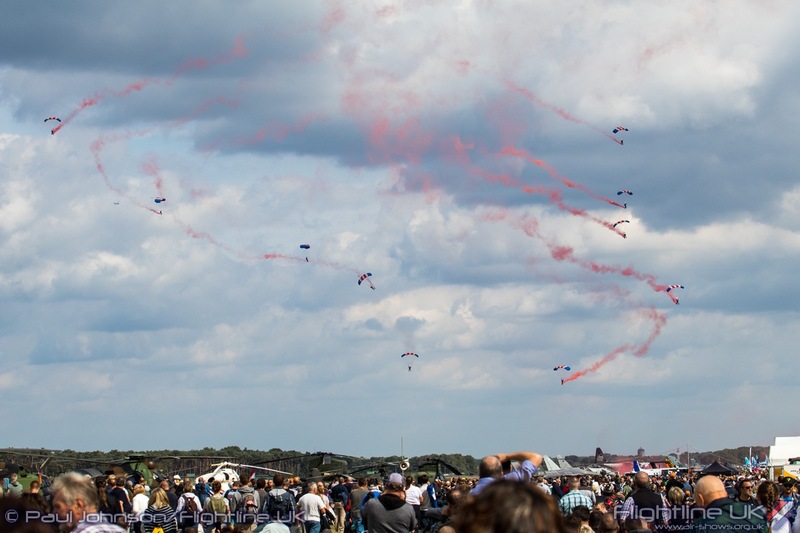 72,000 attended the main show days which is an impressive figure for the event. 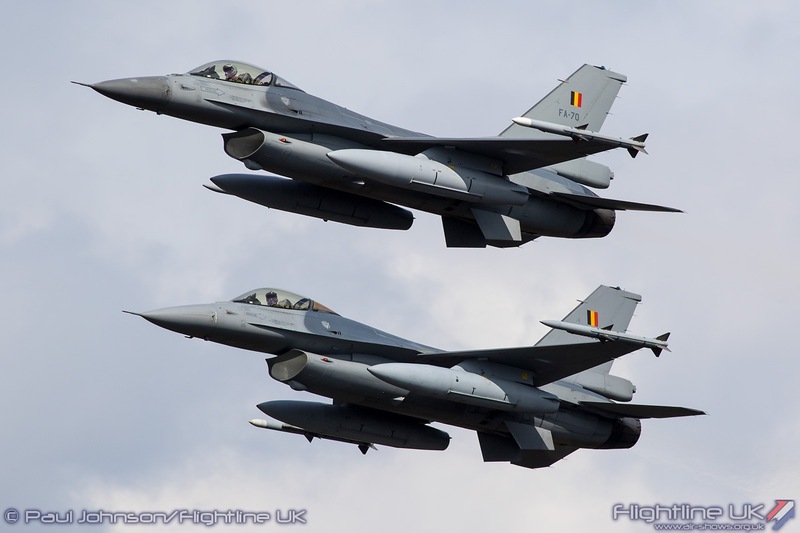 There is particular interest amongst the Belgian public into the current competition to replace the countries fleet of F-16s. 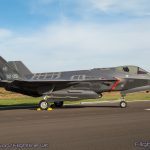 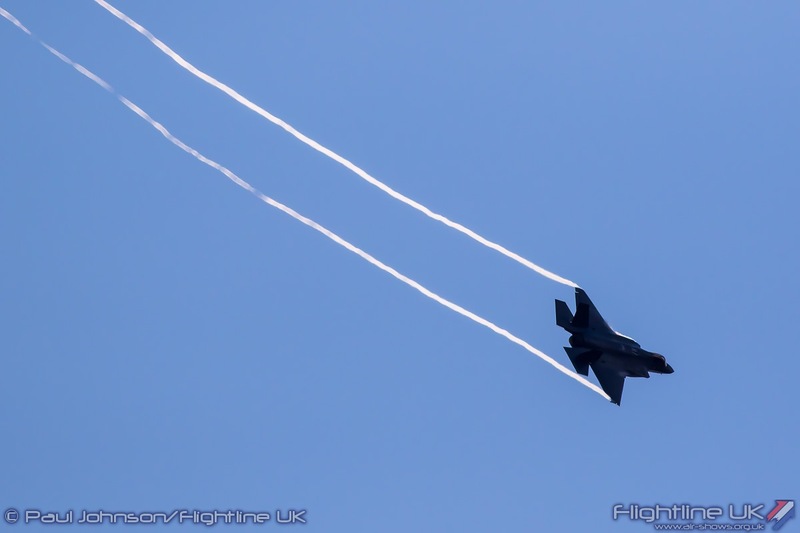 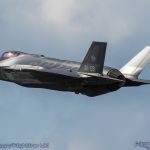 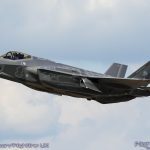 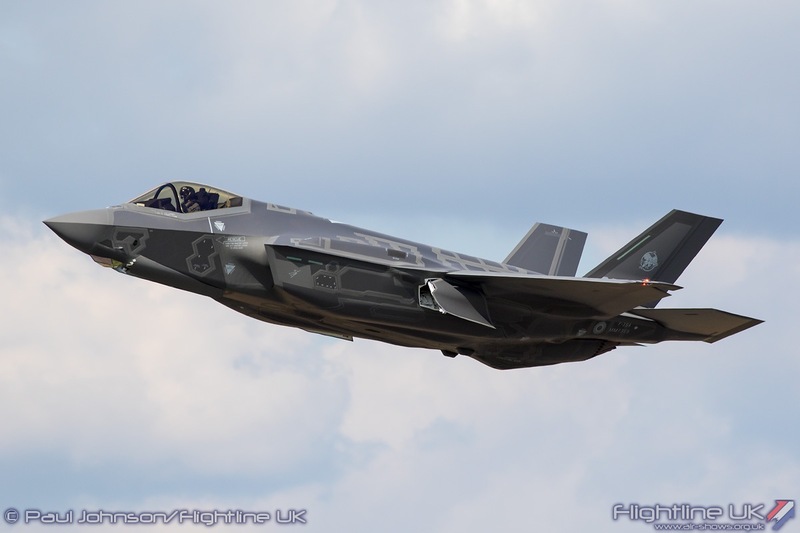 The shows public profile was significantly boosted when it was announced that an Italian Air Force would be sending one of its Lockheed Martin F-35A Lightning IIs for static display at the show. 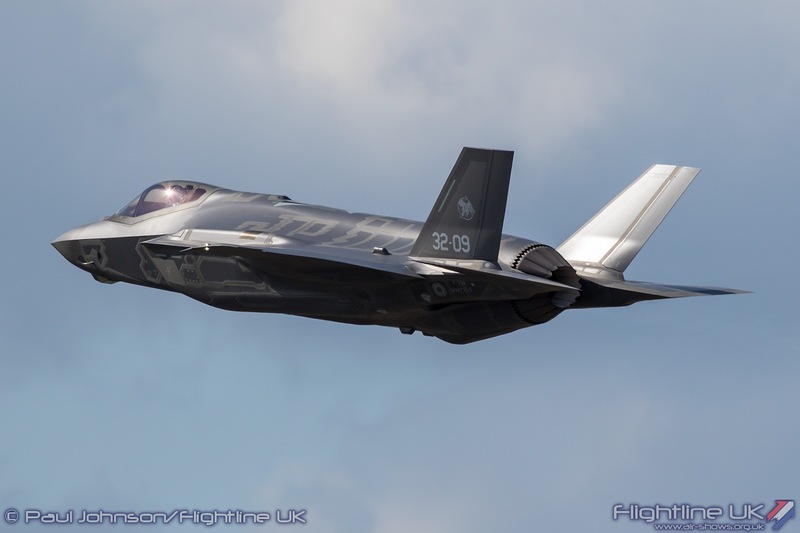 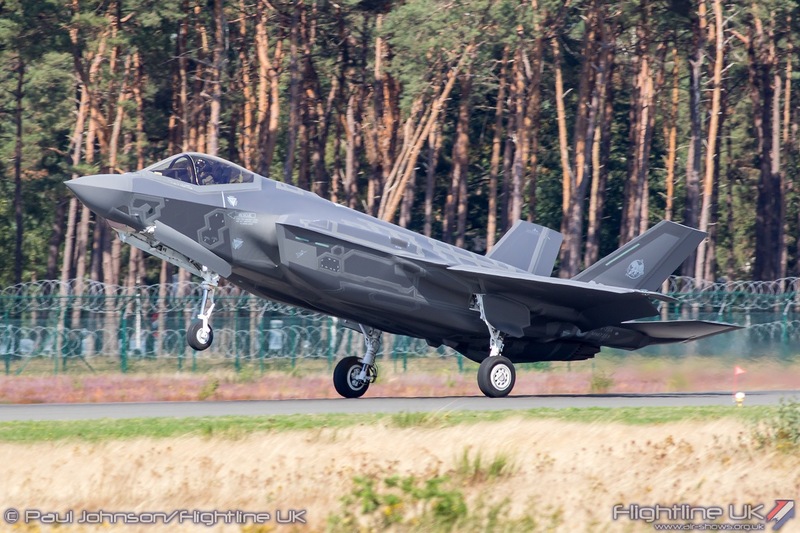 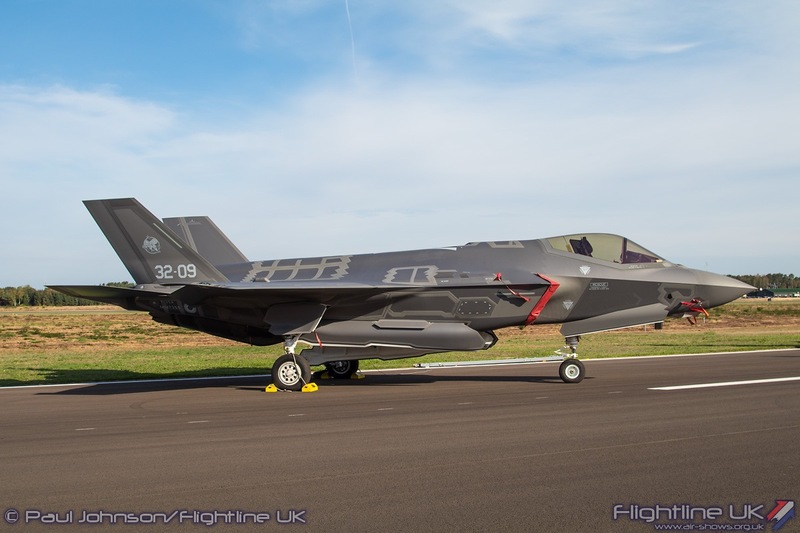 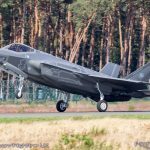 Remarkably considering how long the competition has been running, this was the first time an example of the F-35 had touched down in Belgium even though the aircraft has been flying in European skies for over two years. 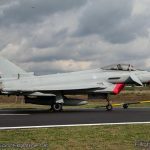 Its arrival was very much the star-turn of the Spottersday as it was the first time the Italians had exhibited their new fighter at an airshow. 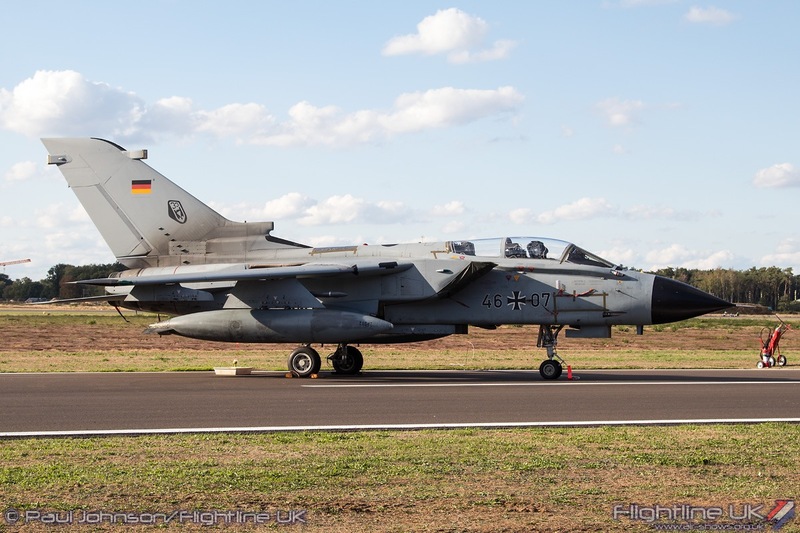 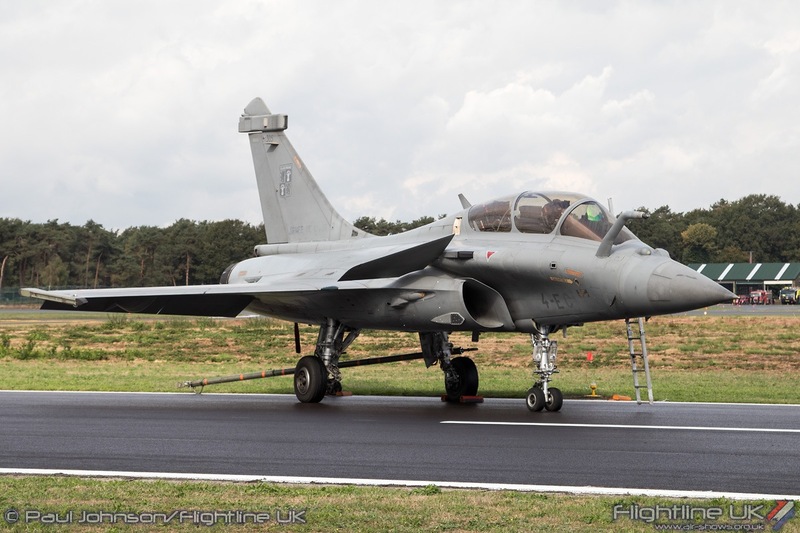 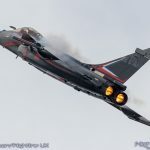 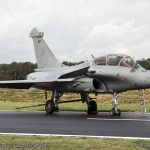 The sensitivities surrounding the aircraft meant that it was kept in the northside operations area during the weekend and was towed out to the static line each day to join a Royal Air Force Eurofighter Typhoon FGR4 and a French Air Force Dassault Rafale B. 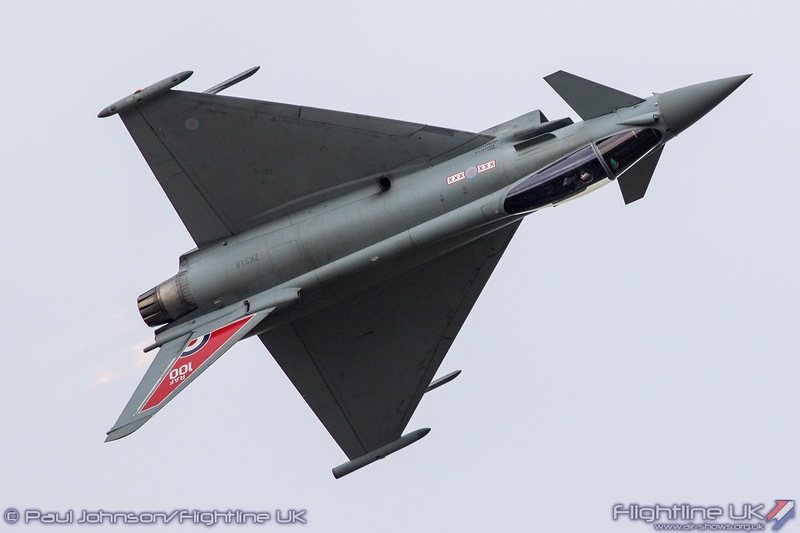 Further to the RAF Typhoon was a full scale replica brought to the show by BAE Systems. 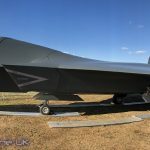 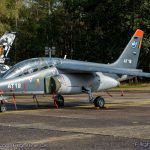 It was exhibited alongside the Project Tempest concept combat aircraft which was making its international debut at Kleine Brogel. 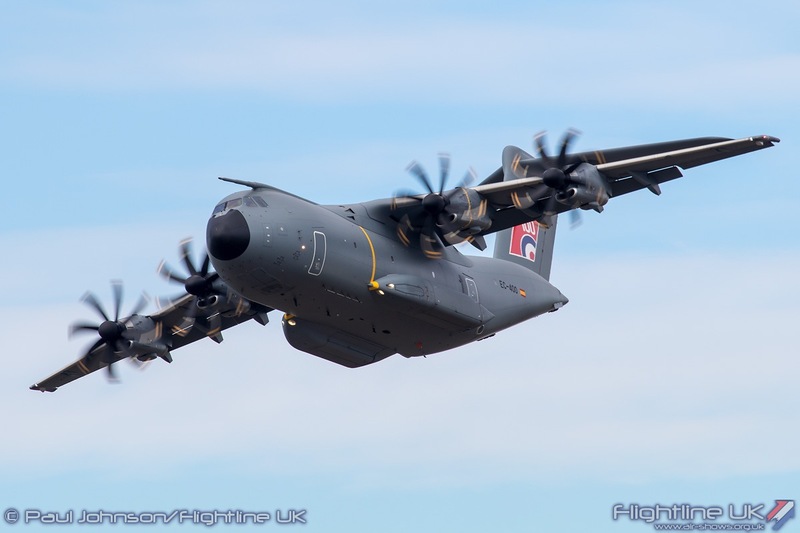 Another important aircraft for the future Belgian Air Force is the Airbus DS A400M Atlas. 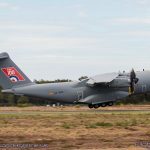 The A400M will be replacing the Lockheed C-130H Hercules from 2020 which was also on static display during Saturday. 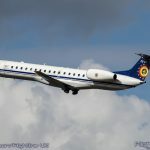 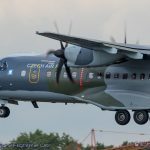 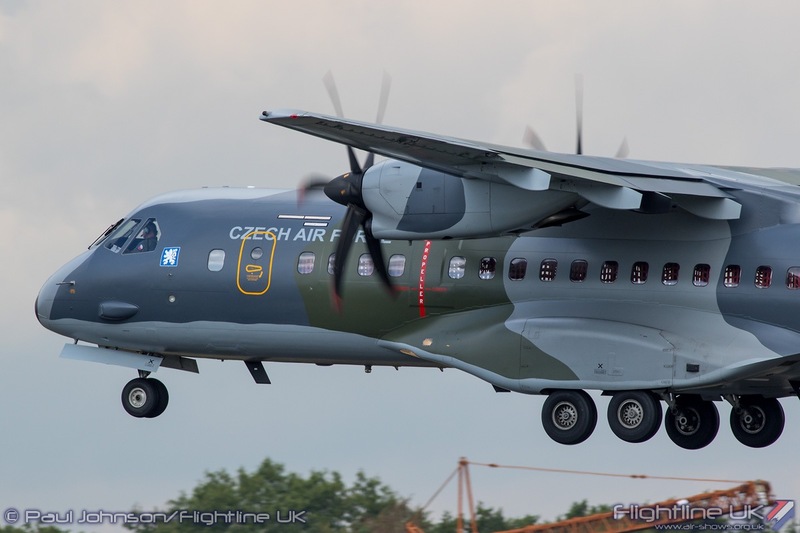 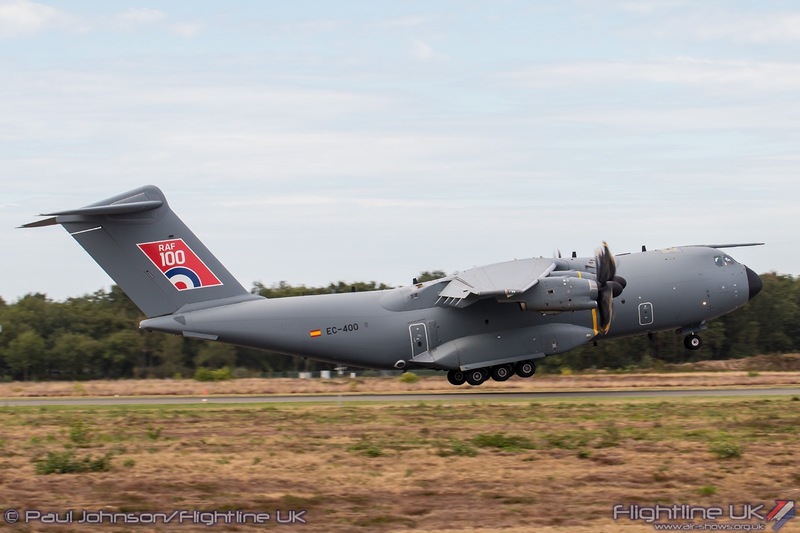 Belgium will receive seven examples of the new generation airlifter plus one additional aircraft which will jointly be operated with Luxembourg. 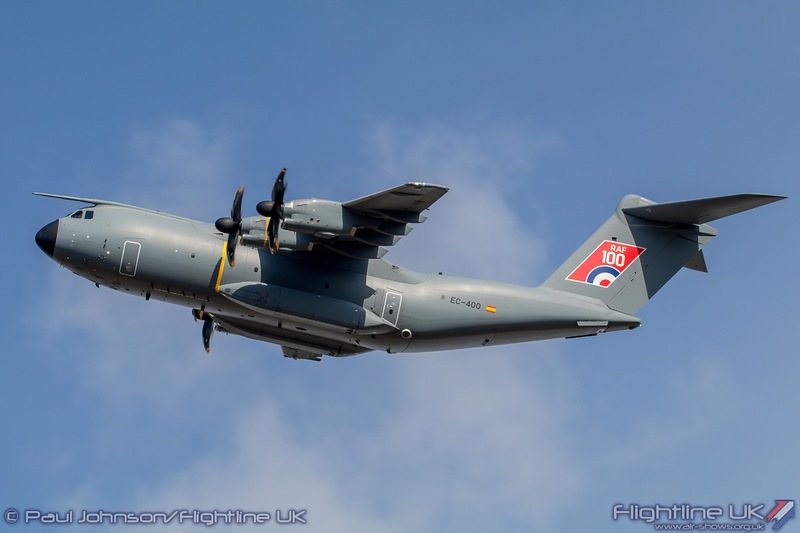 The A400M arrived for static display during Saturday’s flying programme and departed mid-afternoon on the Sunday maximising the aircraft’s exposure to the public. 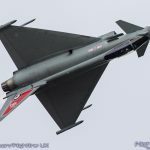 The example on display came from Airbus and was the same example seen at RIAT and Farnborough and still wore the RAF100 fin-flash. 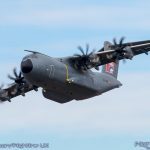 This particular airframe is currently involved in testing but is destined to be the final A400M delivered to the Royal Air Force. 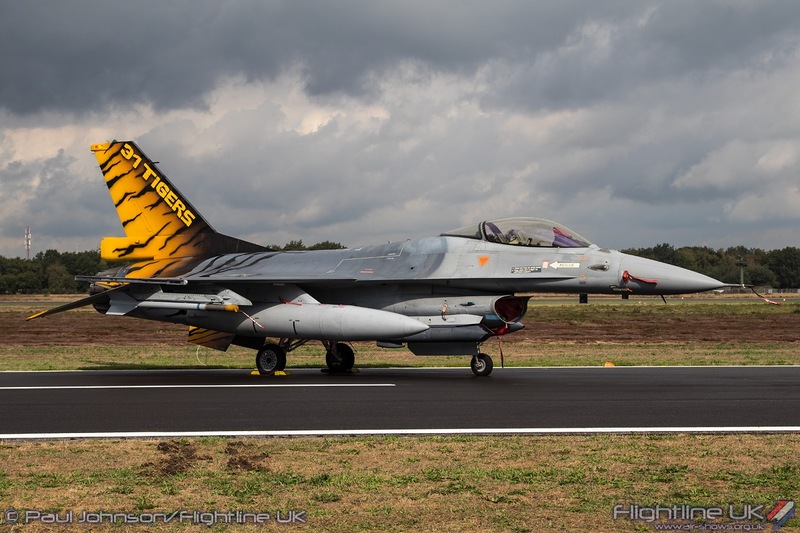 The current Belgian Air Force was well represented on the ground. 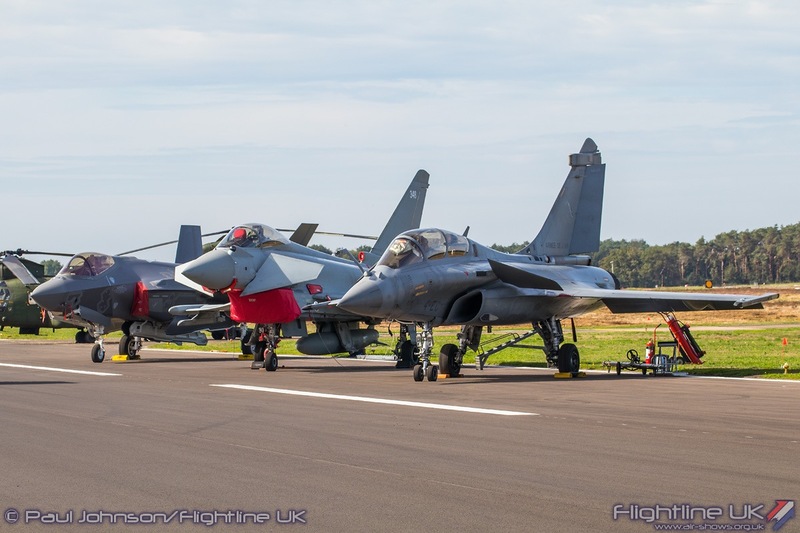 Visitors entering the showground from Car parks A & B were greeted by a line-up of some of the Belgian Air Force’s training fleet with examples of the SIAI-Marchetti SF260, Dassault Alpha Jet E (possibly making its last Air Force Days appearance) and a Lockheed Martin F-16BM Fighting Falcon from the KB based Operational Conversion Unit. 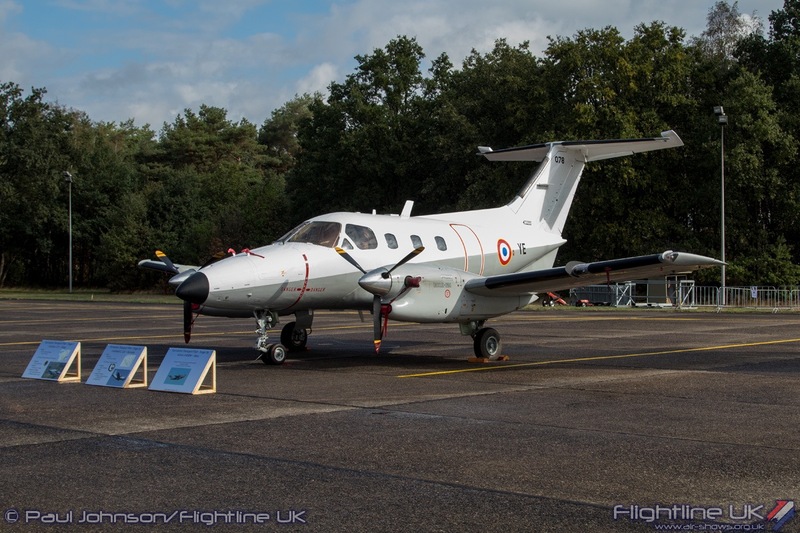 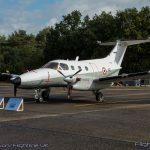 An unusual addition to that line-up was a Embraer EMB-121 Xingu from the French Air Force. 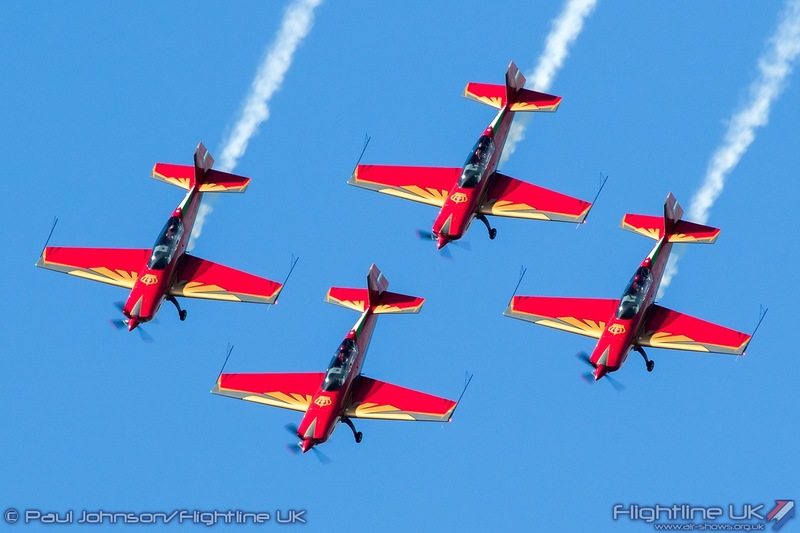 Belgian pilots streamed onto multi-engine types will fly the French Xingus to complete their multi-engined training. 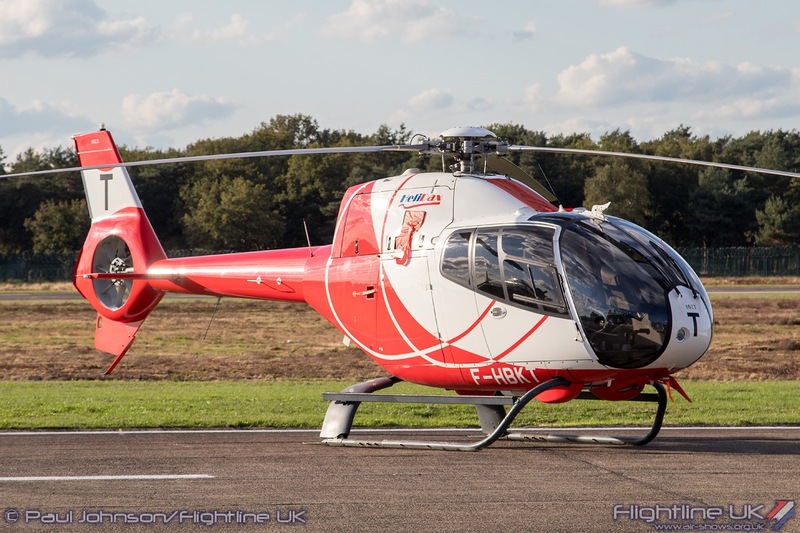 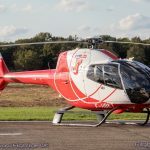 A further training type that didn’t make it into the line-up but was parked elsewhere was the Airbus Helicopters H120 Colibri from Dax, France. 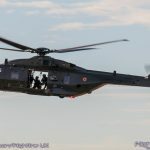 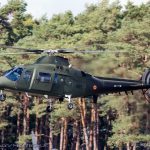 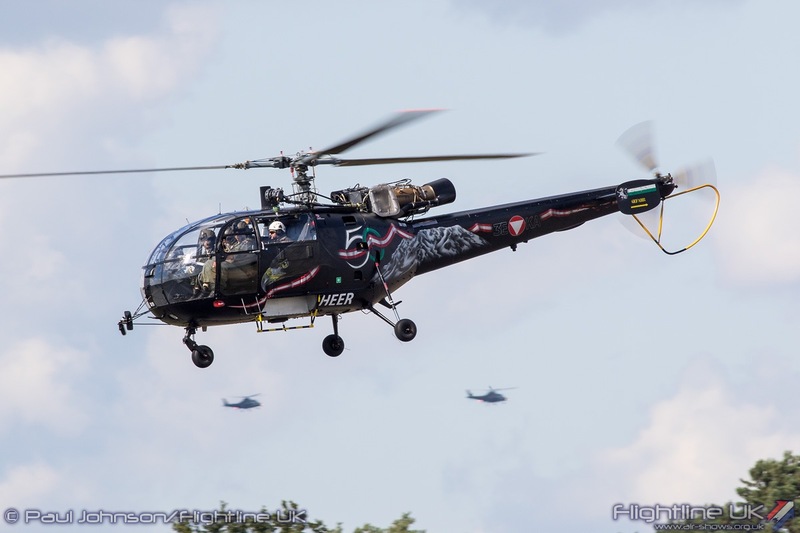 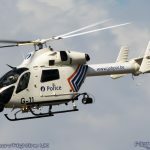 Owned by a company called HeliDax and on the French civilian register, these helicopters are used by train future helicopter pilots from the French Army and Belgian Air Force. 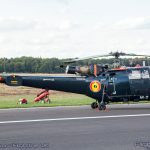 Joining the modern Belgian machinery was a selection of historic aircraft. 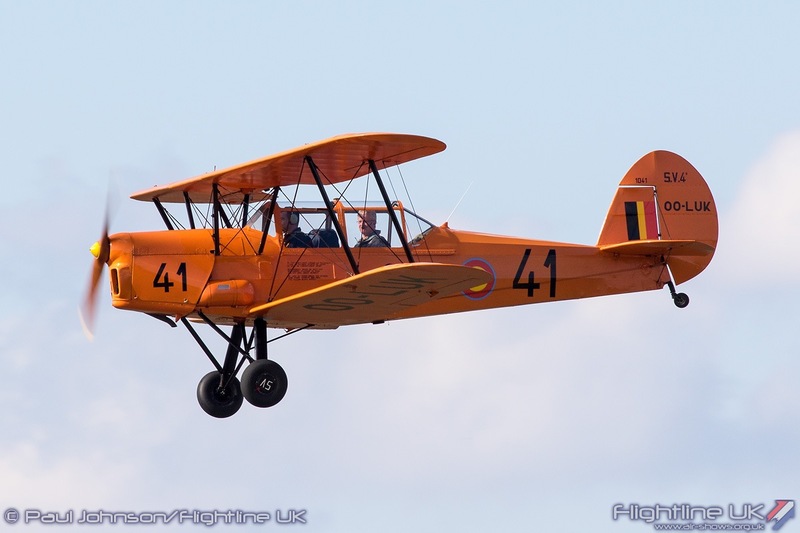 Perhaps the most famous Belgian aircraft is the Stampe SV4 biplane trainer. 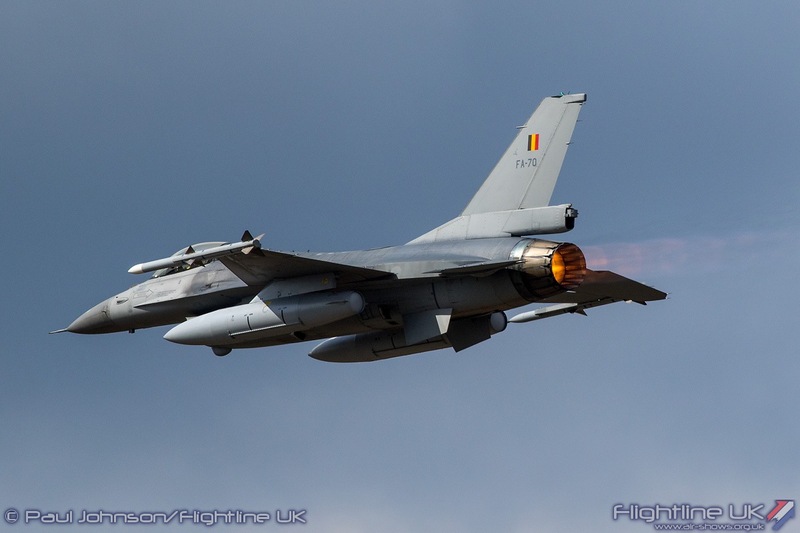 The aircraft served as the Belgian Air Force’s basic trainers for many years wearing bright orange colours. 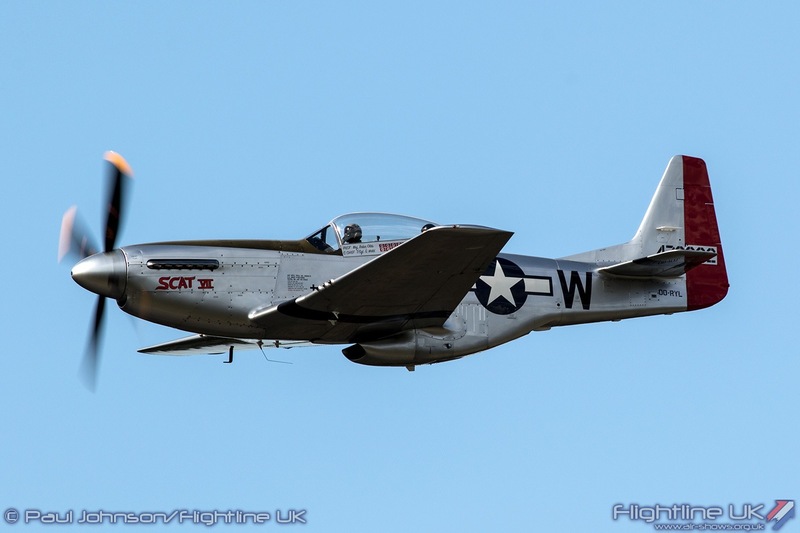 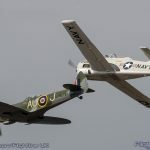 The North American Aviation company was well represented in the static displays with examples of the T-28B Trojan, TF-51D Mustang and the OV-10B Bronco. 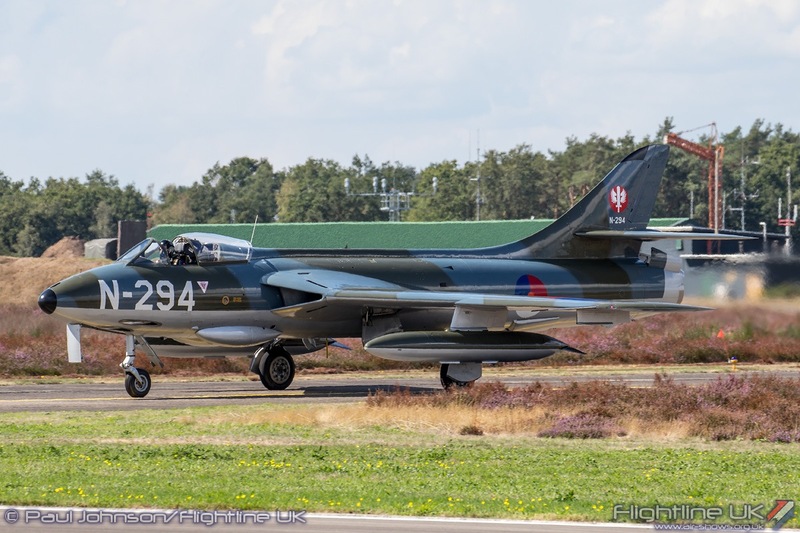 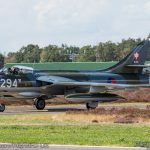 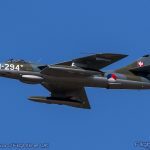 The Dutch Hawker Hunter Foundation made a welcome return to Belgium with their beautiful Hawker Hunter F6A G-KAXF. 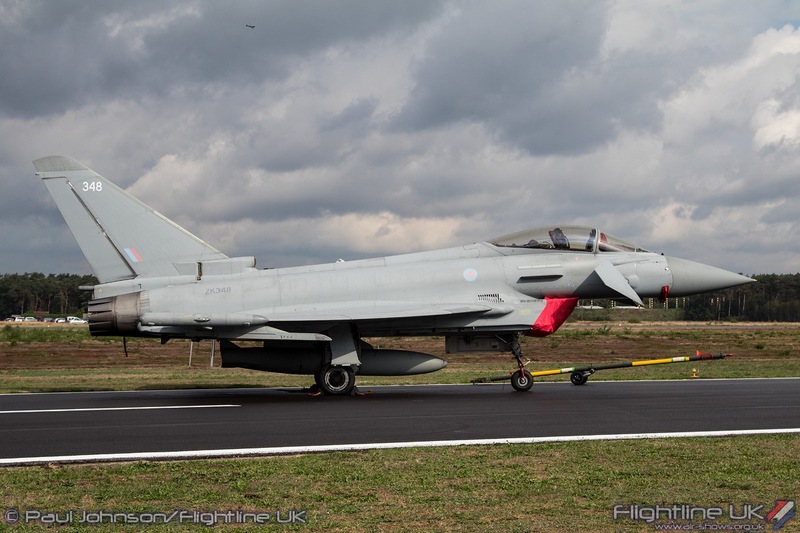 The aircraft arrived on Friday in great style creating the wonderful ‘Blue Note’ as it broke into the circuit. 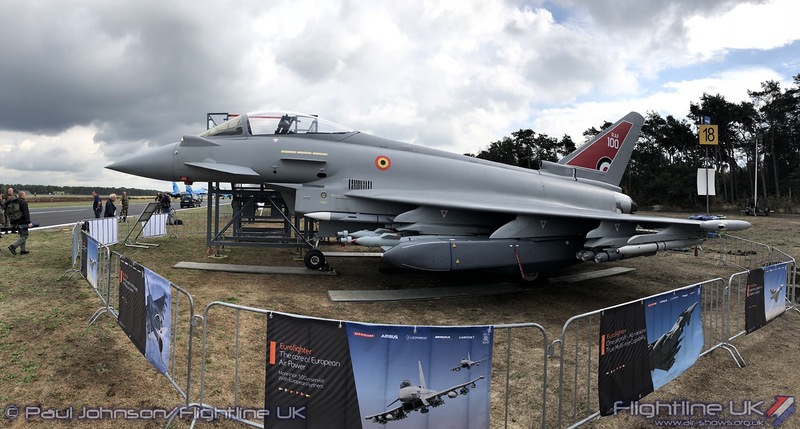 The international line-up in the static display may have been slightly smaller than that seen in 2014 but was full a quality. 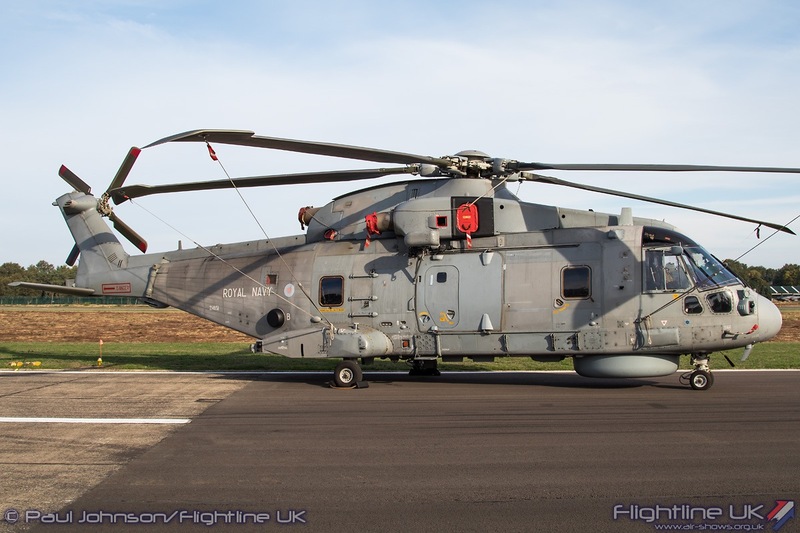 There were three examples of the Leonardo AW101 Merlin parked together. 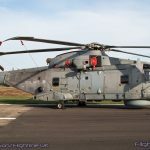 Most familiar amongst the three was a Merlin HM2 from the Royal Navy which was parked close to a Royal Danish Air Force Merlin Mk.512. 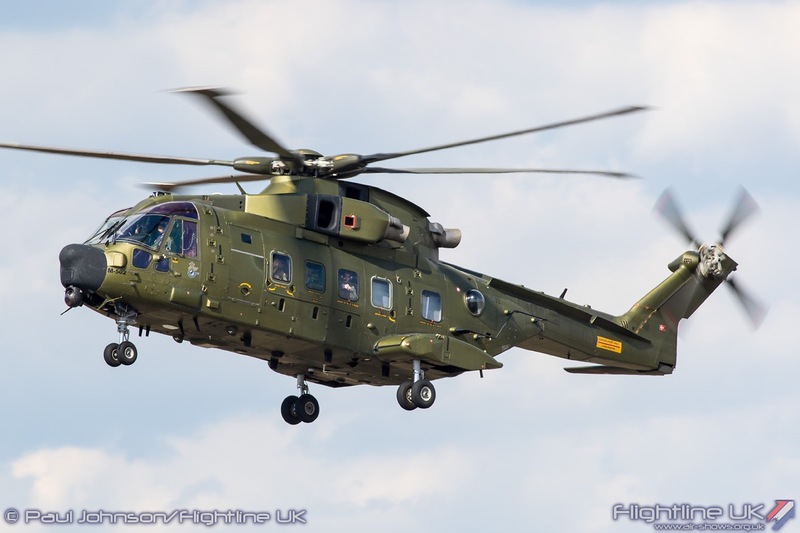 However, the star was the Merlin Mk.514 from the Portuguese Air Force making a very rare overseas appearance. 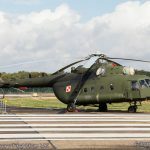 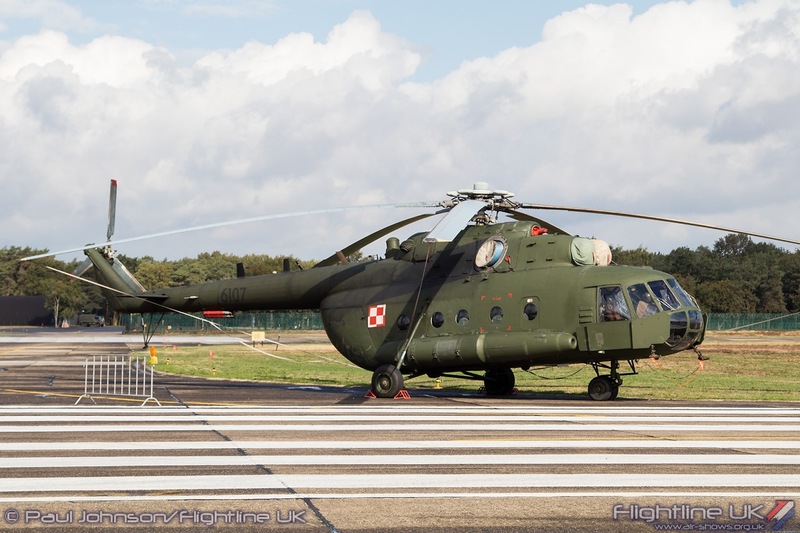 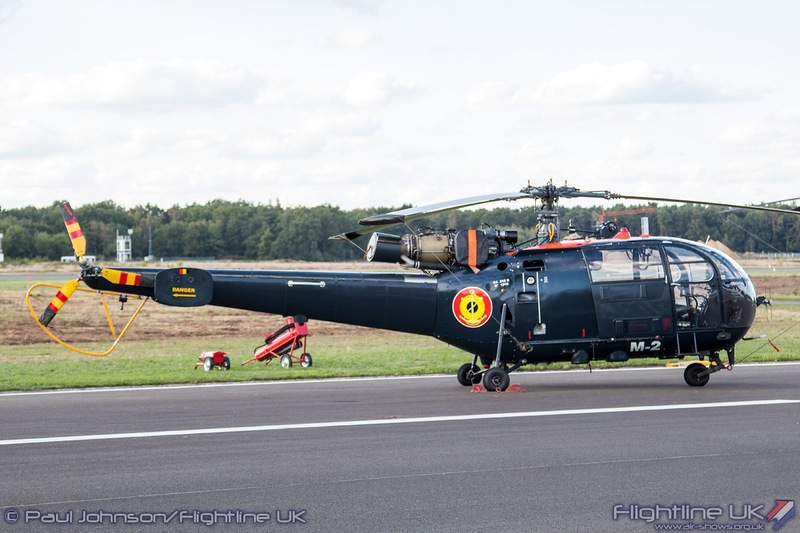 Another rare helicopter to catch the eye was a Mil Mi-17 Hip from the Polish Air Force. 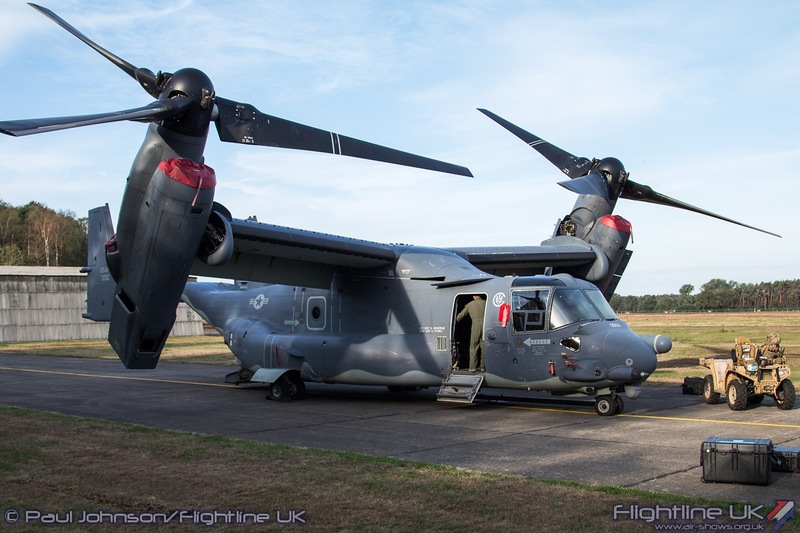 Air Force Days saw a first appearance in Belgium by a Bell/Boeing CV-22B Osprey from the United States Air Force. 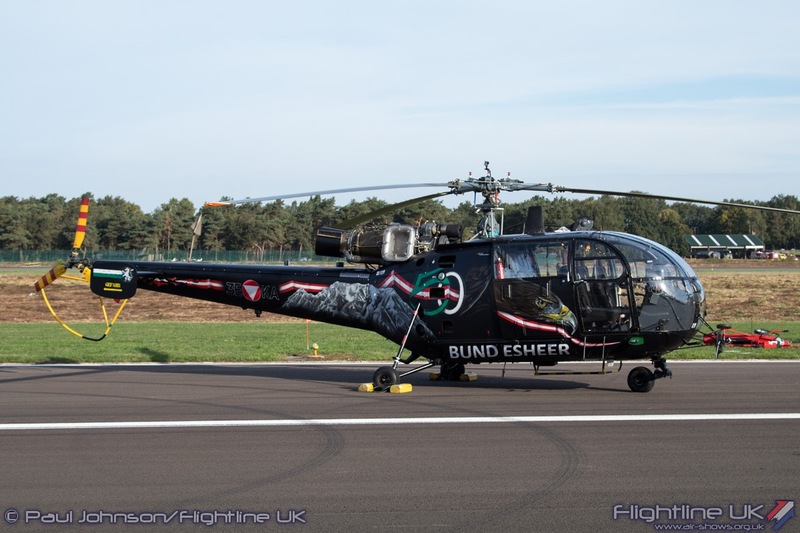 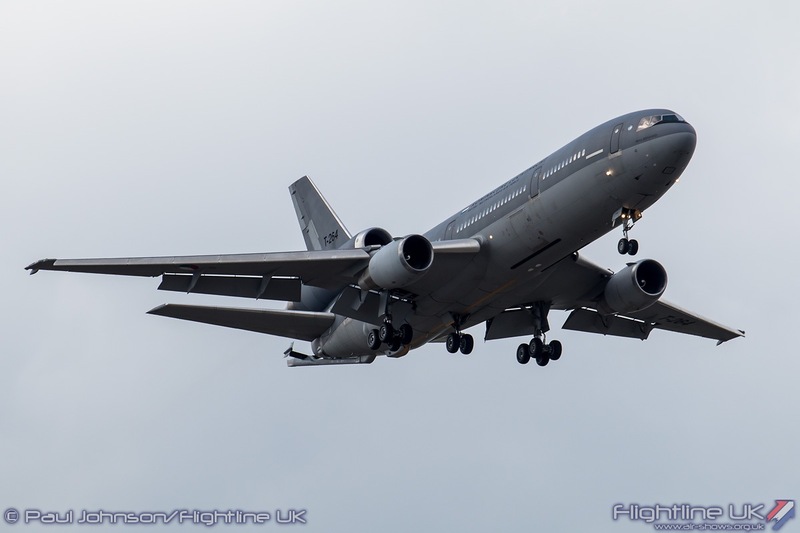 The aircraft came from the 7th Special Operations Squadron based at RAF Mildenhall in the UK. 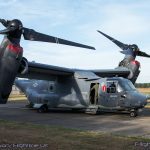 The tilt-rotor aircraft proved to be a very popular attraction for the crowd as it was open for cabin tours and was on show alongside some equipment used by Special Forces for combat search and rescue. 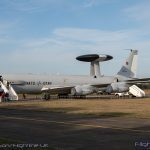 Also opened to the public was the North Atlantic Treaty Organisation’s Boeing E-3A Sentry. 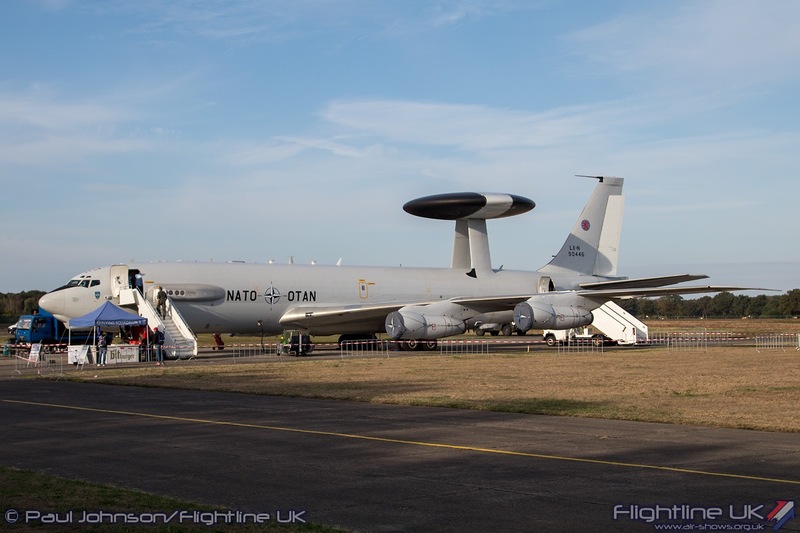 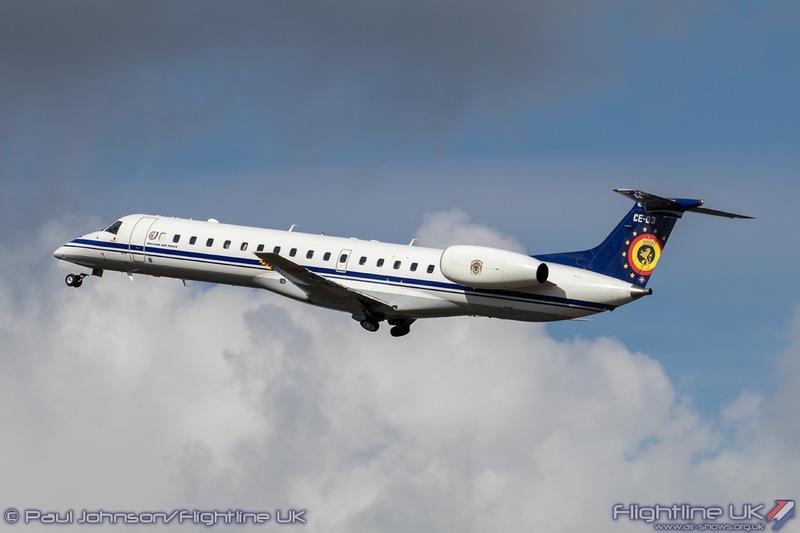 Based close to Belgium at Geilenkirchen in Germany, Belgium is one of 17 participating nations in the NATO airborne early warning and control force. 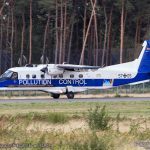 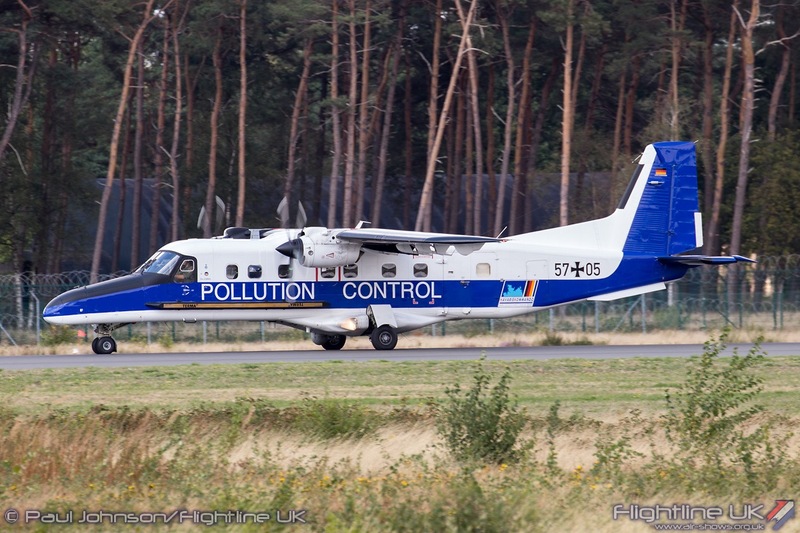 A further surveillance aircraft in the static display was a Dornier Do228NG from the Germany Navy which is used for fisheries patrol tasks. 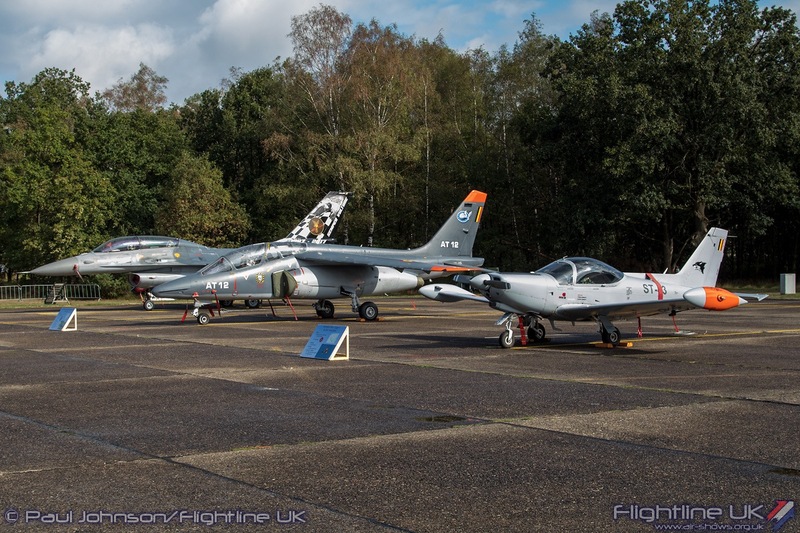 Completing the static displays were a selection of international fast jets. 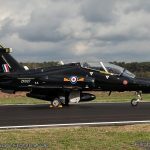 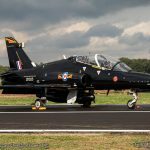 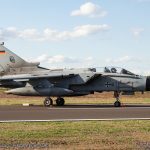 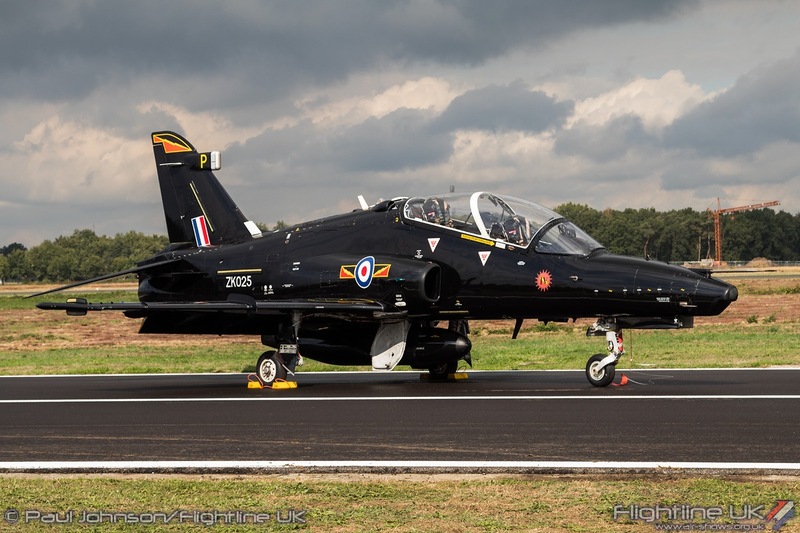 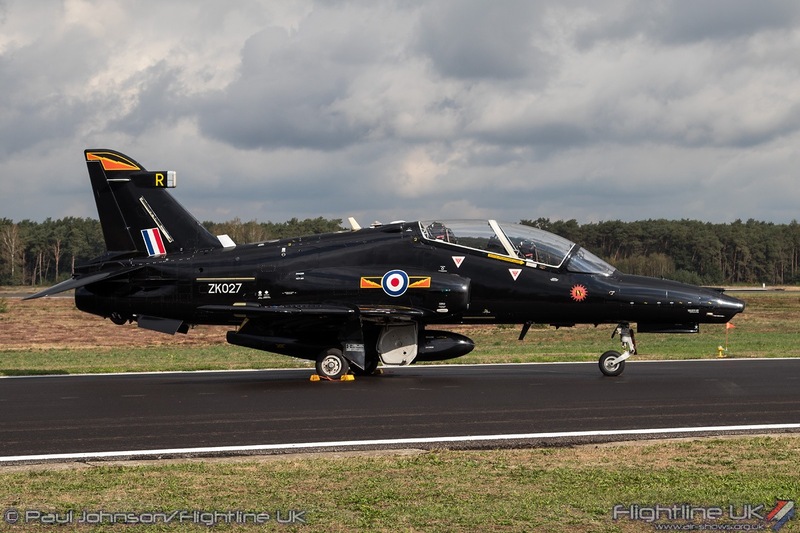 The Royal Air Force’s latest training squadron, No XXV(F) Sqn, brought two BAE Systems Hawk T2 jets from RAF Valley (though both aircraft still wore IV(R) markings) while the German Air Force was solely represented by a Panavia Tornado IDS. 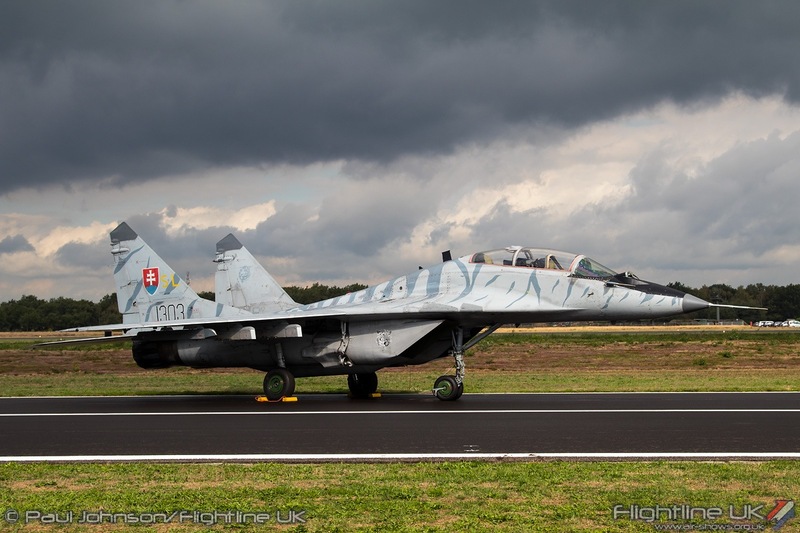 The Slovak Air Force often support the Air Force Days events and this year sent their tiger-striped Mikoyan-Gurevich MiG-29UBS Fulcrum for the static display. 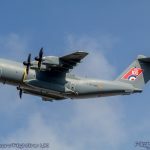 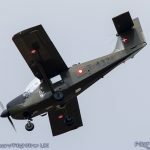 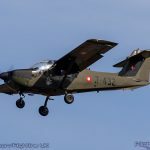 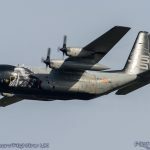 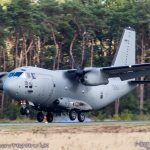 It was supported by one of the country’s new Alenia C-27J Spartan which appeared on the Spottersday Day but was parked on the north-side during the show. 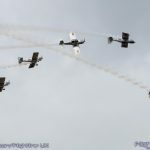 The flying displays at Air Force Days were the usual eight hour epics starting at 10am in the morning and closing just after 6pm in the evening. 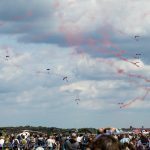 Supporting the flying displays was a dual-language commentary which was a first for Air Force Days, but something which has been a regular feature of the Sanicole Airshow. 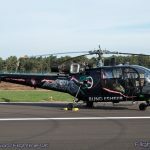 The Flemish speaking Chris Christiaens was joined by Indira Thackorie from Canada. 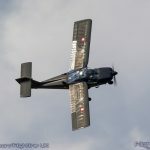 Indira brought a very different style to the event with plenty of enthusiasm, much more interaction with the audience and as with a lot of North American commentary, plenty of background music. 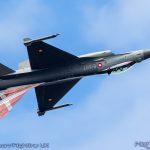 Indira was however new to the European airshow scene and on occasion seemed a little under-prepared which would have made some die-hard enthusiasts whince! 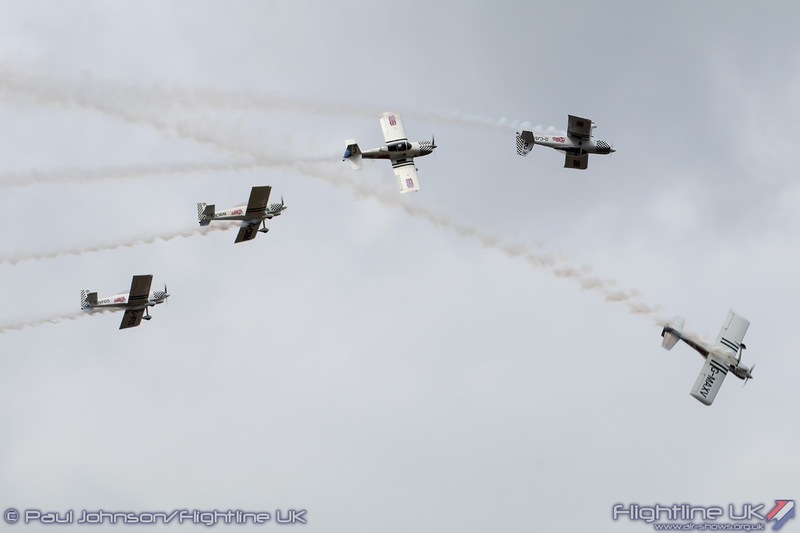 The flying display itself was very varied. 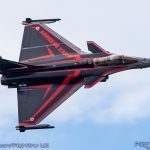 With so many big anniversaries in 2018 elsewhere in Europe, Kleine Brogel did not attract as many national jet team teams as it did in 2014. 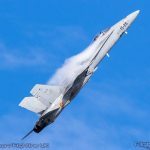 There was also no hour long “Air Power” demo so there was more time for solo jets, mixed heritage formations and also civilian acts in the flying display. 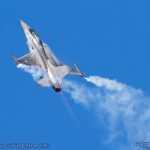 Noticeable this year was the lack of flares being fired during the displays. 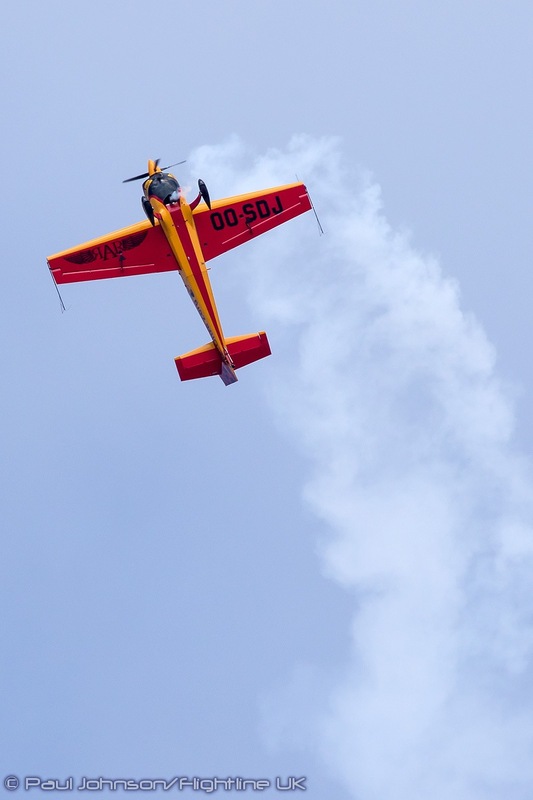 Unfortunately, an incident with flares in 2014 which damaged a number of vehicles and also the amount of debris found following a practice displays on the Thursday this year led to the decision not to allow flares during the displays. 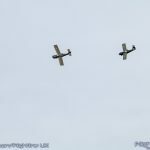 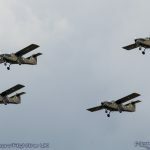 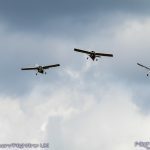 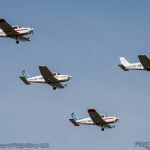 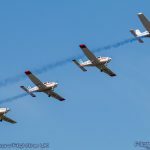 No Belgian airshow would be complete without the Victors Formation Team from Ursel Flying Club flying four Piper PA-28 Cherokee aircraft. 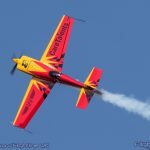 They were joined by two Belgian based Extra 330SC solo displays flown by Stijn De Jaeghere (aka The Flying Nurse) and Kristof Cloetens. 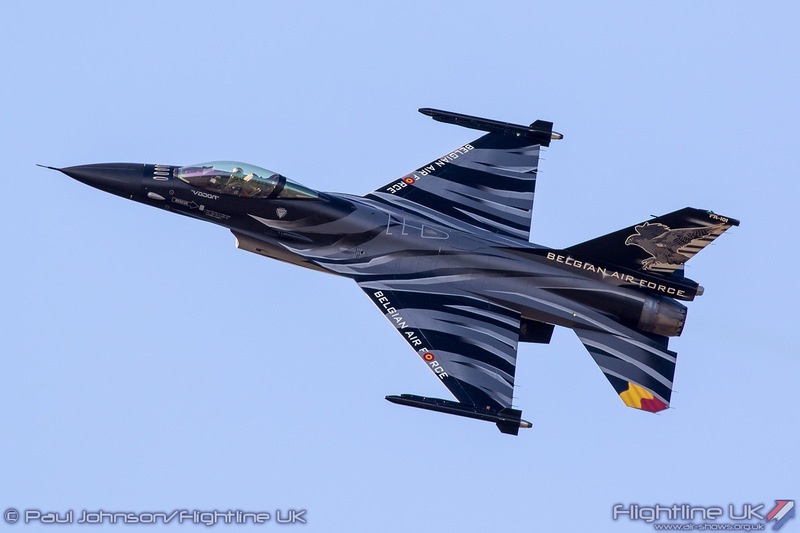 Another Belgian civilian display came from the Sonaca 200. 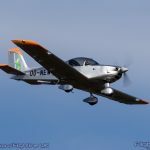 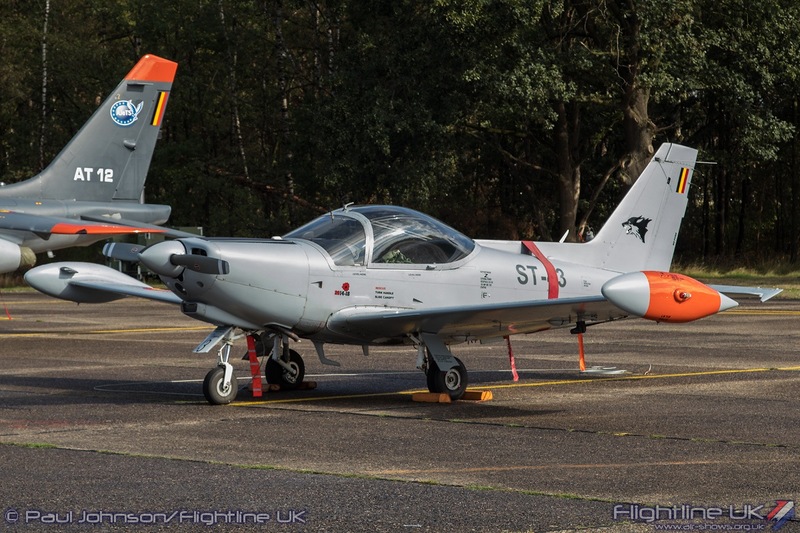 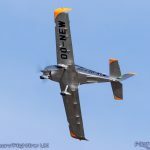 This is newly designed Belgian aircraft powered by Rotax engine and unlike other new aircraft, is completely metallic in construction. 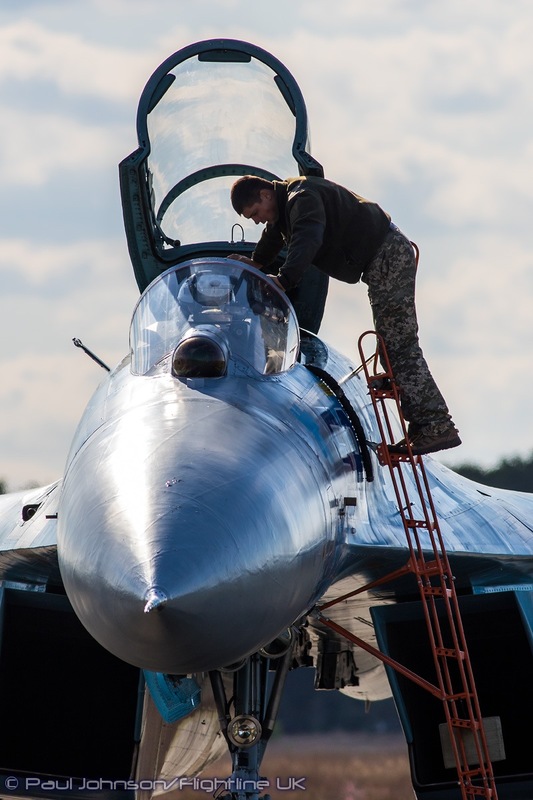 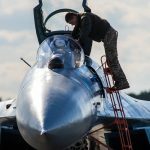 Advanced Aluminium alloys and riveting are used to construct the airframe to resist corrosion and also to allow for quick and relatively cheap repairs. 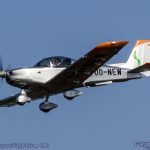 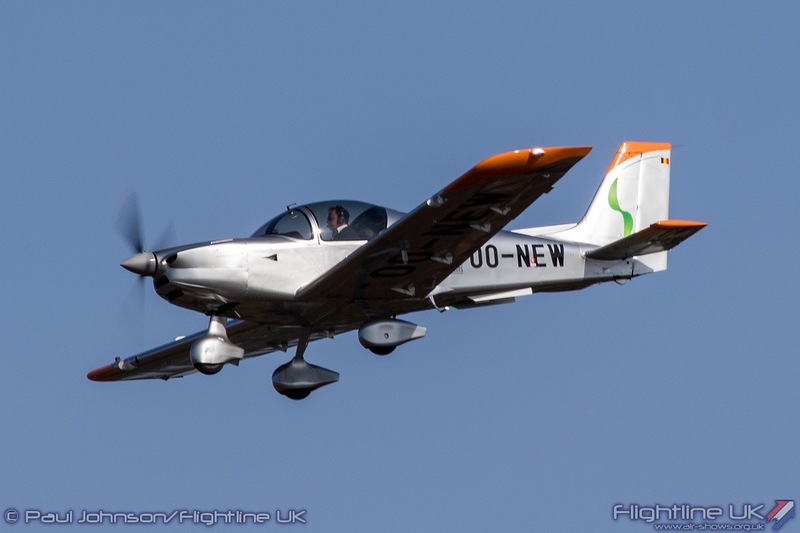 The aircraft is primarily aimed at civilian flying schools and private pilots. 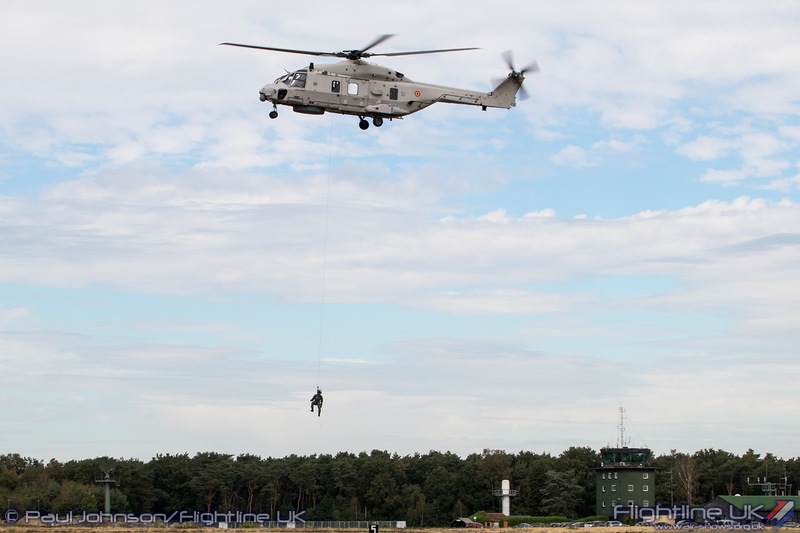 The home based civilian displays were joined by some from overseas. 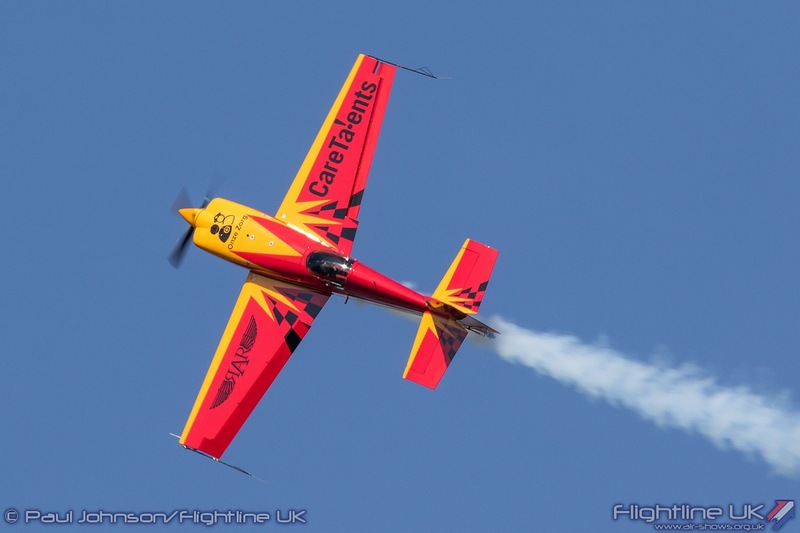 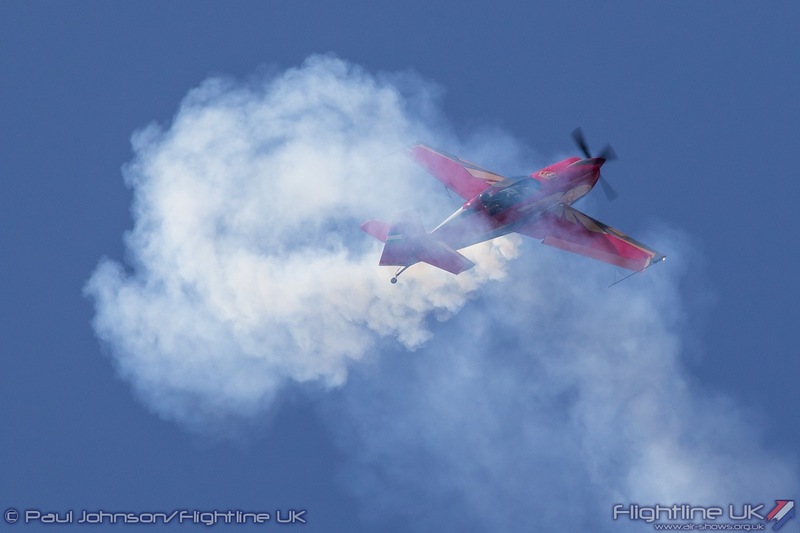 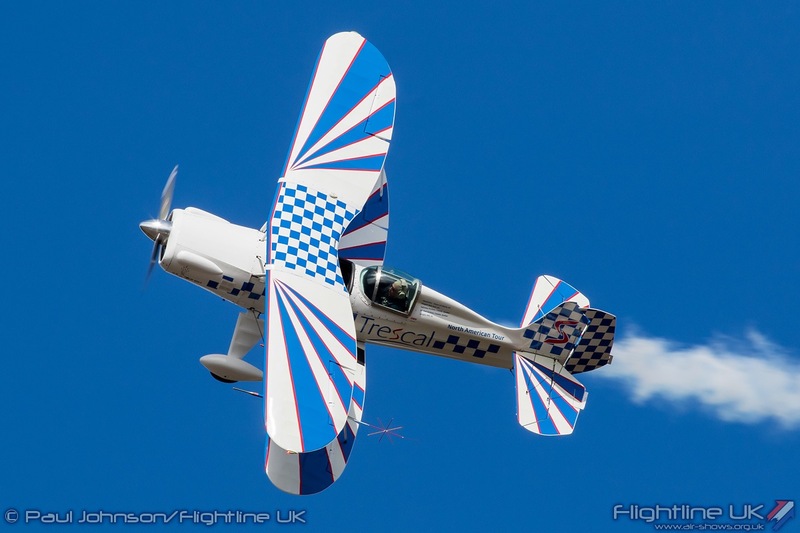 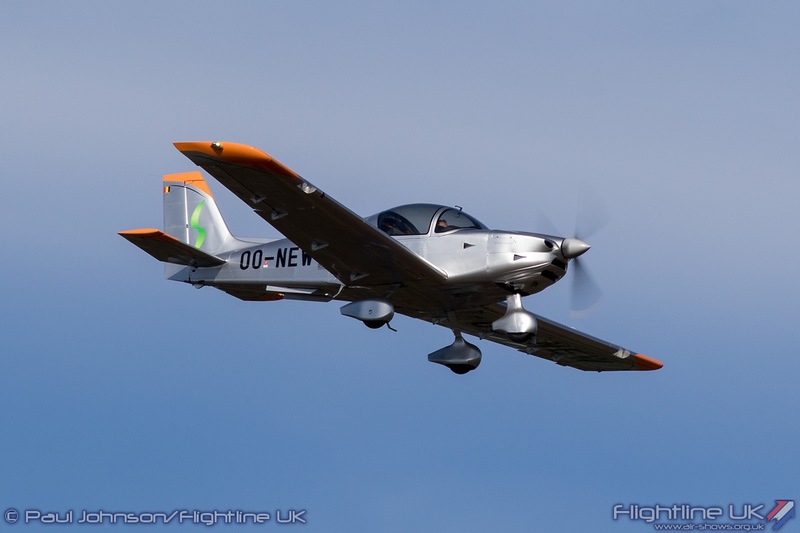 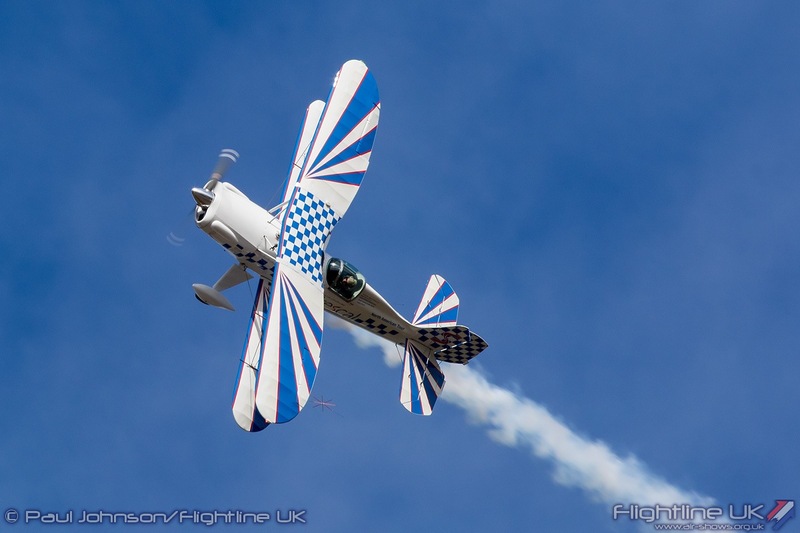 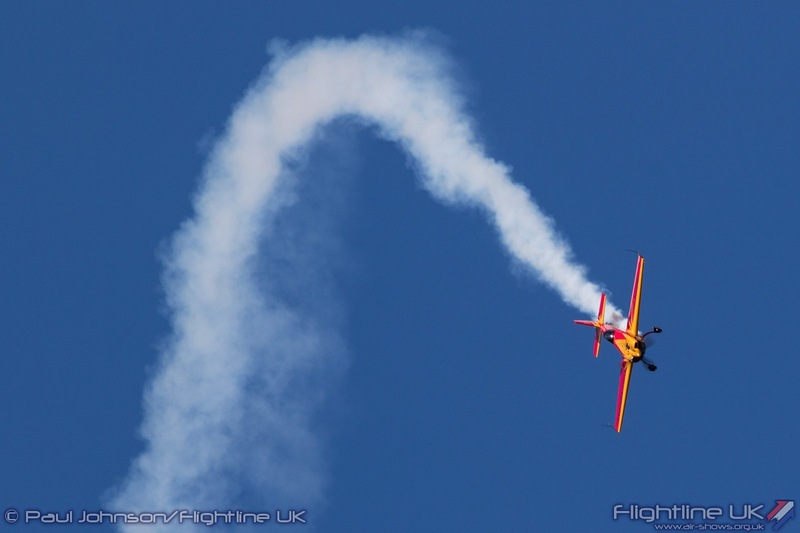 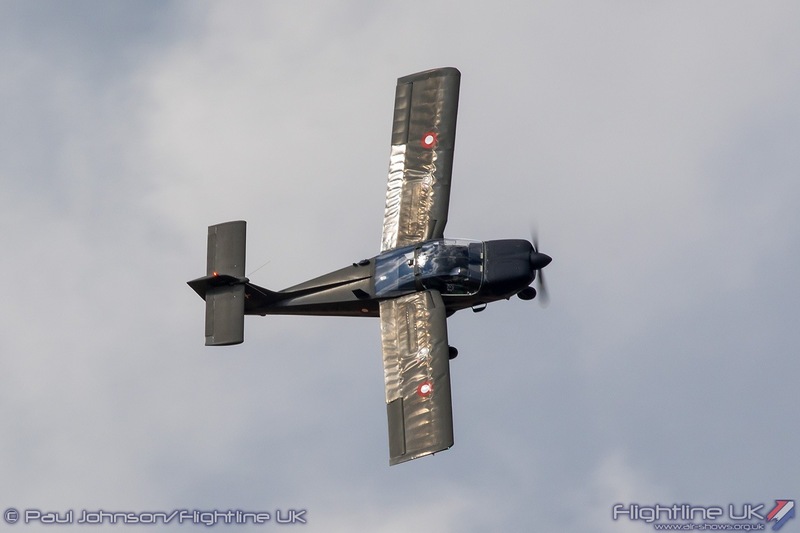 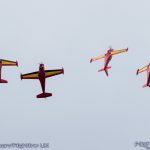 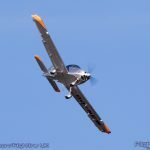 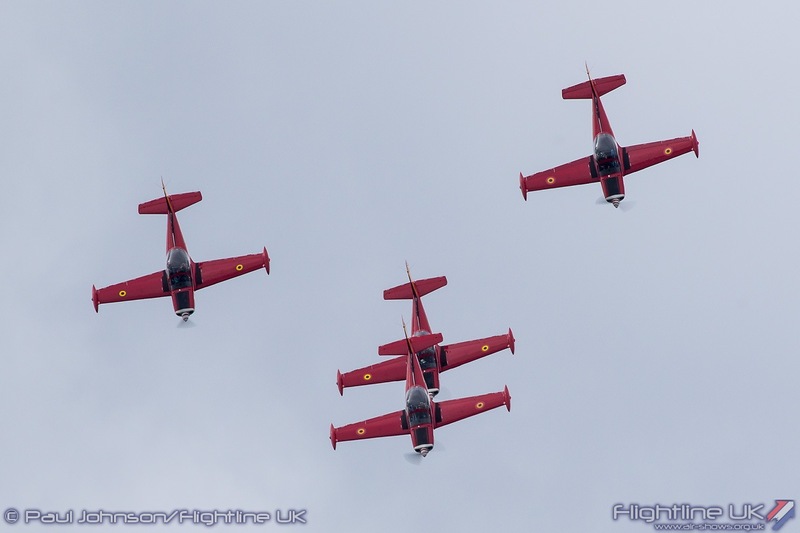 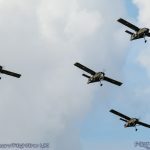 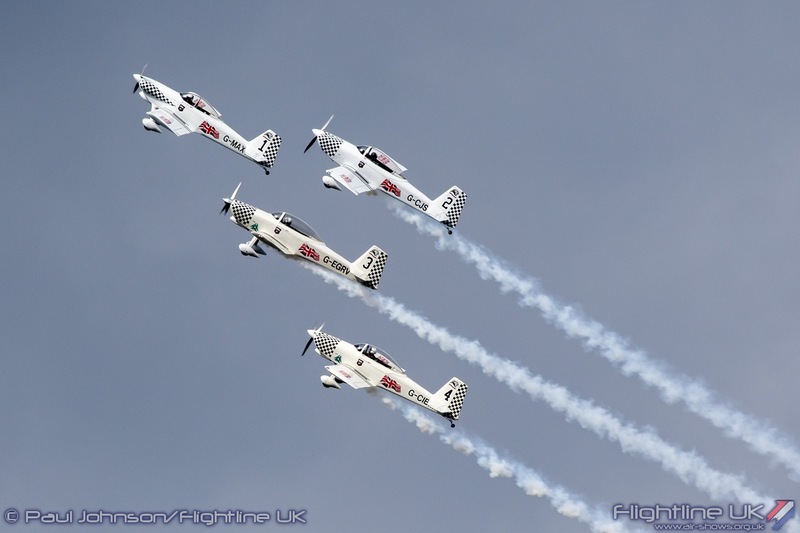 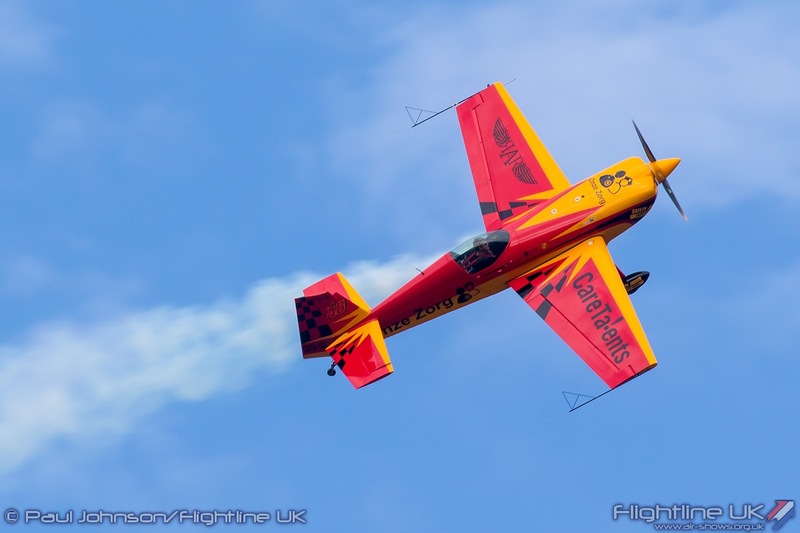 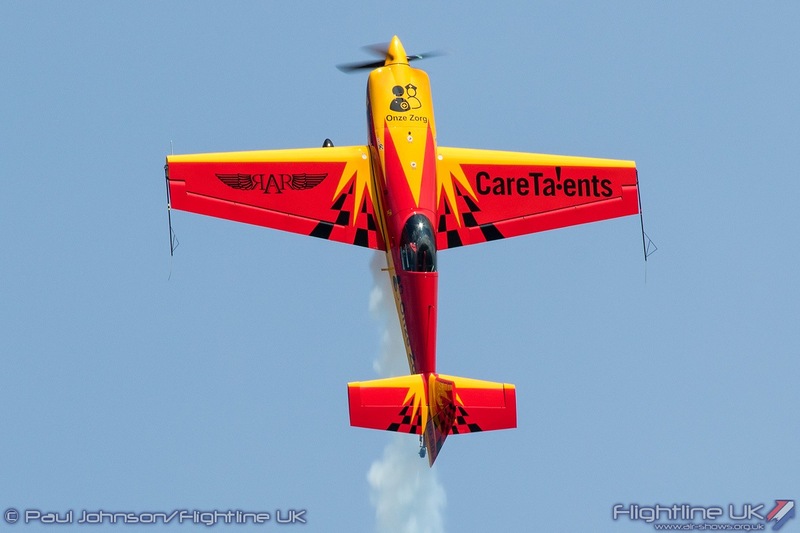 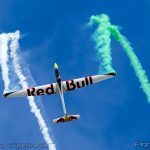 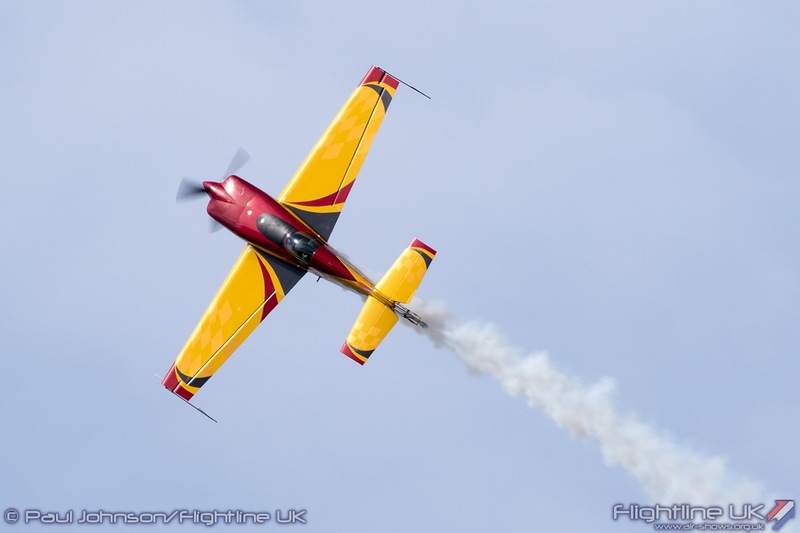 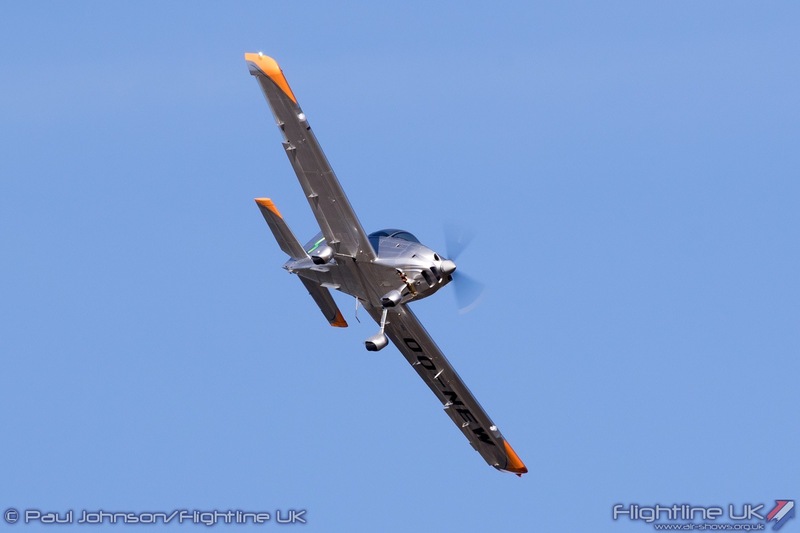 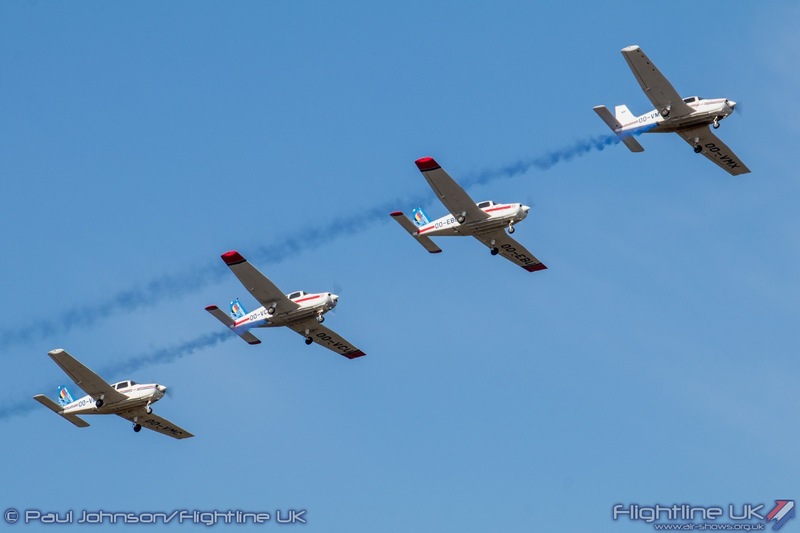 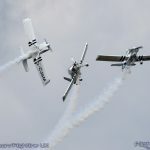 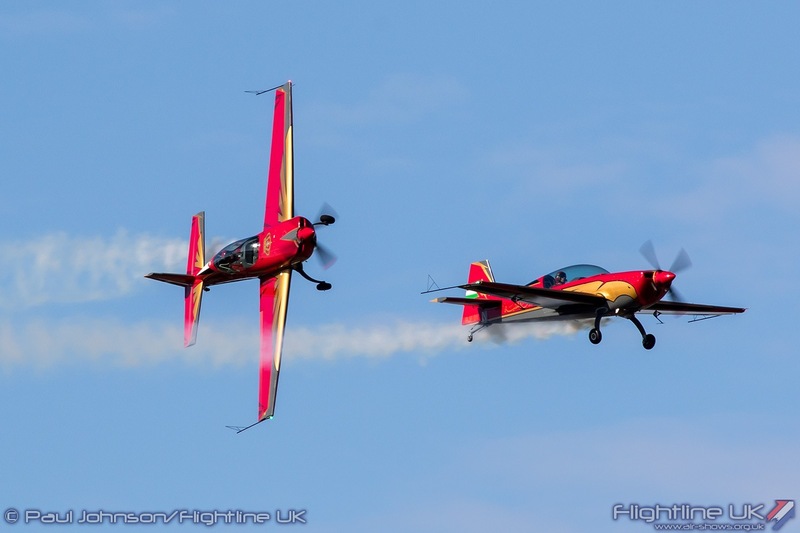 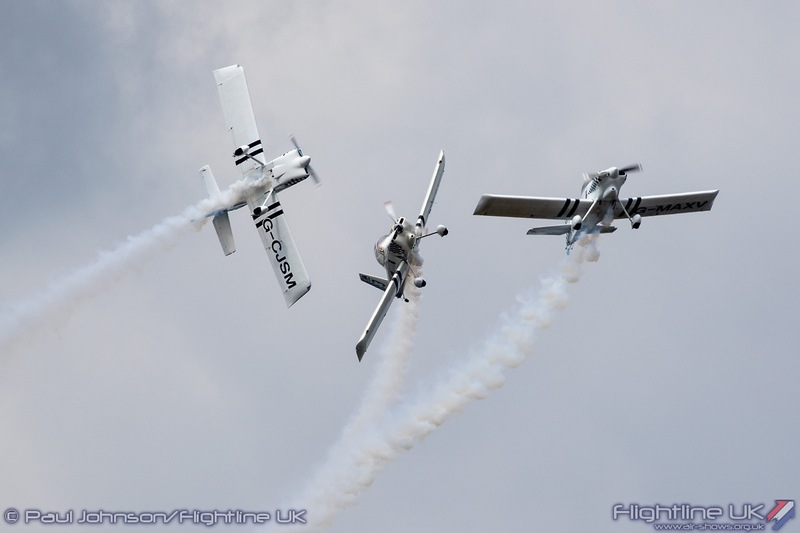 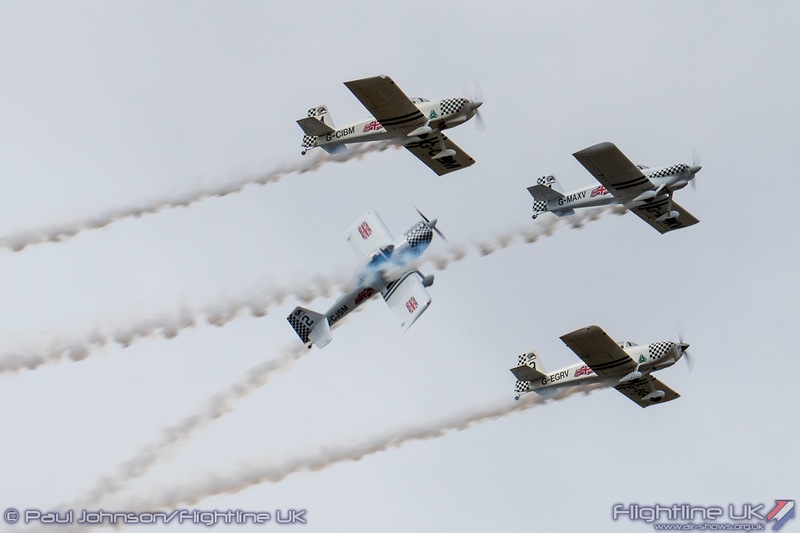 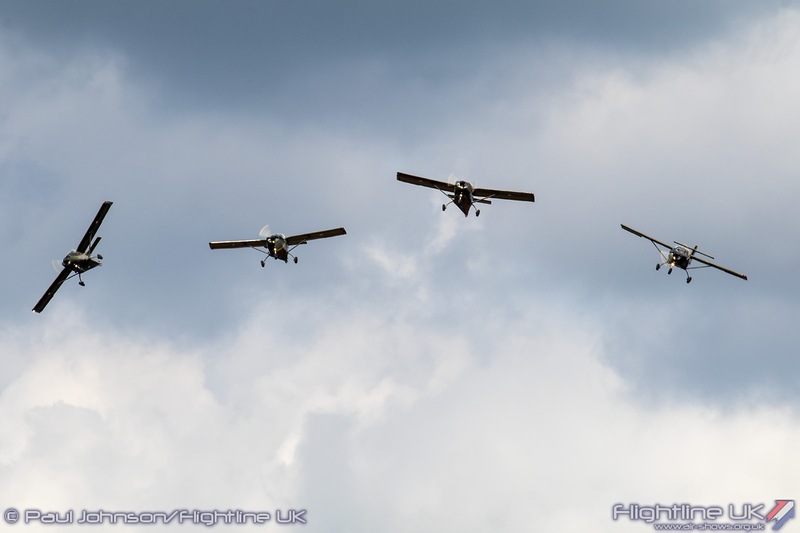 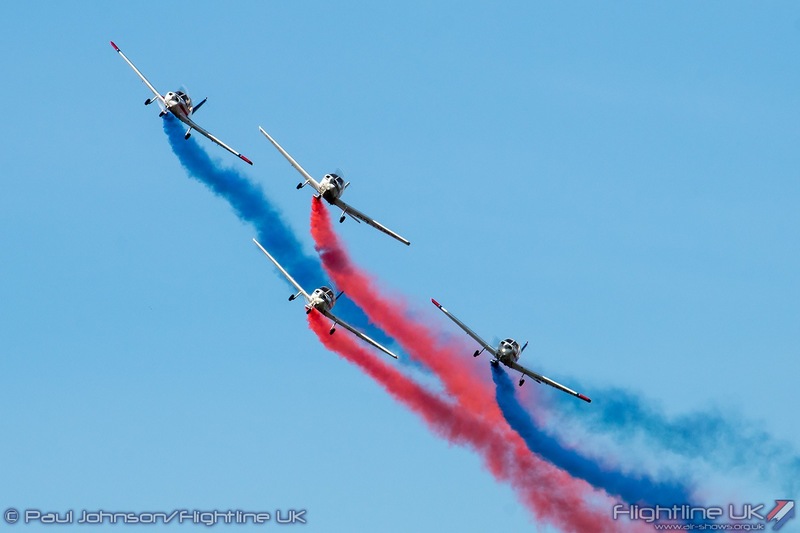 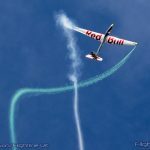 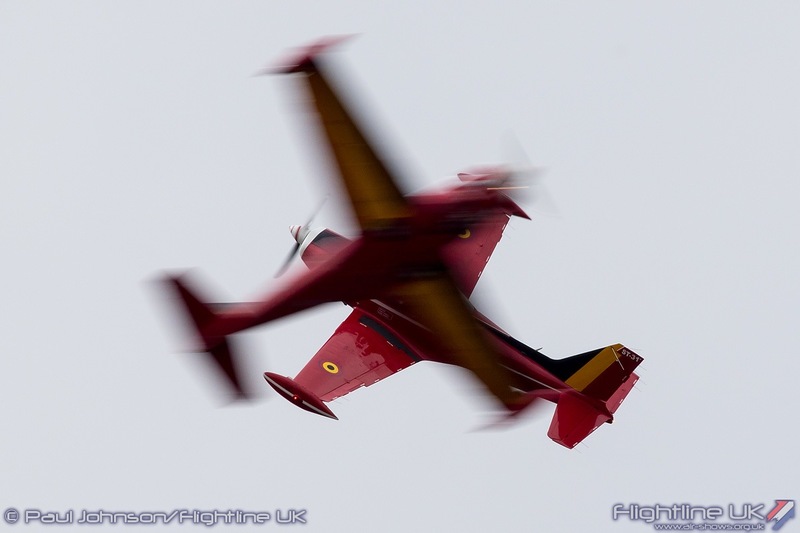 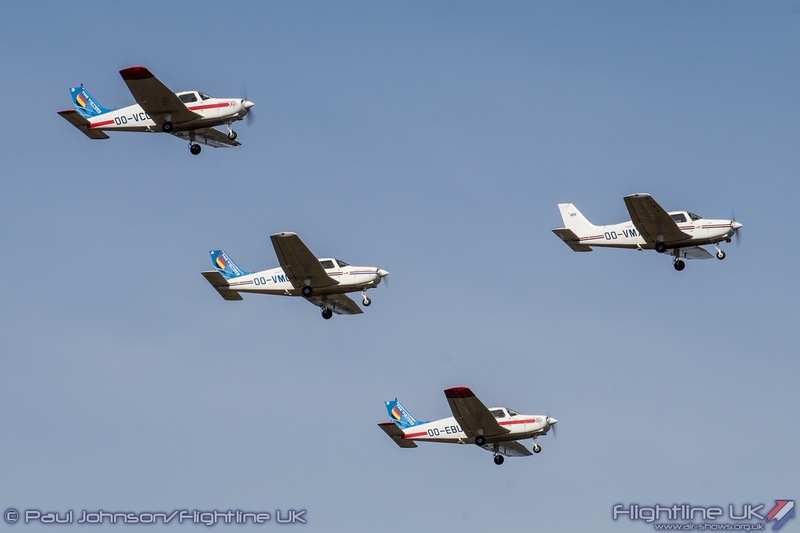 The UK’s Team Raven proved popular at Kleine Brogel with their formation aerobatics routine flying a mix of Vans RV4s and RV8s. 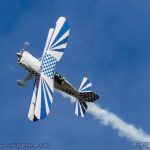 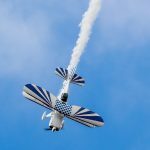 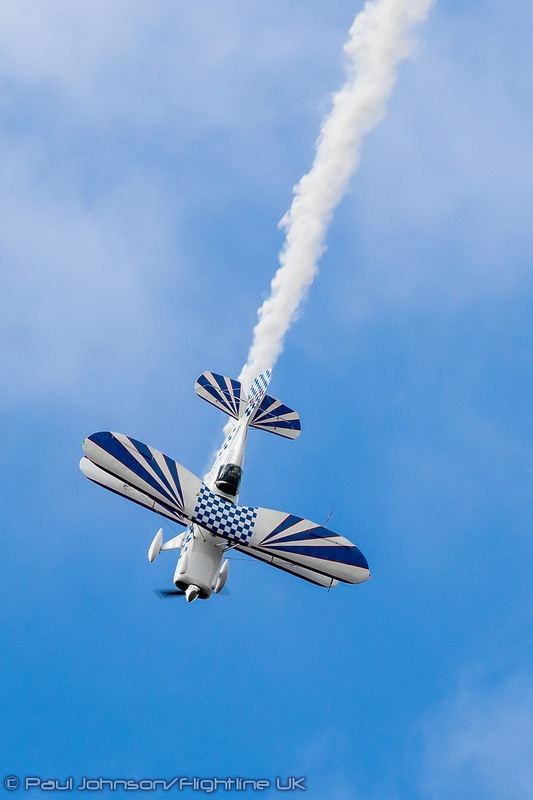 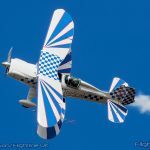 Jean-Marc D’Hulst also returned to Belgium with a classic aerobatic routine in the Stolp Starduster Too sponsored by Trescal. 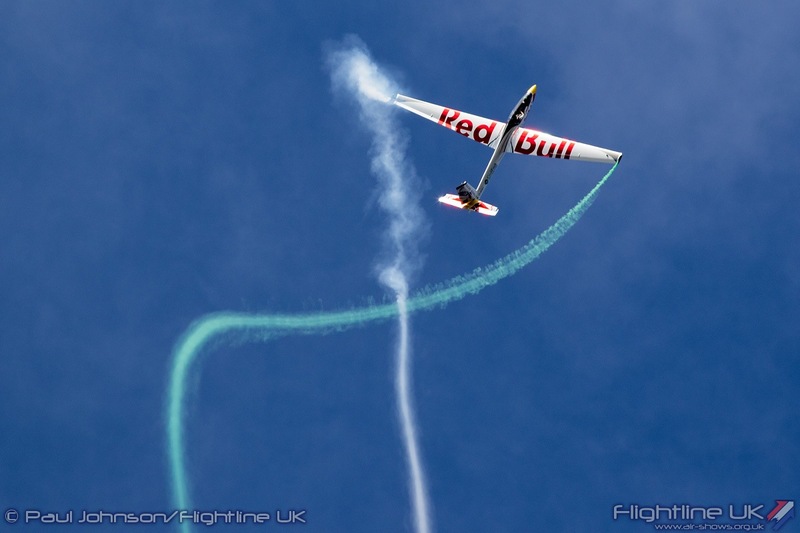 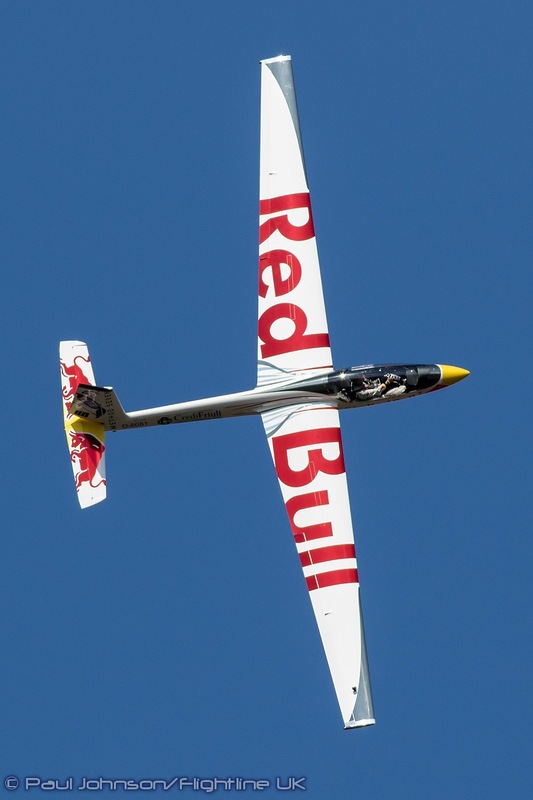 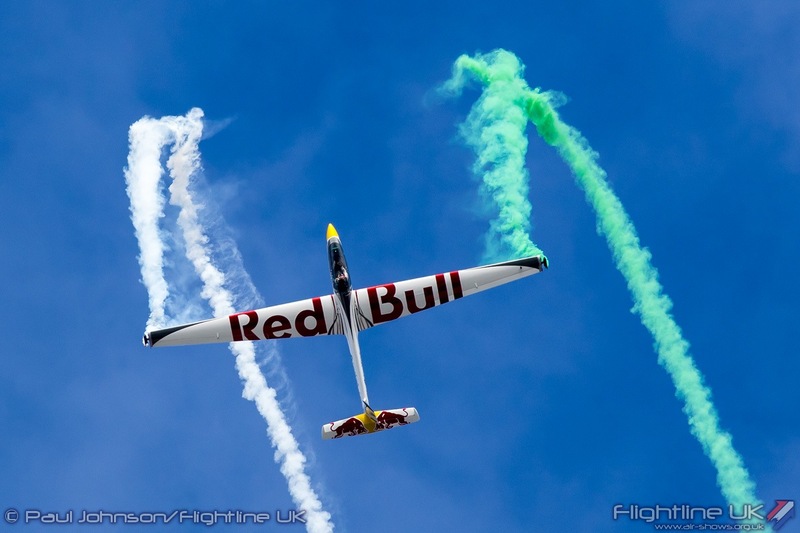 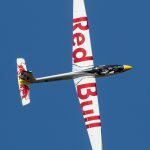 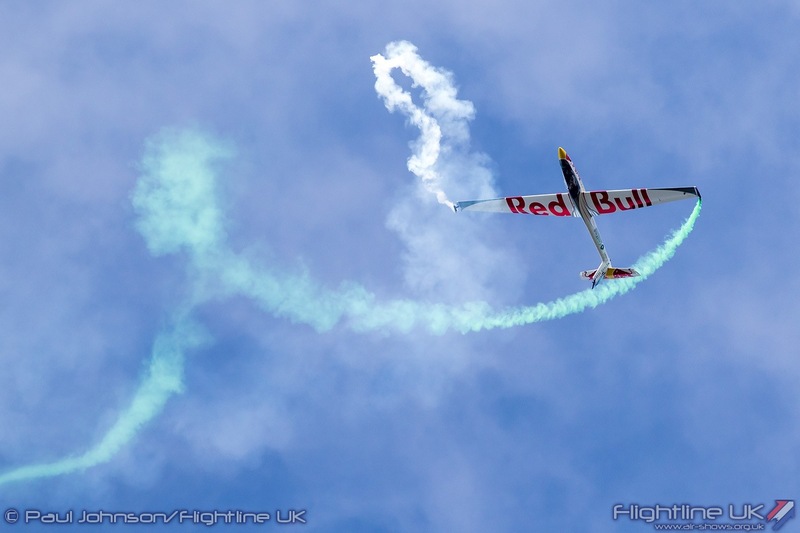 One of the most eye-catching civilian acts was the Red Bull X-Glider flown by Italian champion pilot Luca Bertossio. 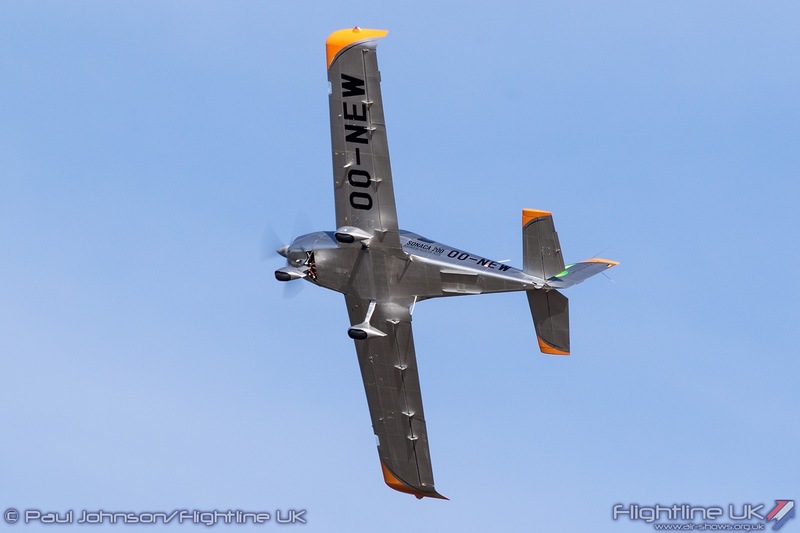 The glider is actually a Marganski S-1 Swift, the glider of choice for competition aerobatics. 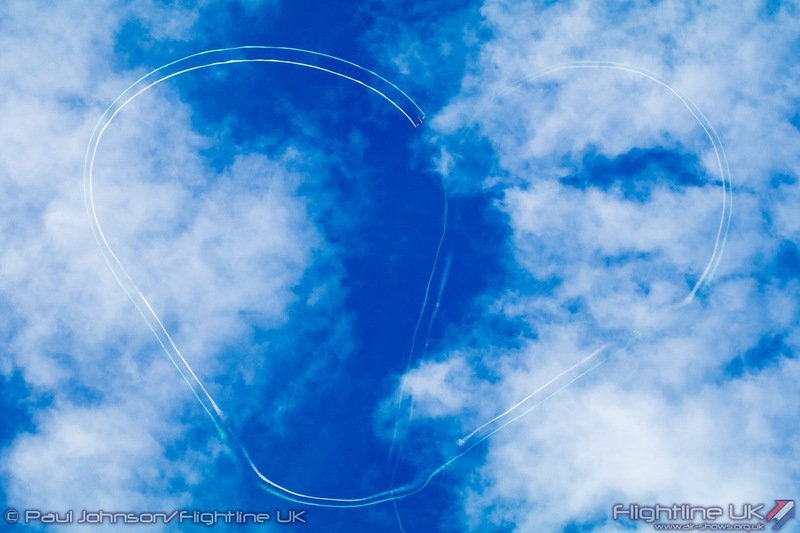 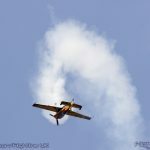 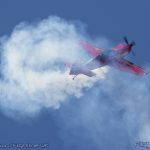 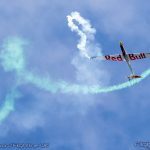 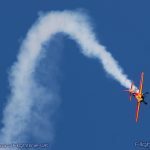 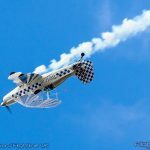 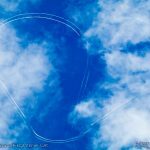 Luca gave a really punchy display of precise aresti-style aerobatics as well drawing a very elegant heart in the sky with his smoke. 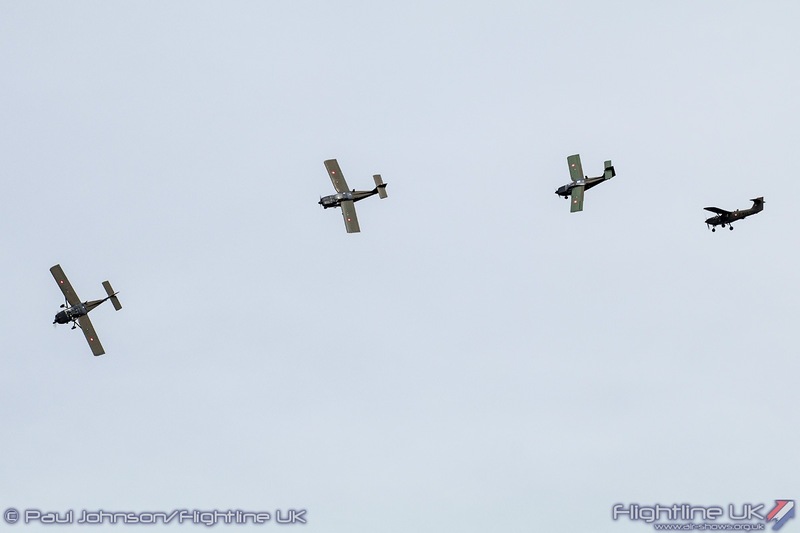 The light aircraft displays were not just restricted to civilian operators. 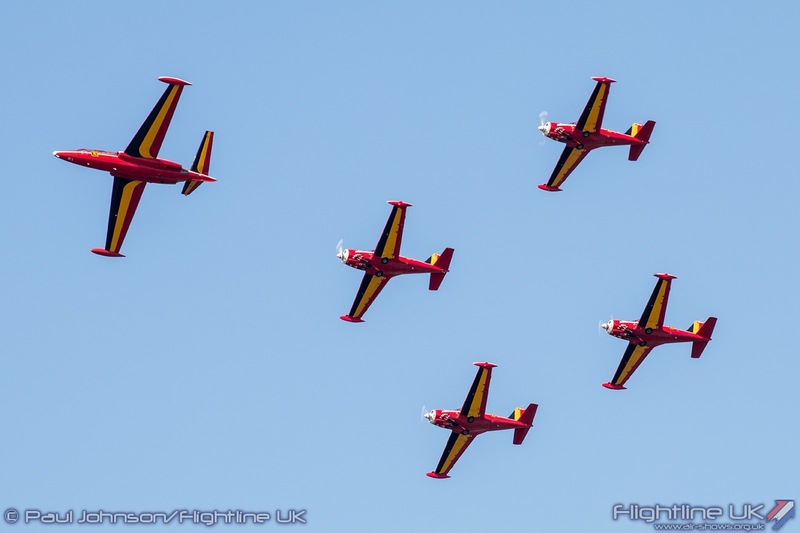 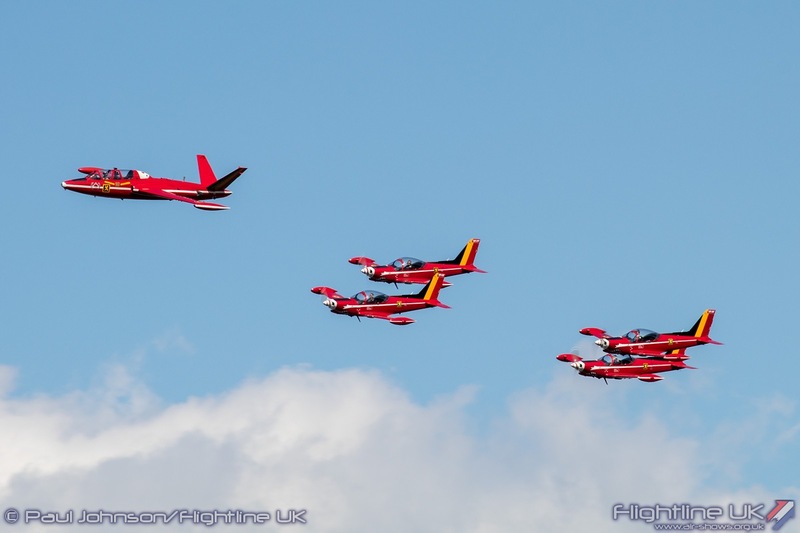 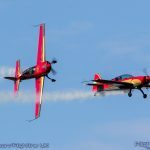 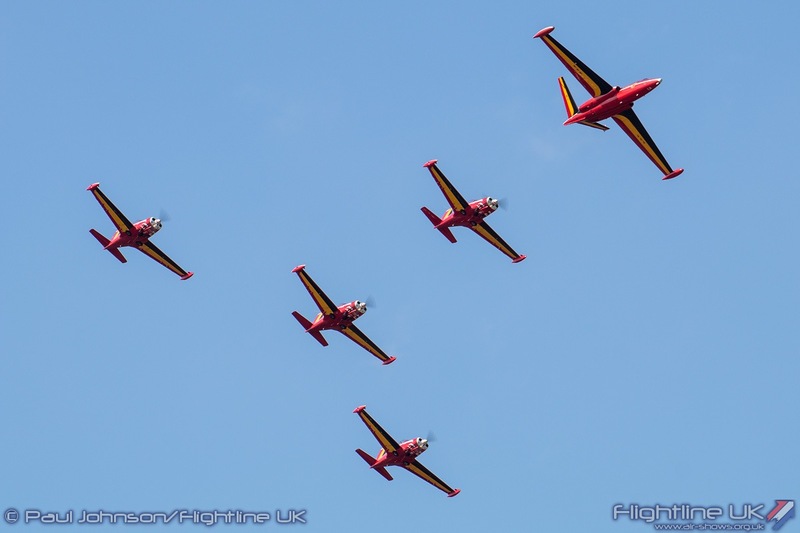 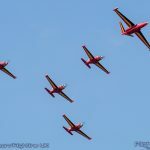 The Royal Jordanian Falcons closed their 2018 European tour at Kleine Brogel with their new Extra 330LX aerobatic aircraft. 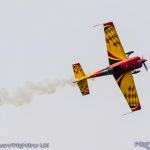 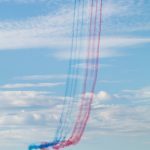 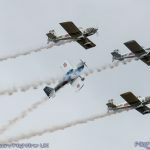 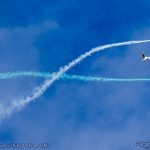 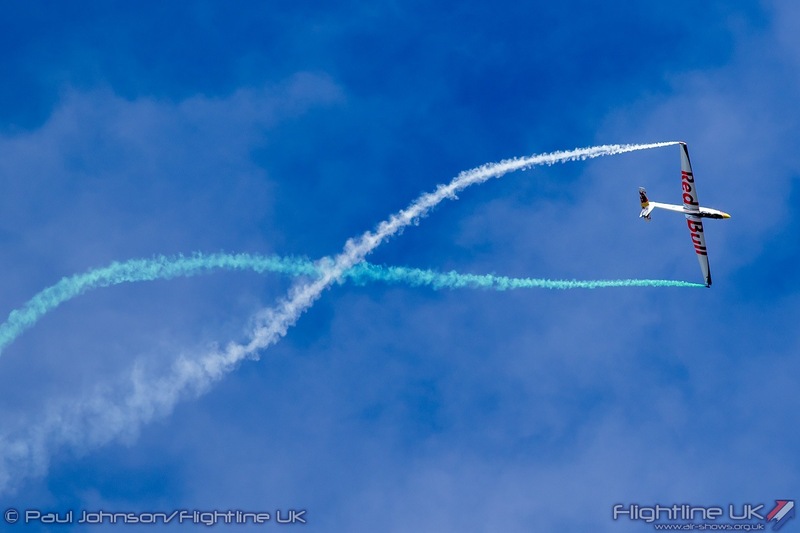 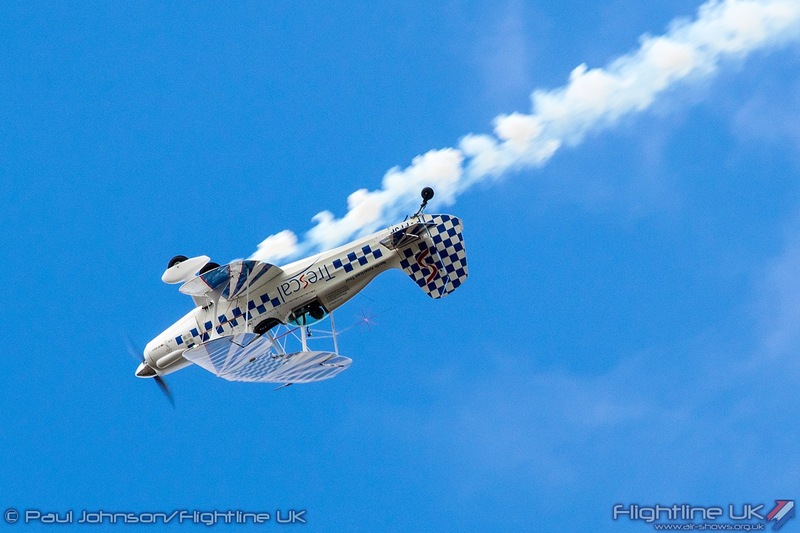 Often appearing at the big military airshows across Europe, their display is often overlooked but this year their routine was particularly good with action in front of the crowds at all times and some very dramatic breaks and opposition passed. 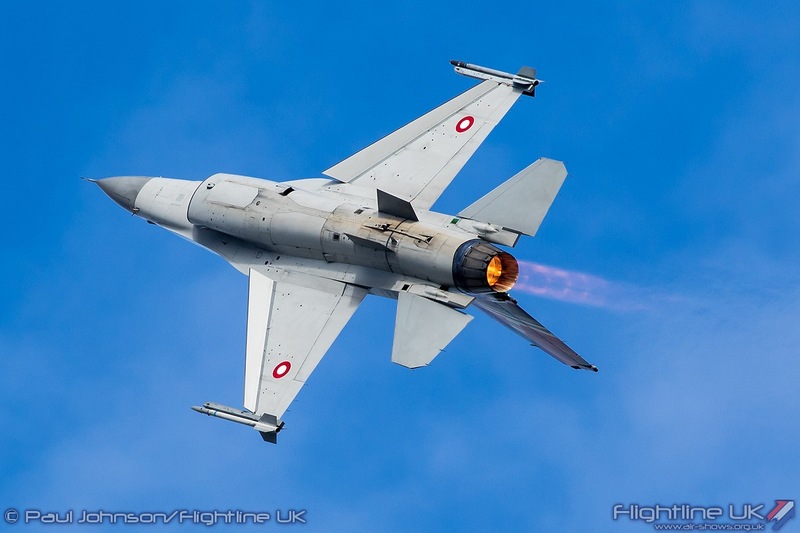 The Royal Danish Air Force had three displays in the flying programme. 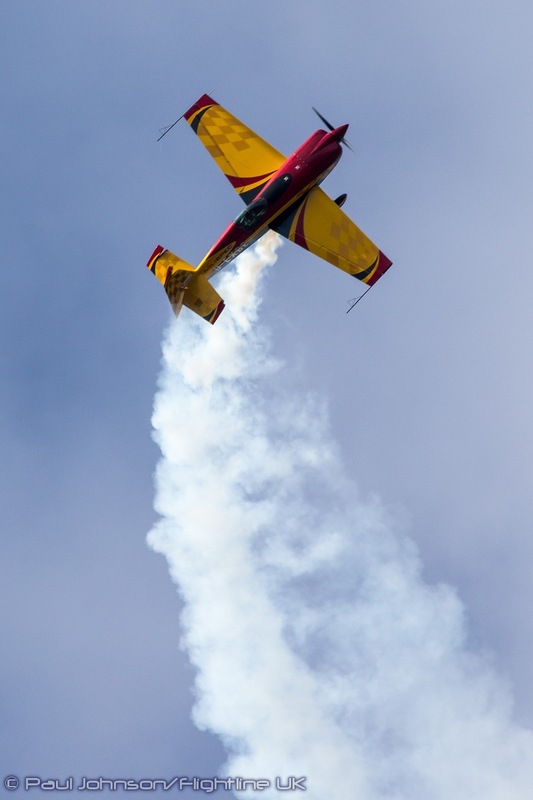 Opening Saturday’s flying was a solo aerobatic routine from a SAAB T-17 Supporter. 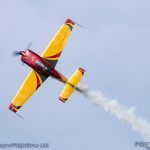 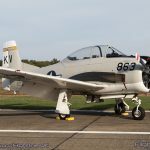 The T-17 on first impressions appear to be all that aerobatic so the solo display pilots routine of spins, rolls and loops came as quite a surprise. 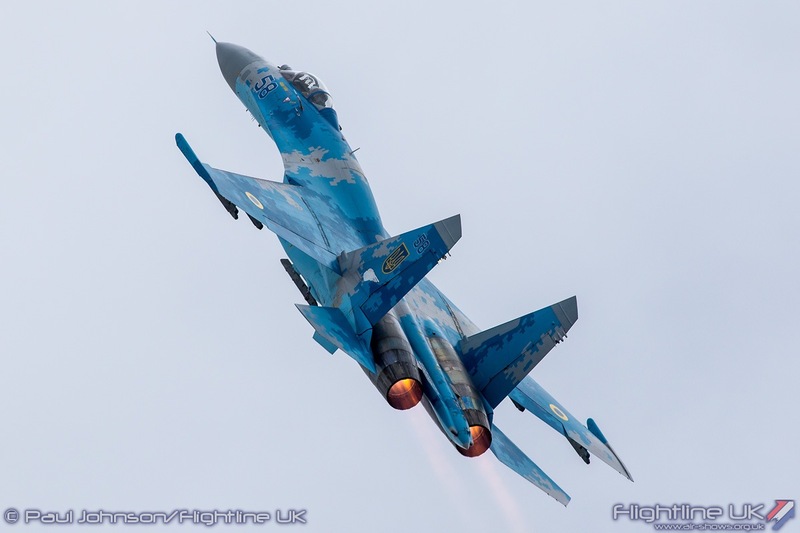 Further T-17 action came later with an appearance of the Baby Blue Display Team. 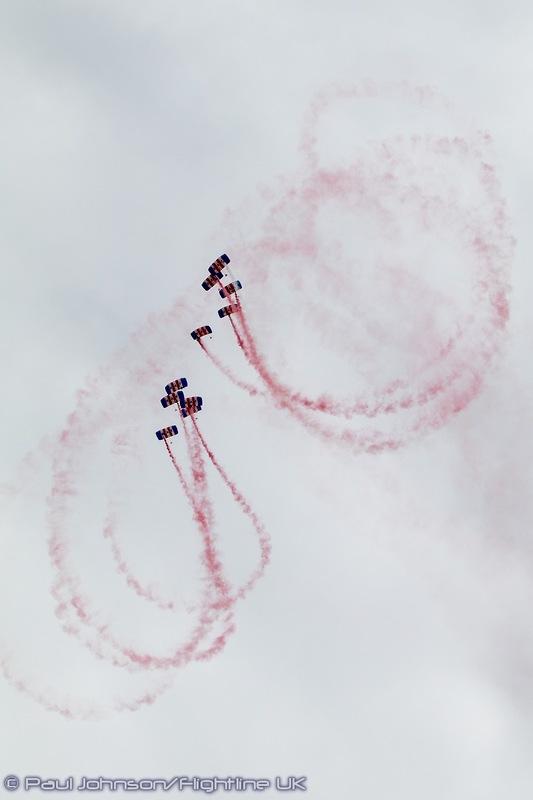 Though the team have a fairly long history, they are very infrequent visitors to events outside of Denmark. 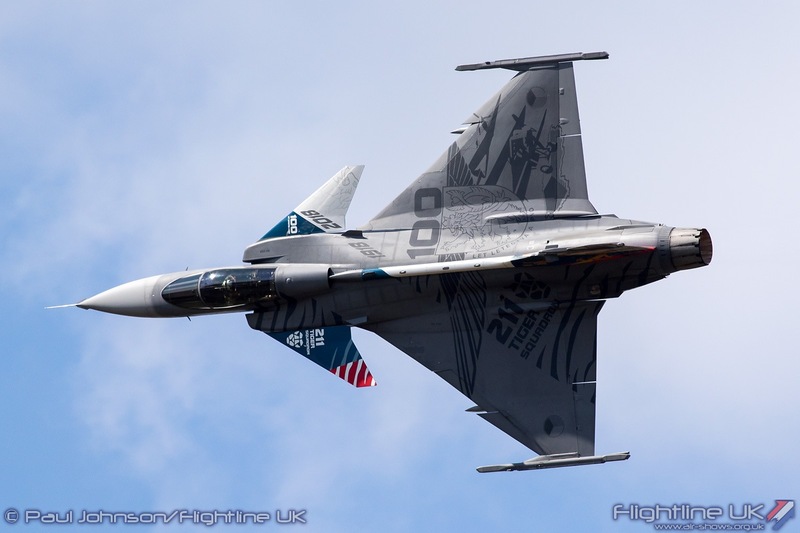 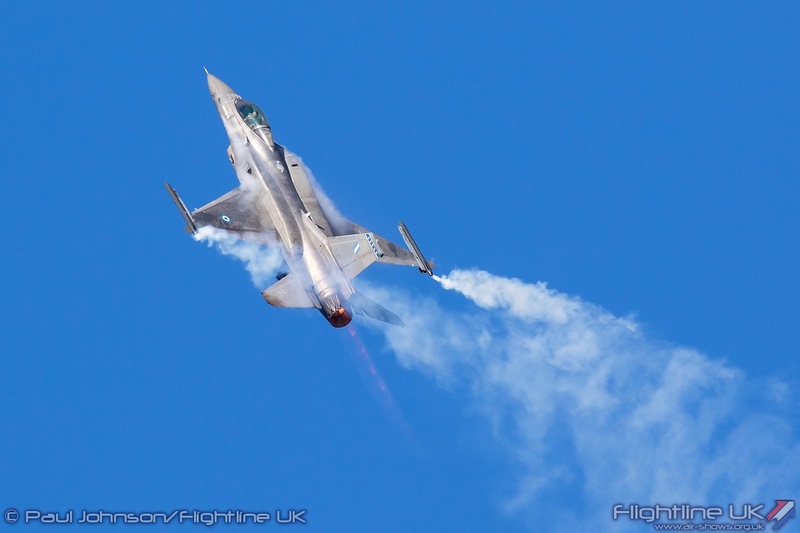 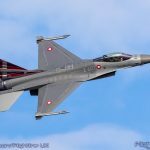 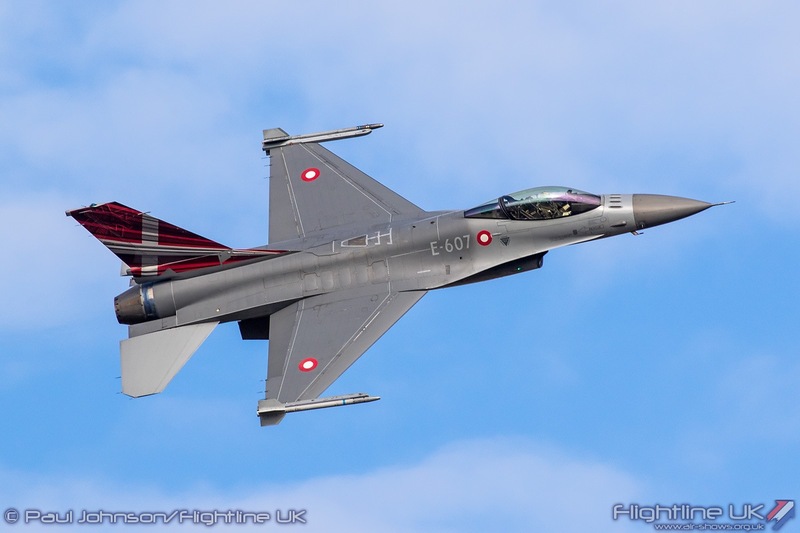 Completing the Danish contribution to the flying was their Lockheed Martin F-16AM Fighting Falcon solo display. 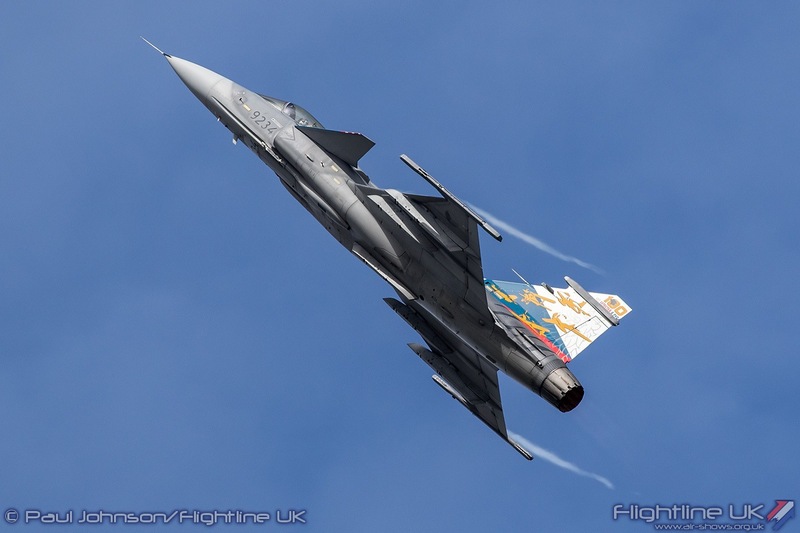 The Danish display is a particularly dramatic one with some very tight, high alpha barrel rolls and some wing-bending sharp turns and climbs. 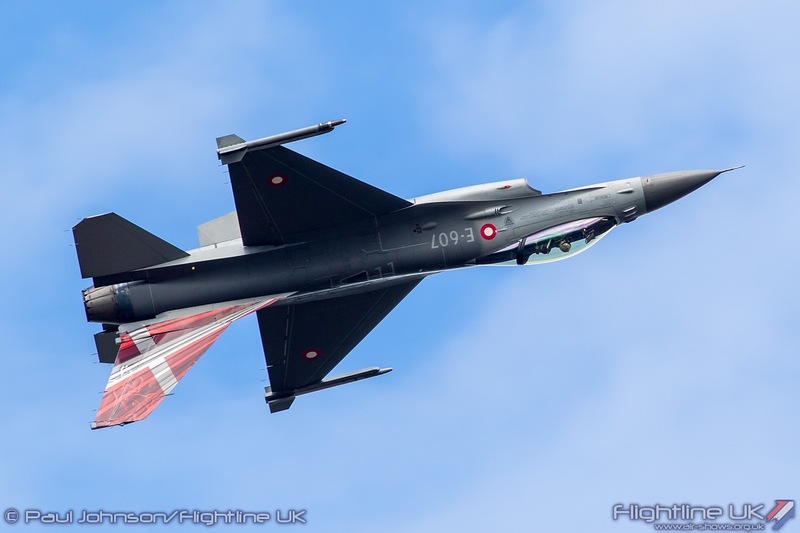 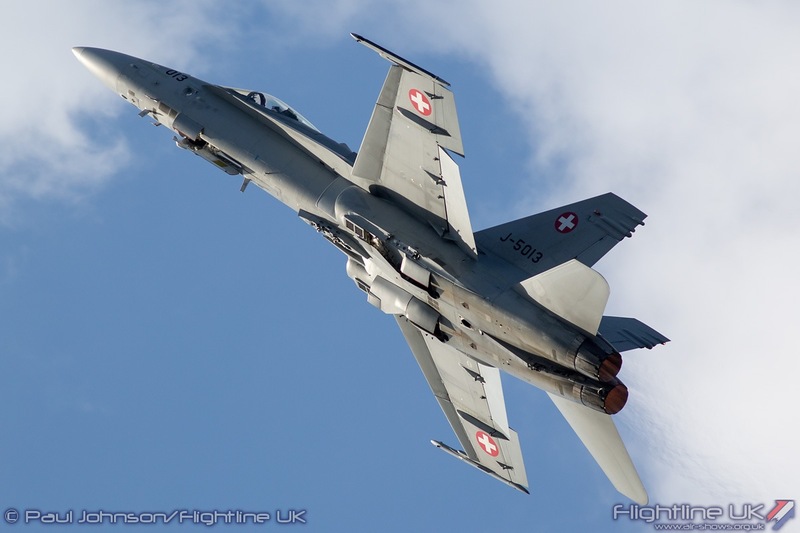 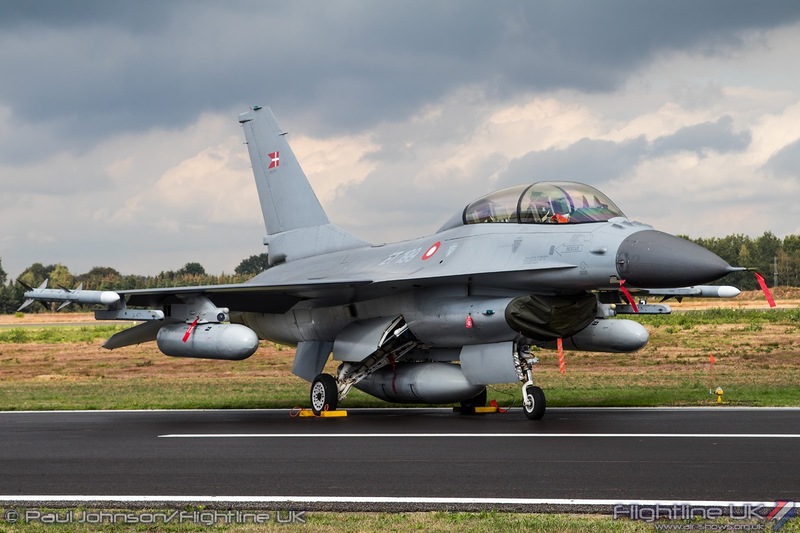 The Danish F-16 was just one of an impressive collection of international fast jet displays. 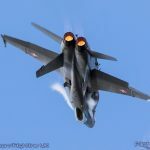 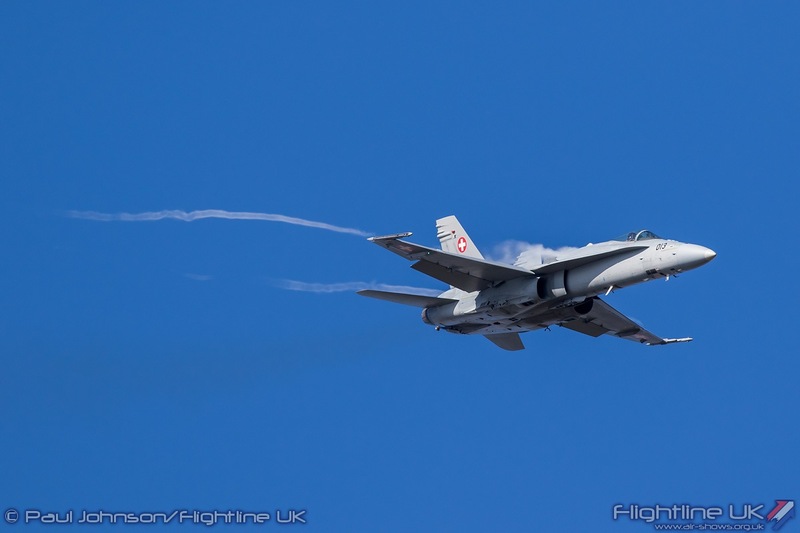 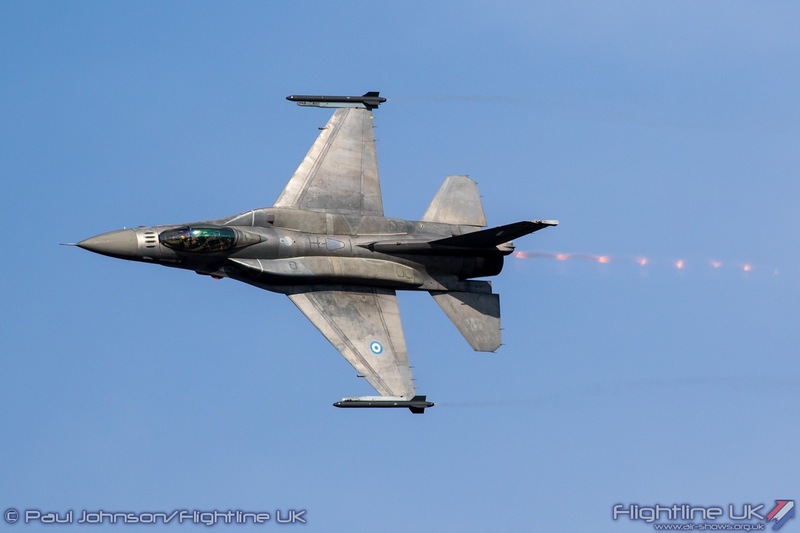 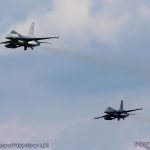 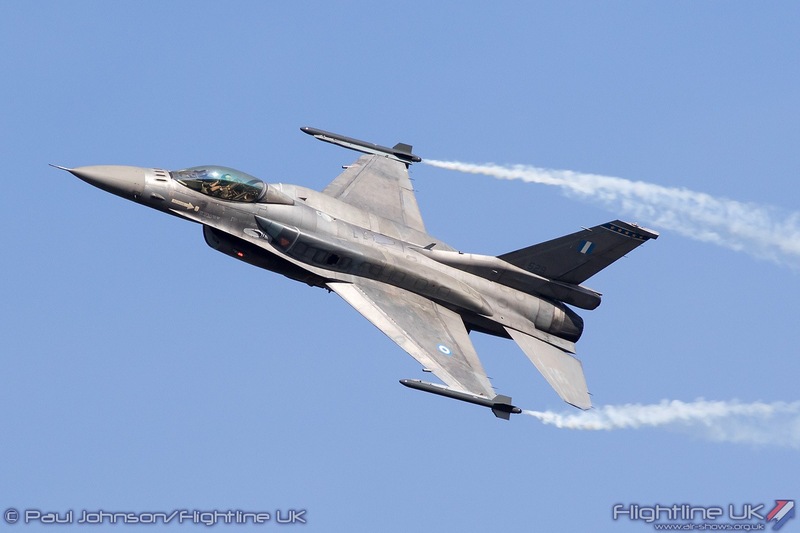 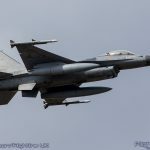 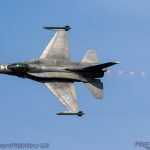 Further F-16C Fighting Falcon action came from the Hellenic Air Force Zeus Display Team while the Spanish and Swiss Air Forces showed off their powerful EF-18M and F/A-18C Hornets. 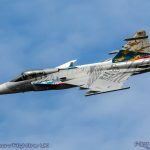 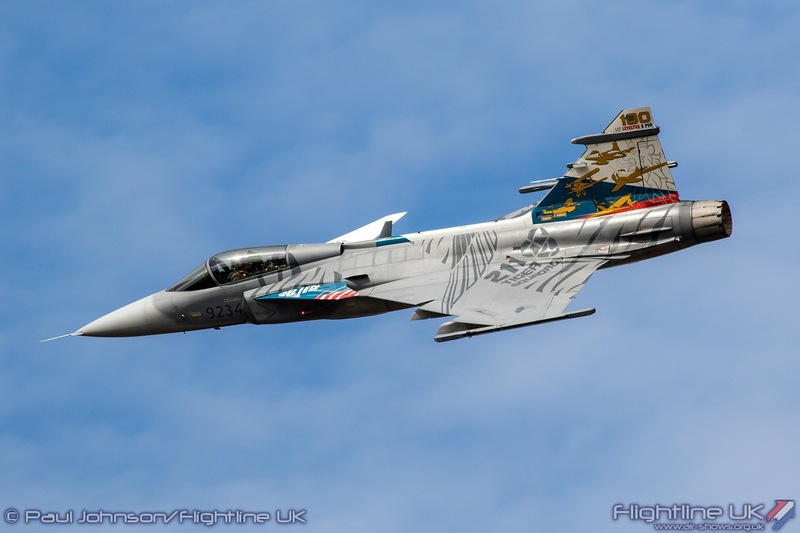 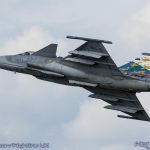 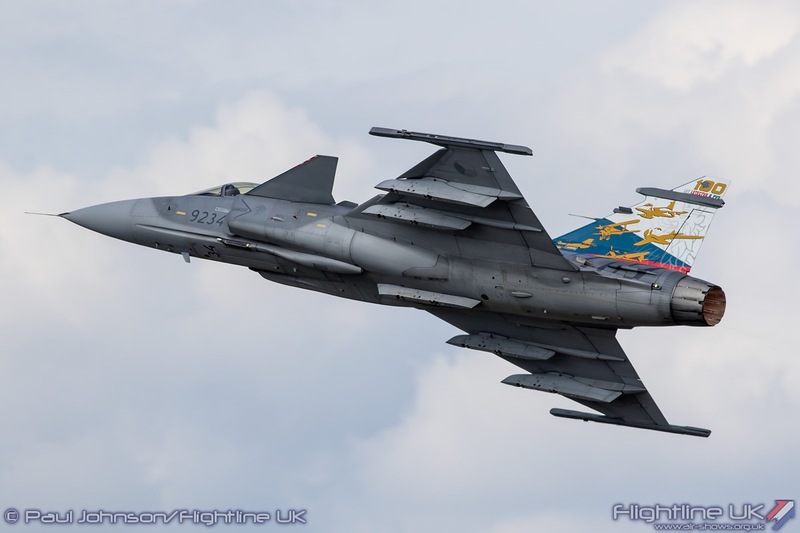 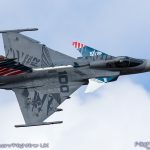 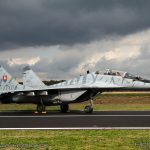 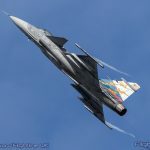 The Czech Air Force added to the fast jet line-up with their SAAB JAS-39C Gripen which wore special markings celebrating the 100th Anniversary of the Czech Air Force and the also the Tiger Squadron heritage of the 211th Tactical Squadron. 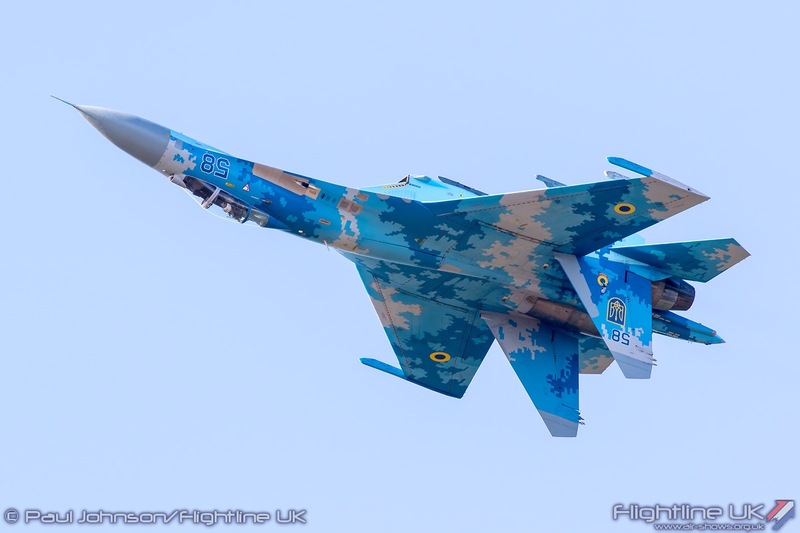 One of the absolute highlights of the flying display was the Ukrainian Air Force Sukhoi Su-27P1M Flanker flown by Col Oleksander Oksanchenko. 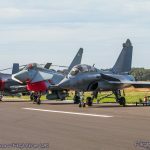 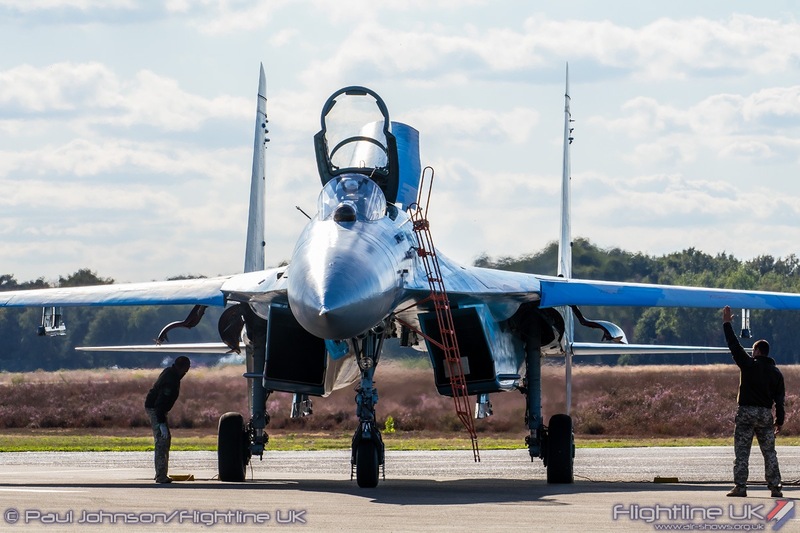 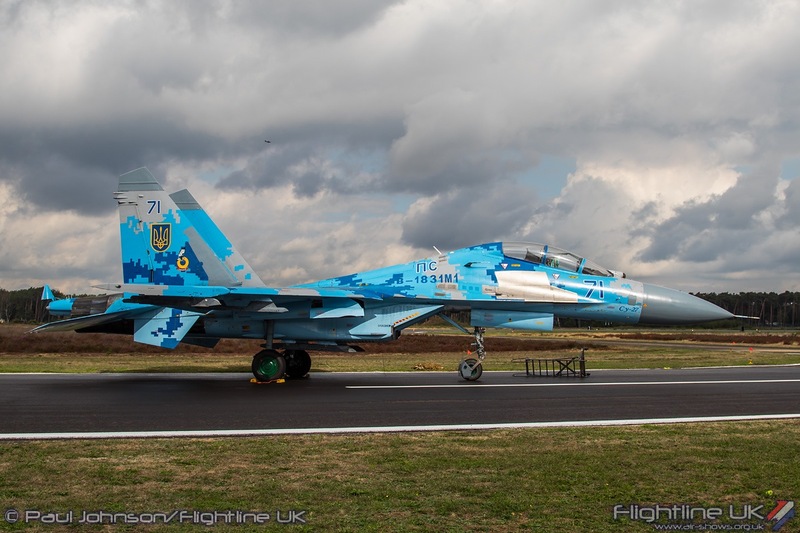 As usual, the single seat aircraft was supported by a Su-27UB1M Flanker and both aircraft were the only flying display fast jets parked on the public side of the airfield for the public to enjoy up close. 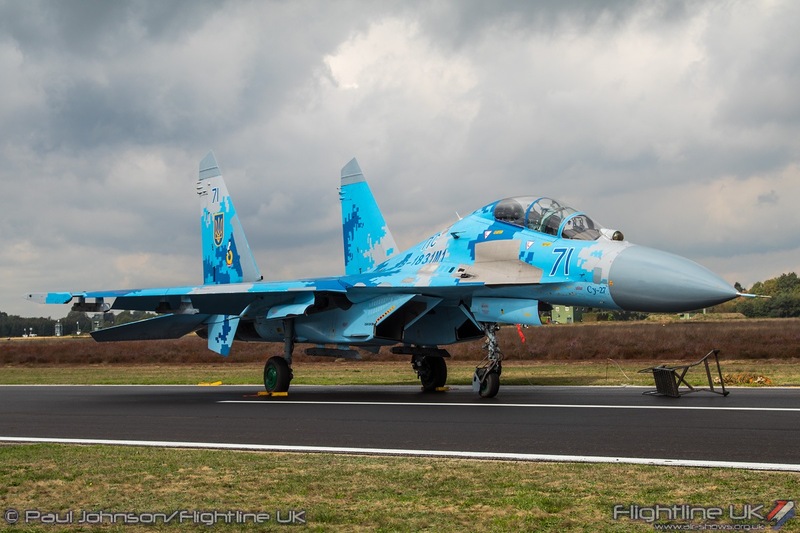 Su-27s are just the most incredible display aircraft thanks to their massive presence in the sky and the raw power of their Saturn AL-31 jet engines. 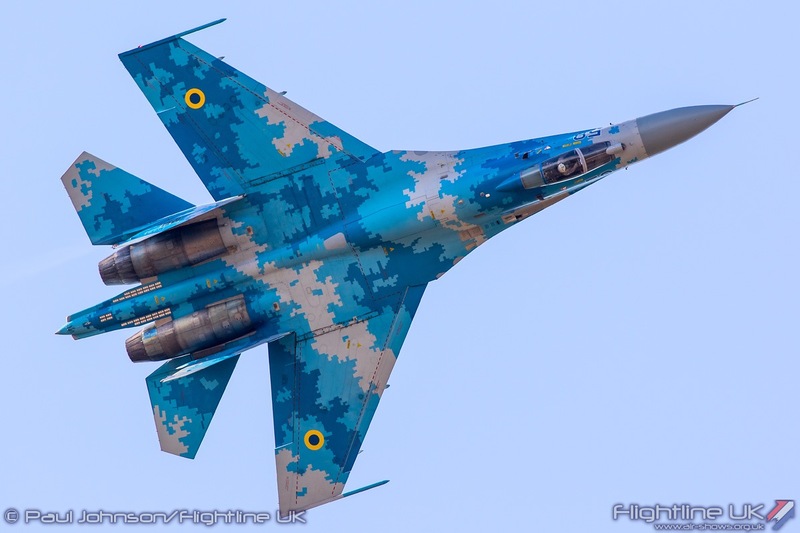 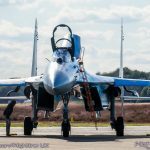 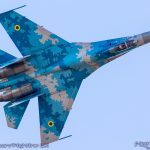 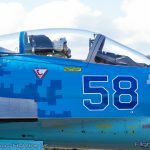 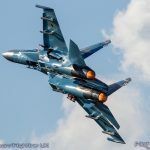 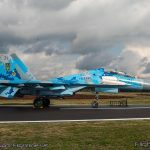 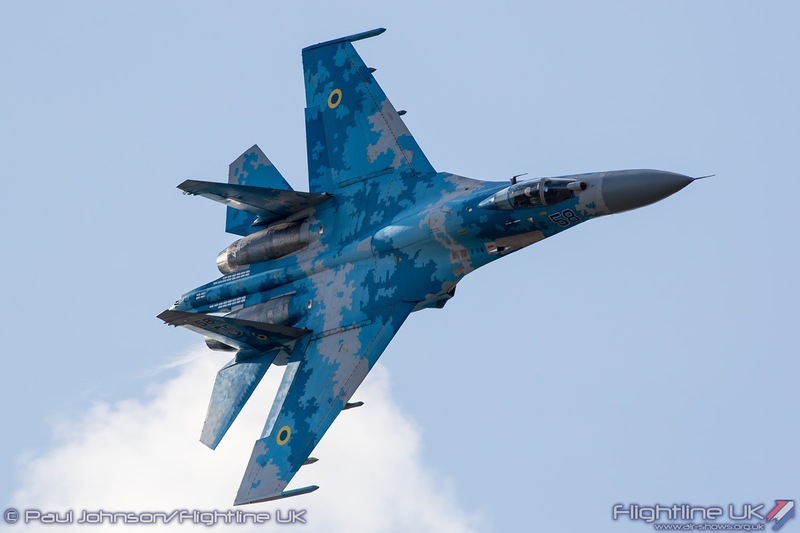 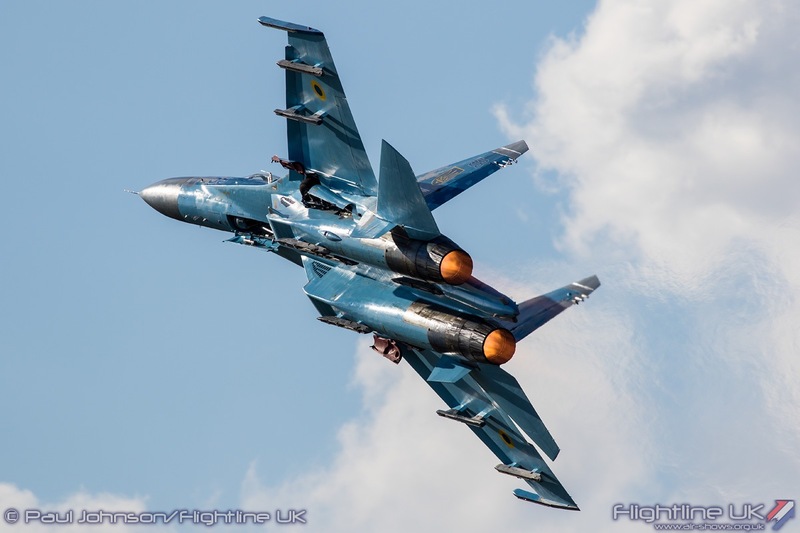 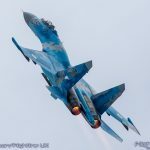 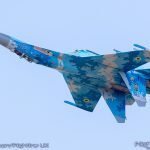 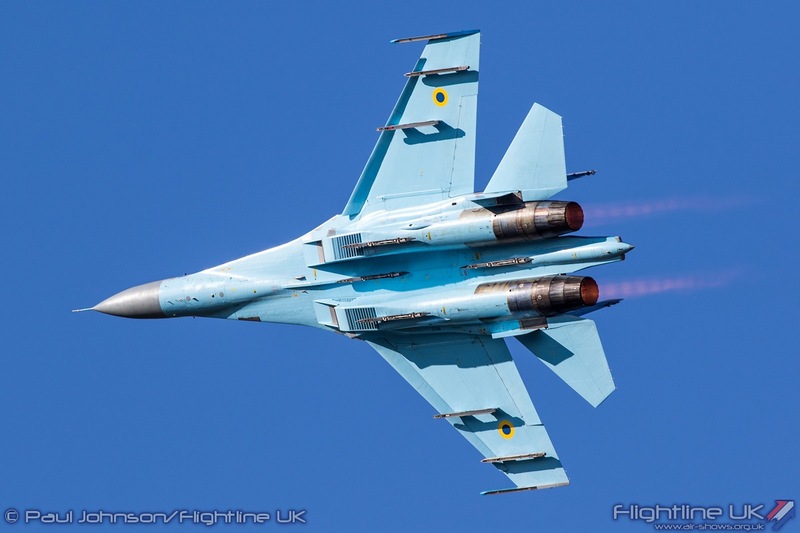 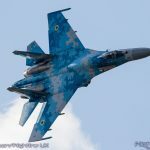 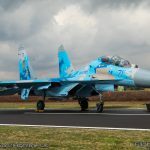 Oleksander’s display at KB was special for a couple of reasons; it was the first time the Ukrainian Air Force had displayed the Su-27 in Belgium and the first Su-27 display in the country for many years. 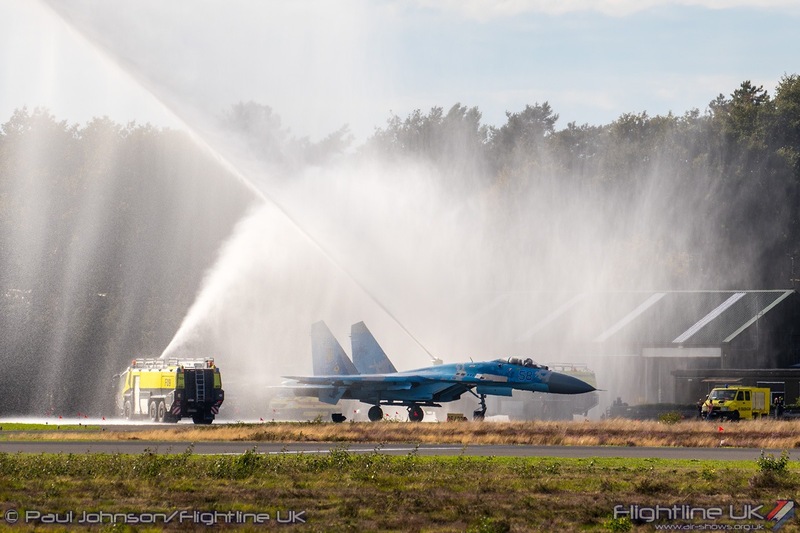 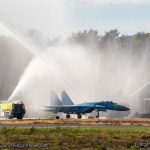 It was also Okeksander’s final public display before retirement and after his display on the Sunday he was greeted by a water salute from the air base fire vehicles. 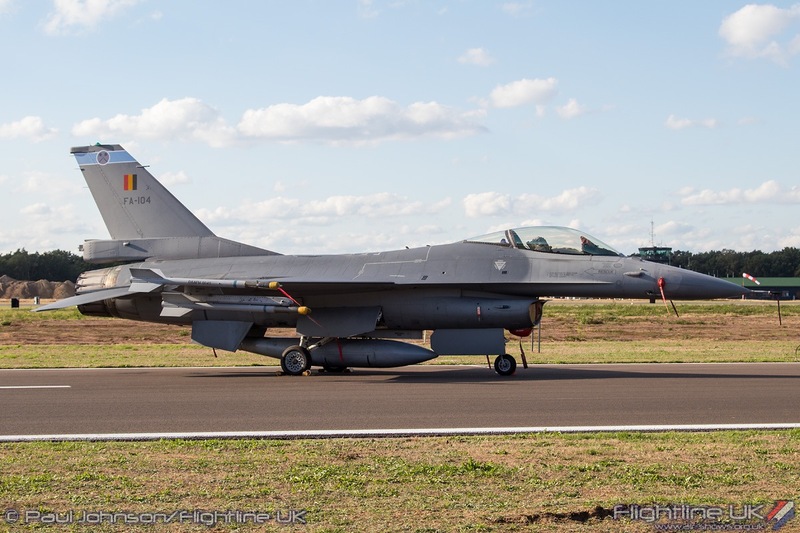 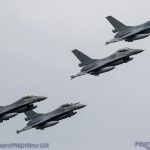 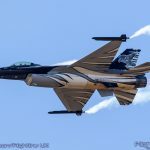 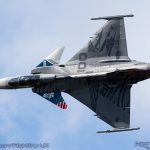 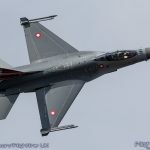 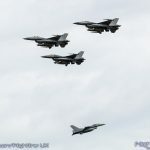 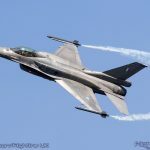 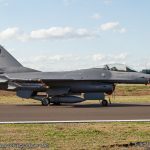 The flying displays also reflected the “Ready for the Future” theme with two displays from the potential F-16 replacements. 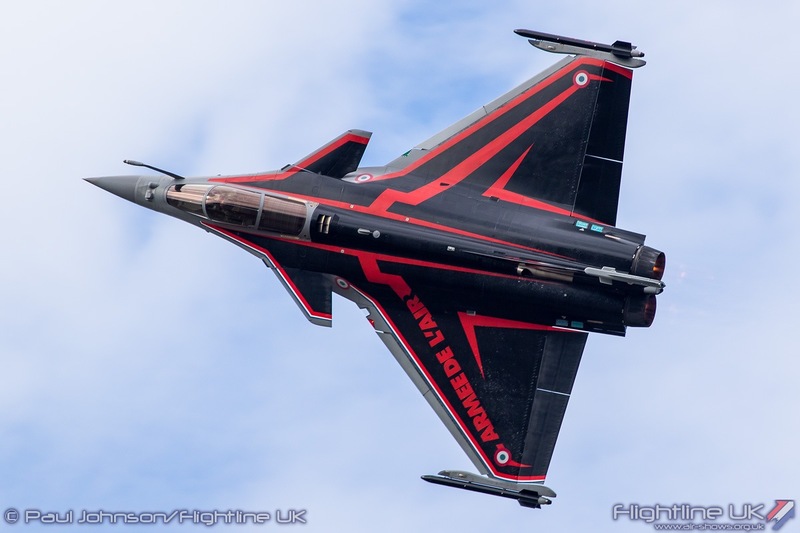 Though not strictly in the competition, the Dassault Rafale C could still be a player in the future of the Belgian Air Force. 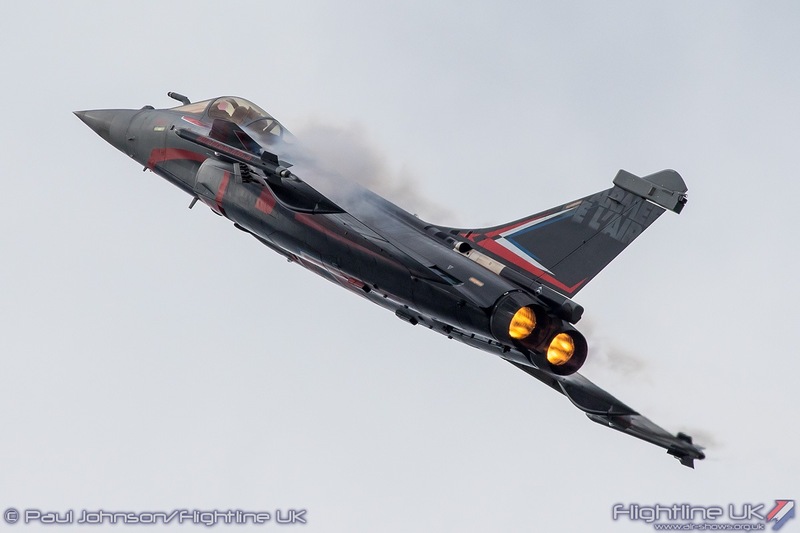 Capitaine Sebestian “Babouc” Nativel from the French Air Force gave his usual stylish account of the Rafale’s agility over Kleine Brogel. 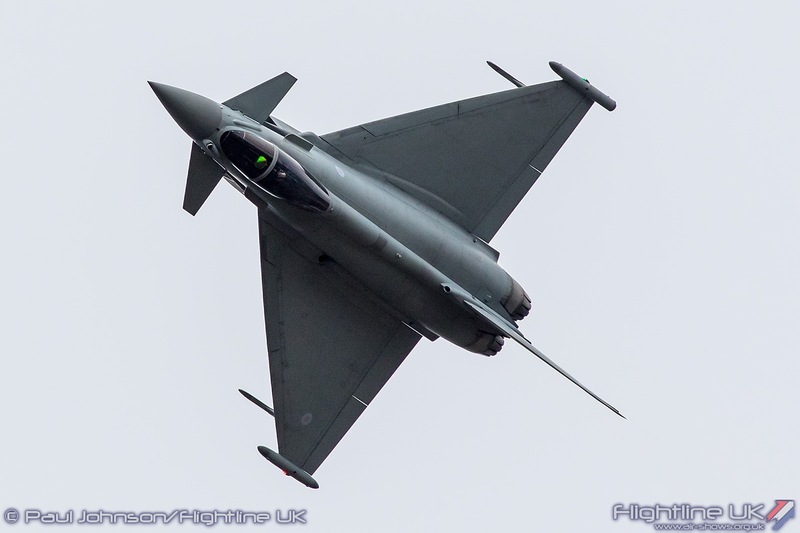 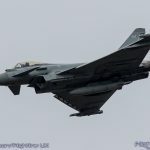 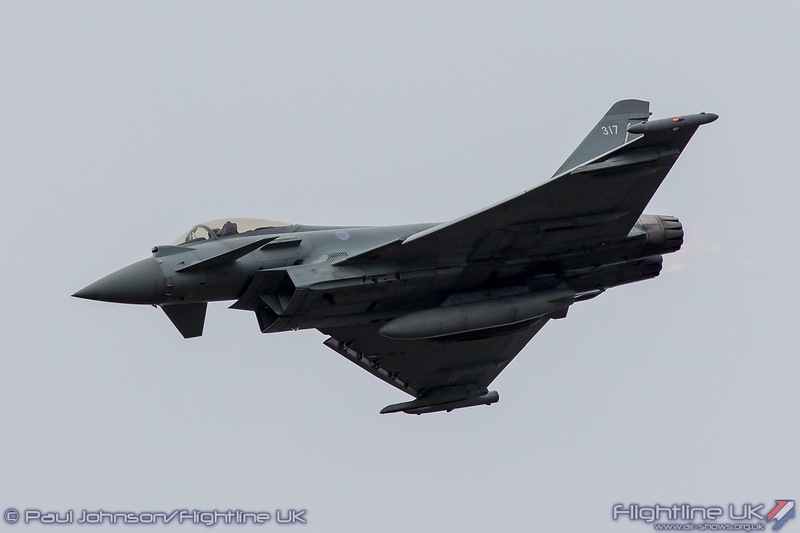 The Eurofighter Typhoon FGR4 is however still in the official competition to replace the F-16s and it was seen in the air courtesy of the Royal Air Force’s Typhoon Display Team headed by pilot Flt Lt Jim Peterson. 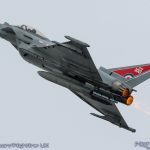 It’s been a busy season for the team in the RAF’s centenary year not only supporting events up and down the UK with the impressive Typhoon display, but also events in Finland, Poland and the Czech Republic. 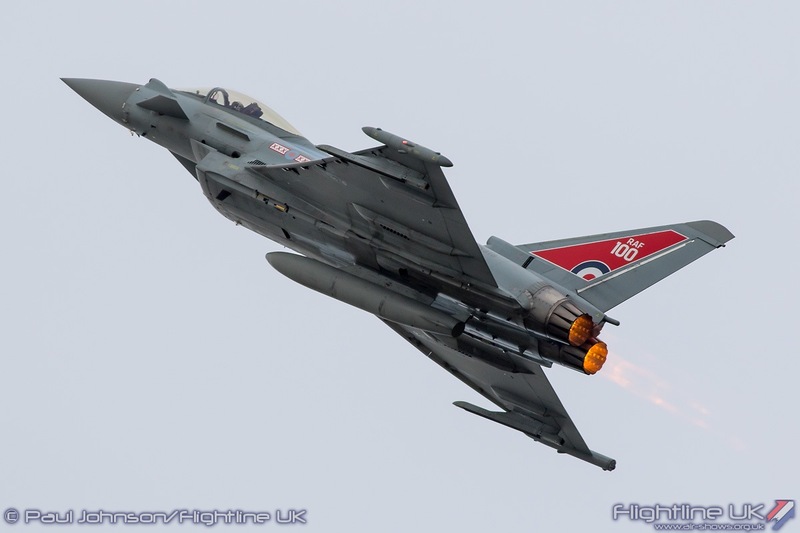 The Typhoon was not the only contribution from the Royal Air Force. 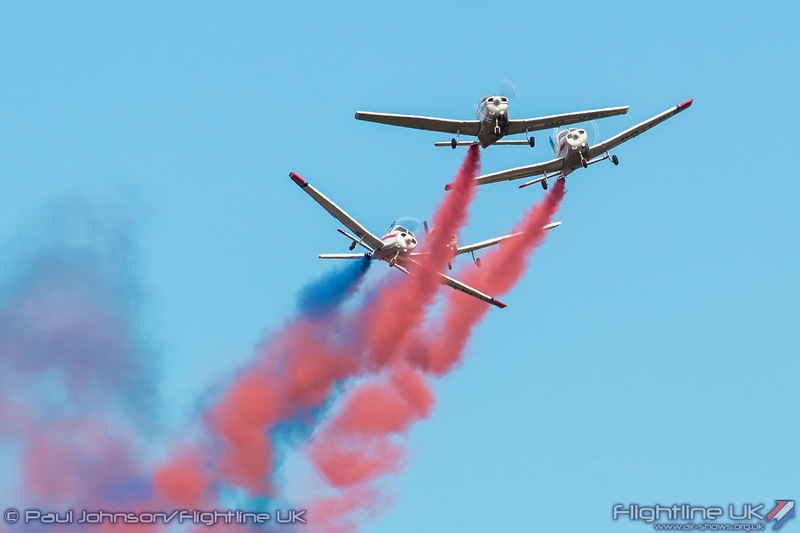 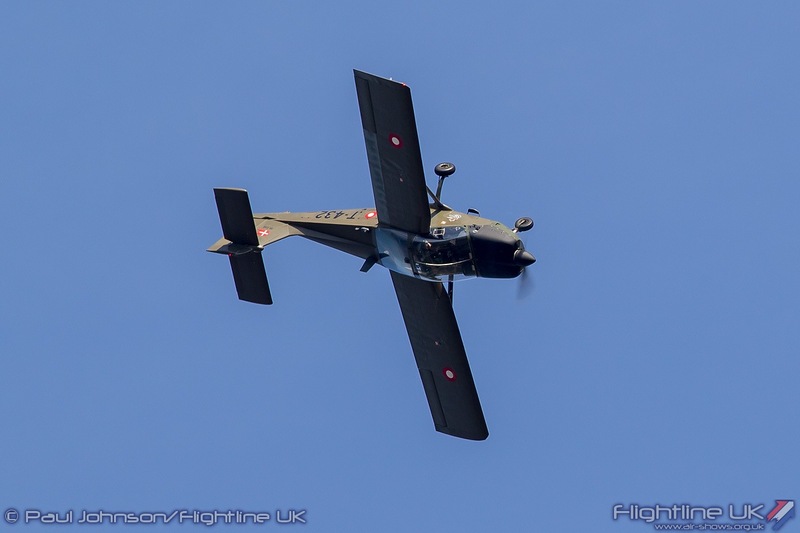 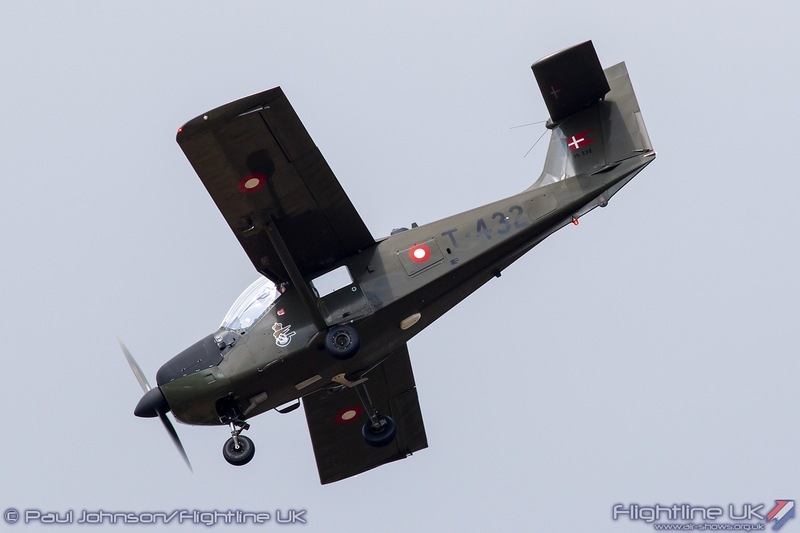 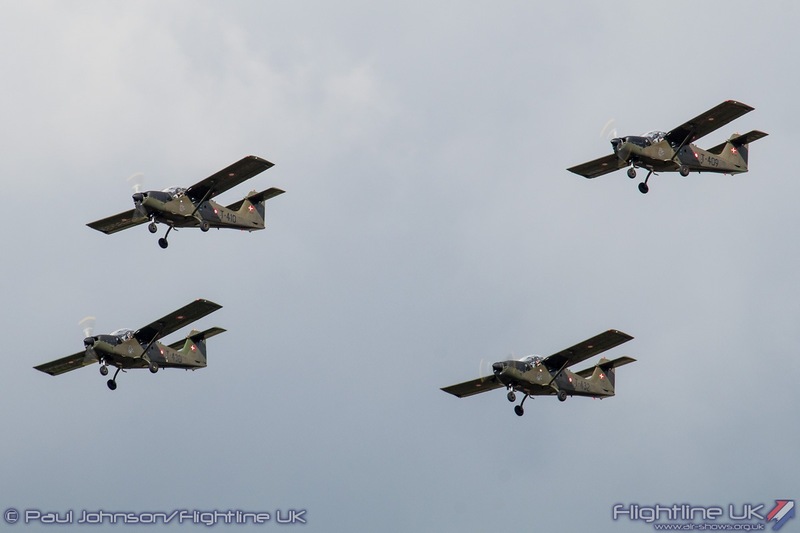 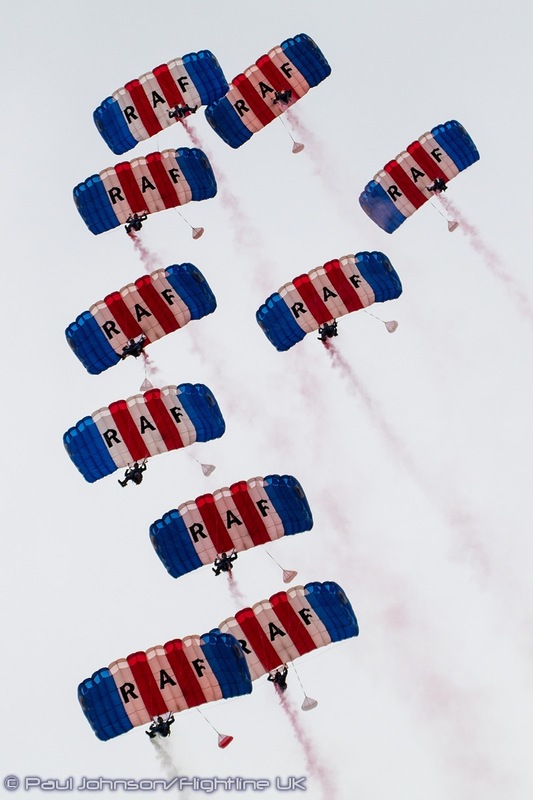 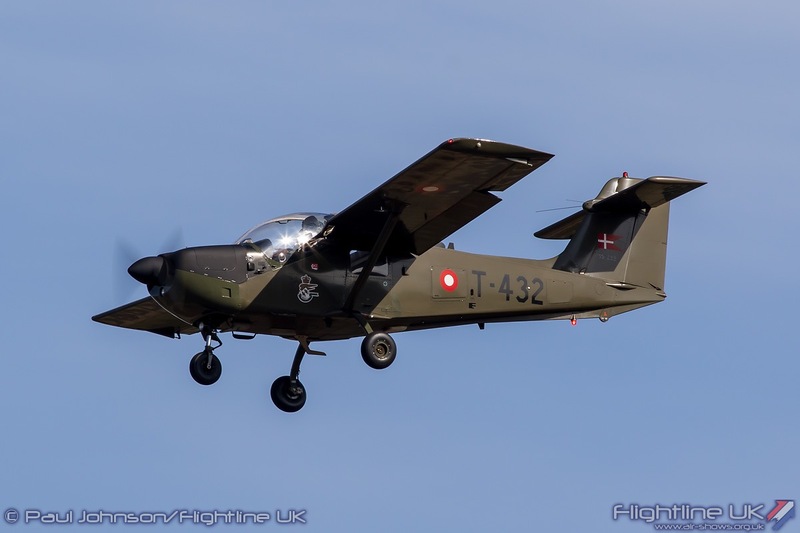 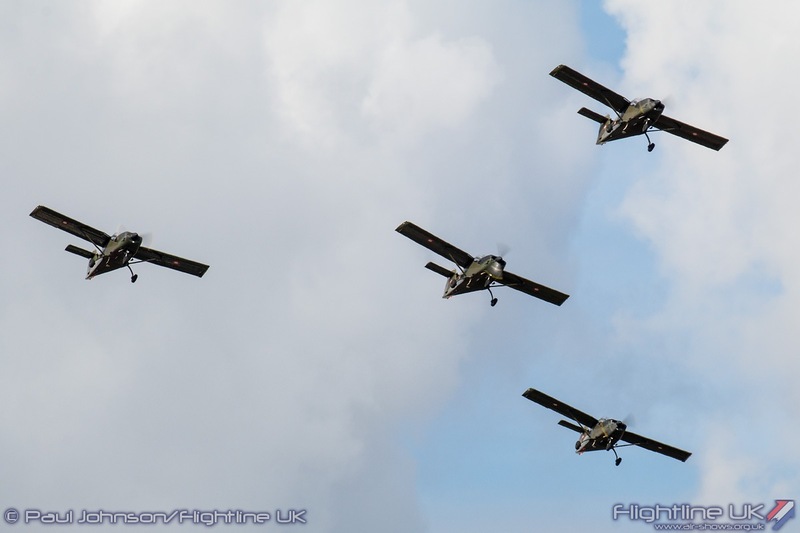 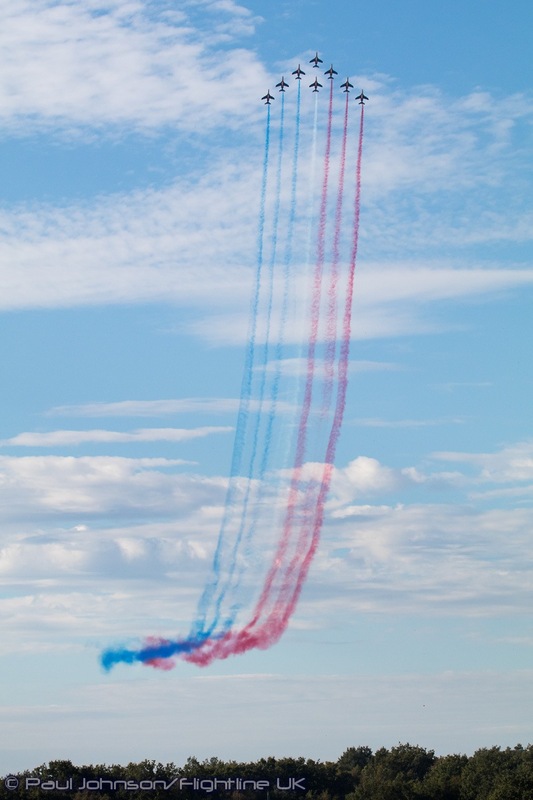 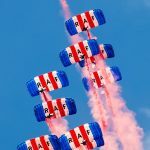 The RAF Falcons Parachute Display Team kept up their tradition of supporting Belgian Air Force Days dropping in on both from their Dornier Do228. 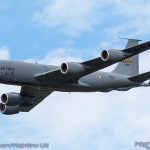 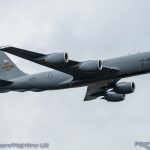 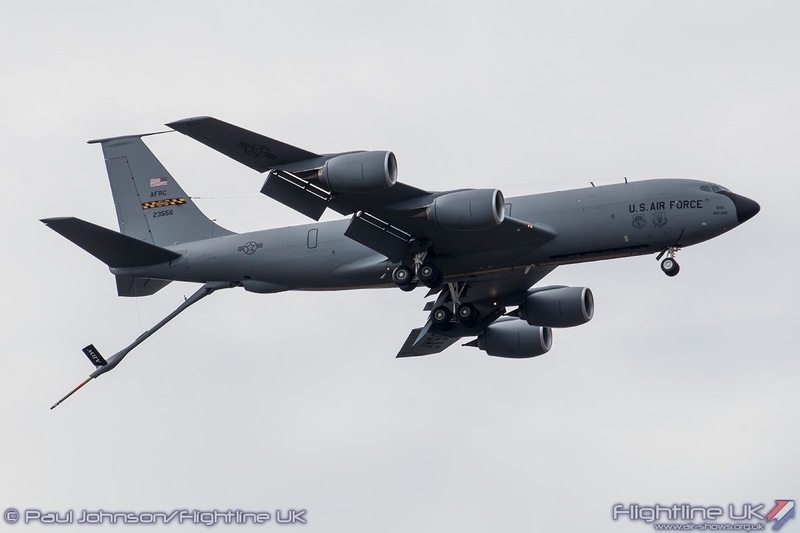 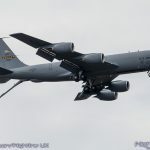 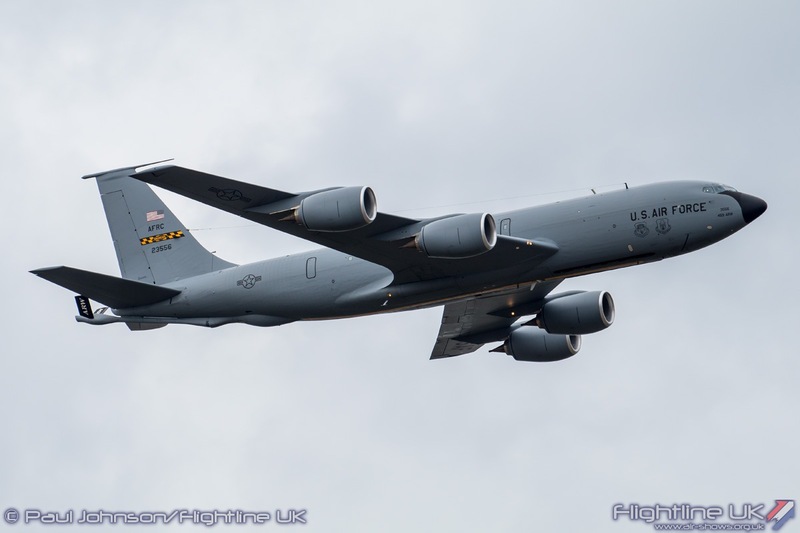 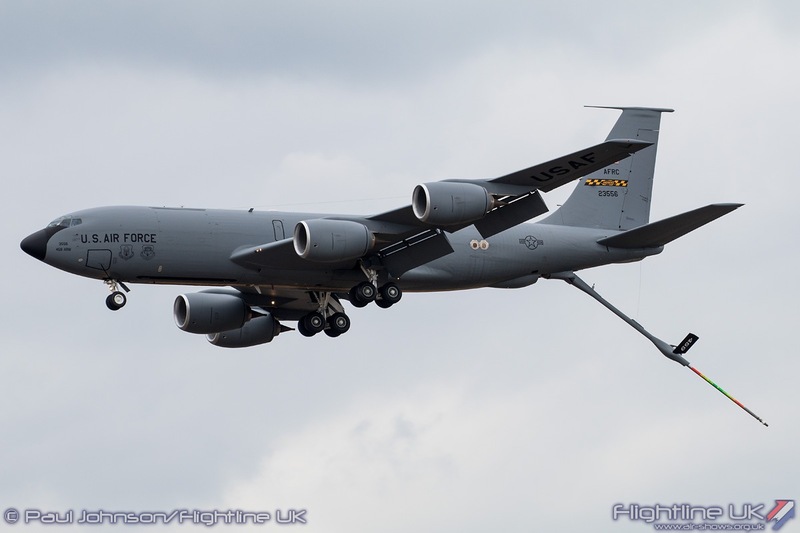 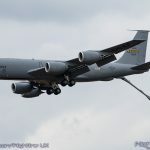 The United States Air Force also made a welcome contribution to the flying display with some flypasts by a Boeing KC-135R Stratotanker from the 459th Air Refuelling Wing. 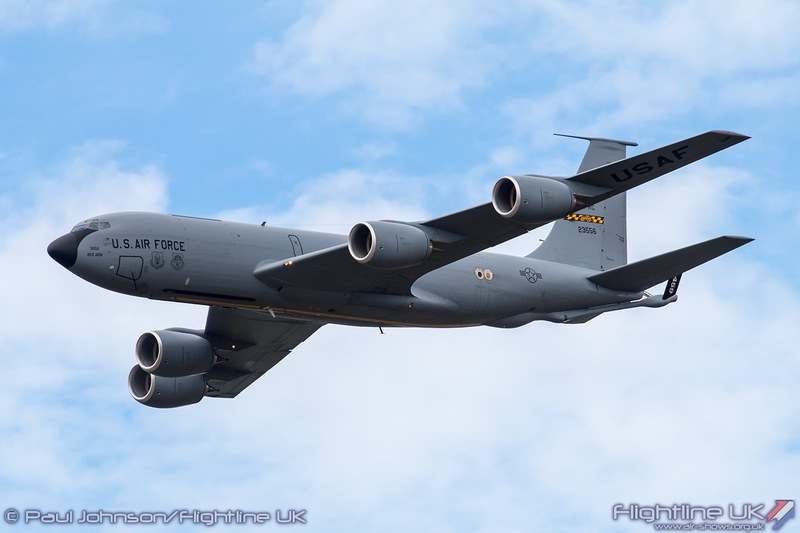 The 459th ARW are based at Joint Base Andrews, Maryland and form part of Air Mobility Command but for Air Force Days based themselves out of Melsbroek, the military part of Brussels Airport. 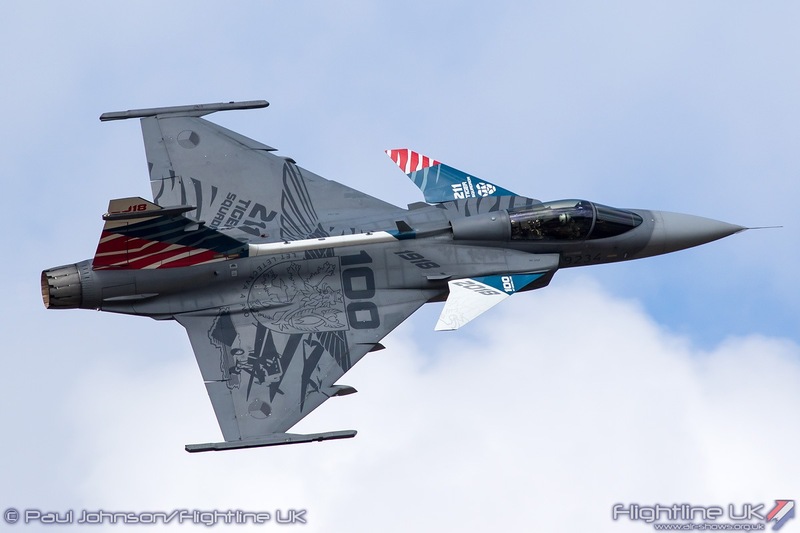 As well as current and future machinery, Air Force Days also celebrated military heritage in the flying. 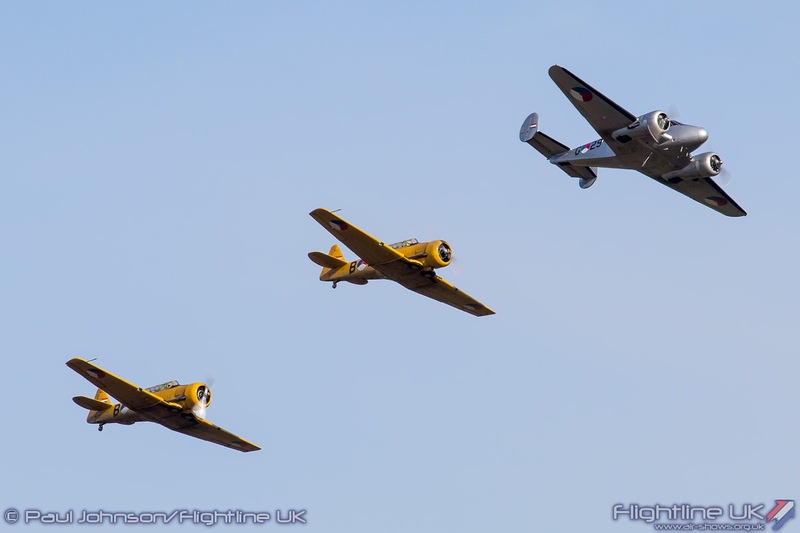 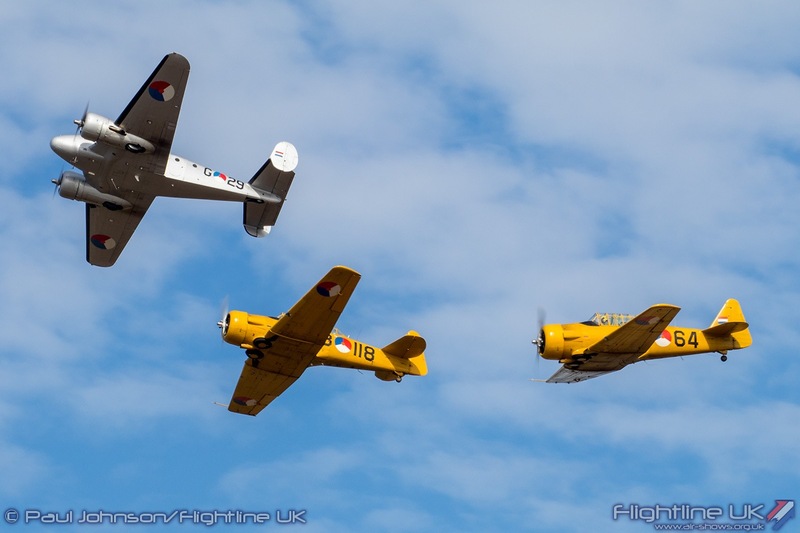 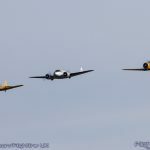 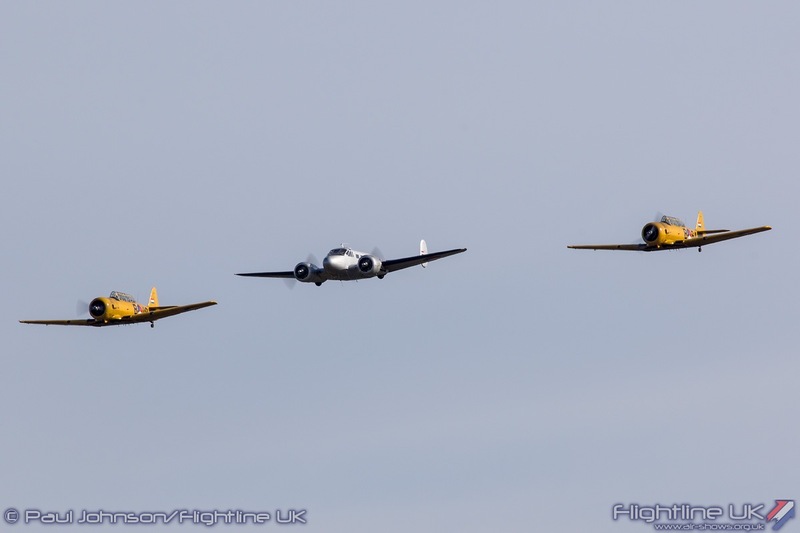 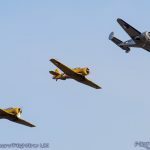 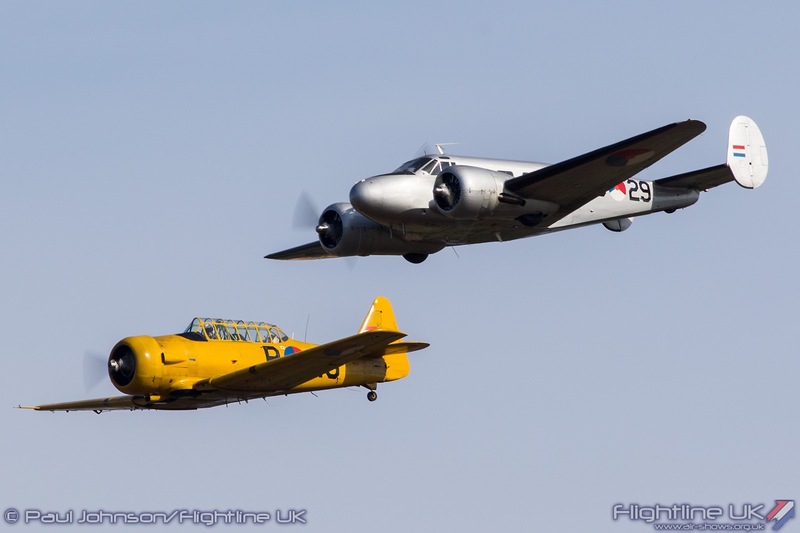 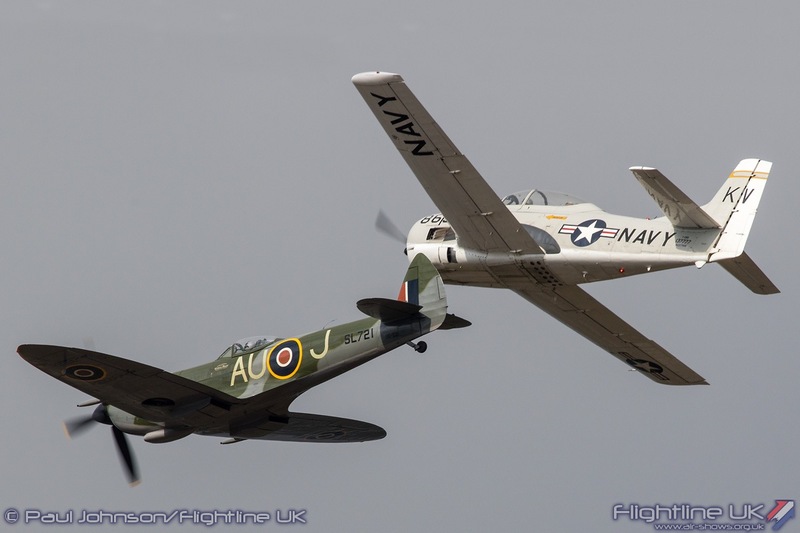 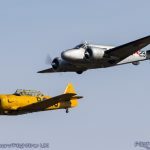 The Royal Netherlands Air Force Historic Flight (SKHV) made an early contribution to each days flying with their Beechcraft D18S-3NM (otherwise known as a T-7 Navigator in Dutch service) flanked by a pair of North American Harvard IIbs. 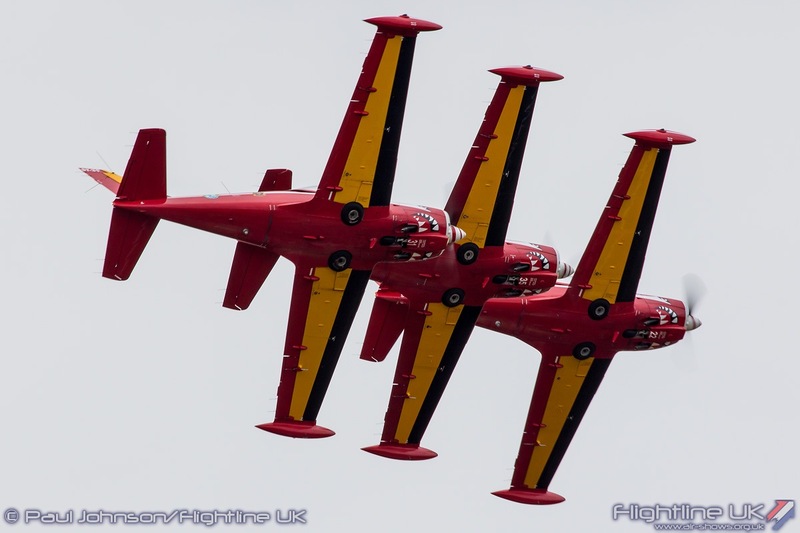 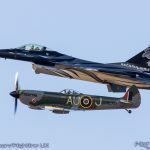 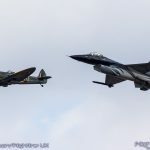 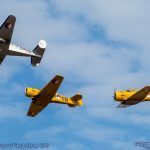 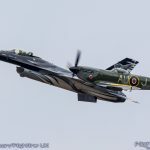 The Belgian Air Force’s own heritage was marked with two very special formations mixing the current Air Force hardware with heritage aircraft. 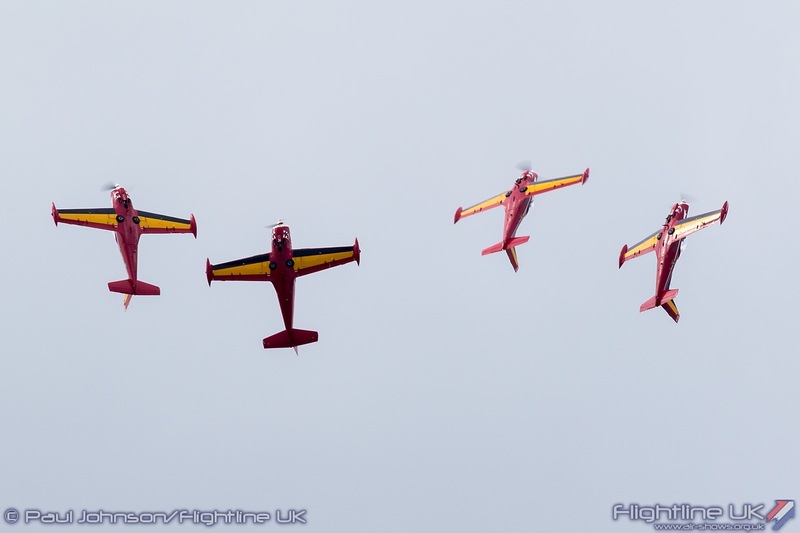 First to appear was the familiar combination of Red Devils formation display team and the Stampe & Vertongen Museum’s Fouga CM170 Magister. 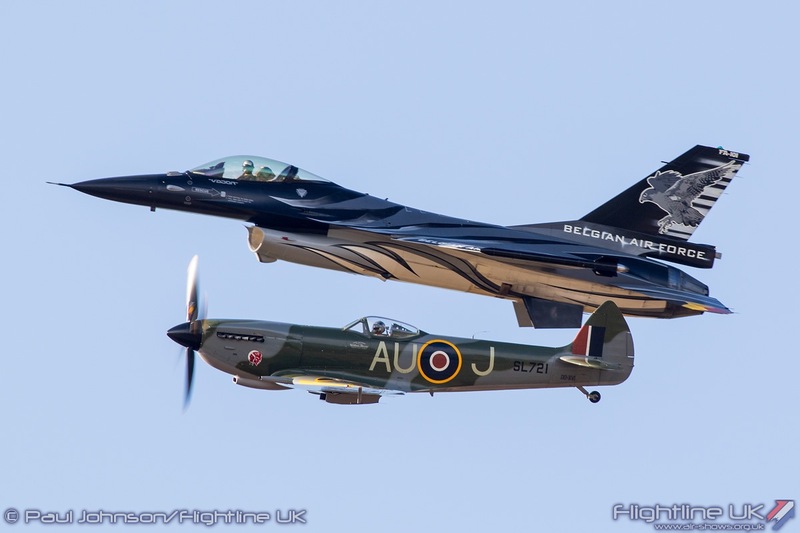 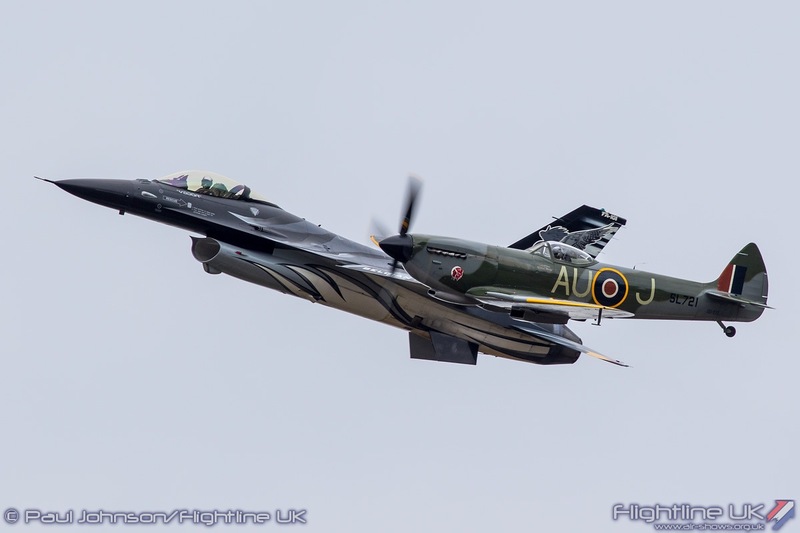 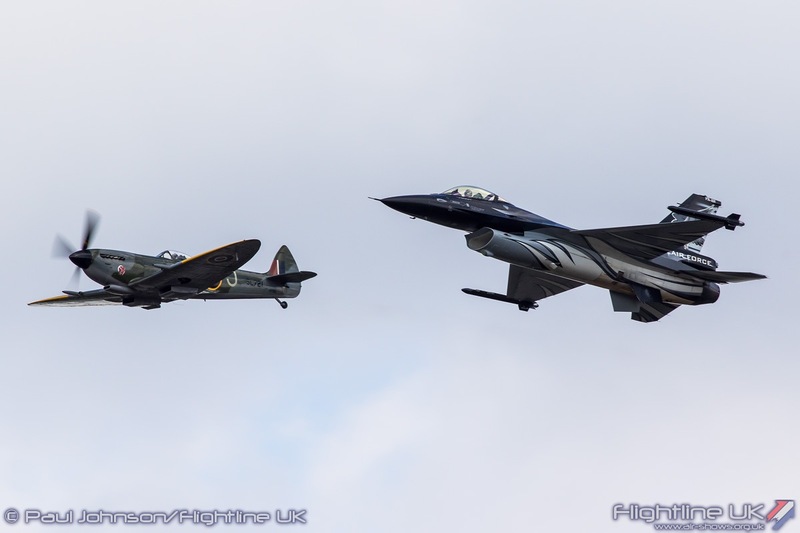 The second formation brought together the Belgian Air Force’s Lockheed Martin F-16AM Fighting Falcon solo display flown by Senior captain aviator Stephan ”Vador” Darte with Supermarine Spitfire XVI (SL721/OO-XVI) flown by Kris Van Den Bergh. 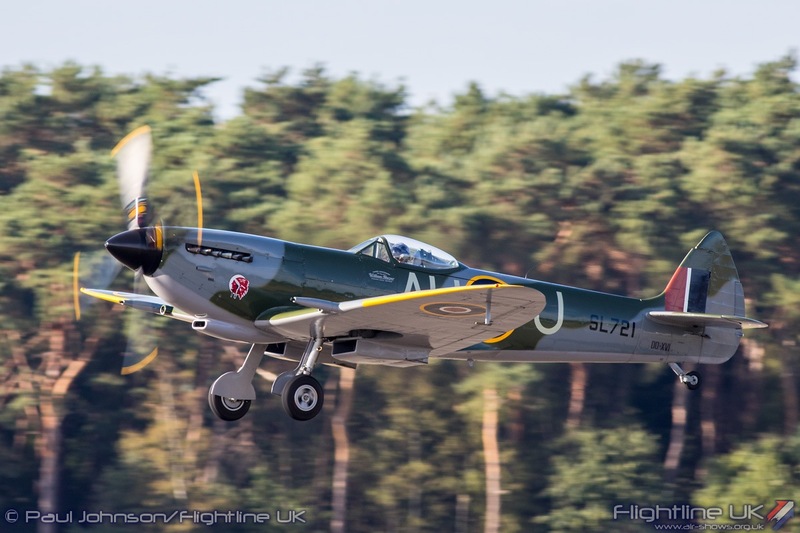 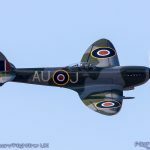 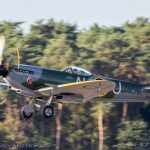 The Spitfire has recently been imported into Belgium from Canada and is part of a growing “warbird” scene in the country. 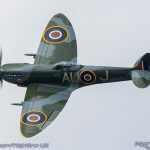 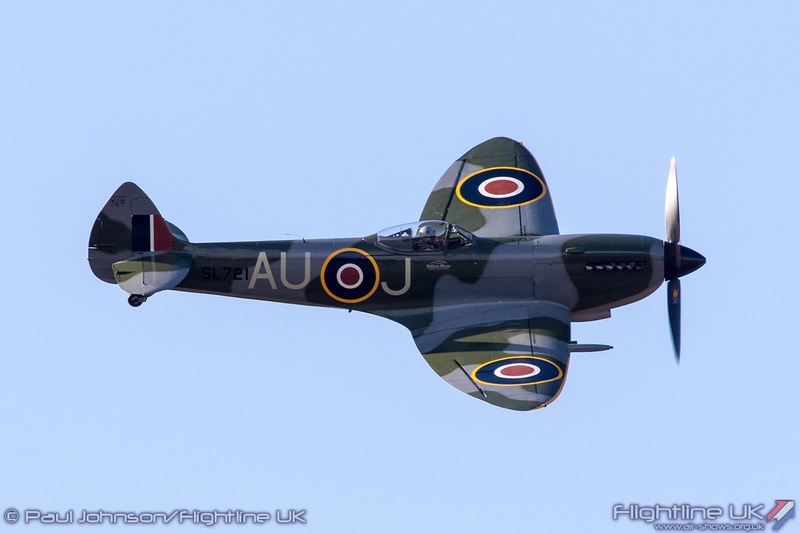 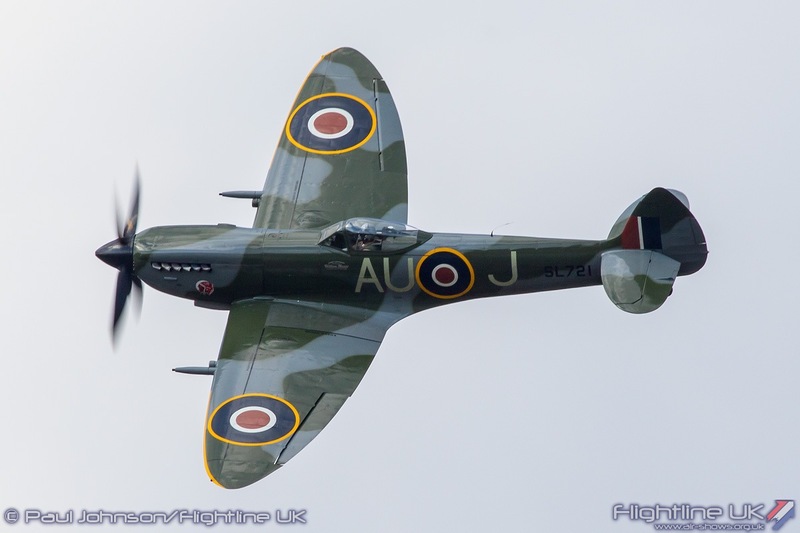 SL721 has quite a history having been the personal aircraft of Air Vice Marshal Sir James M. Robb who had the Spitfire painted in a distinctive light blue scheme. 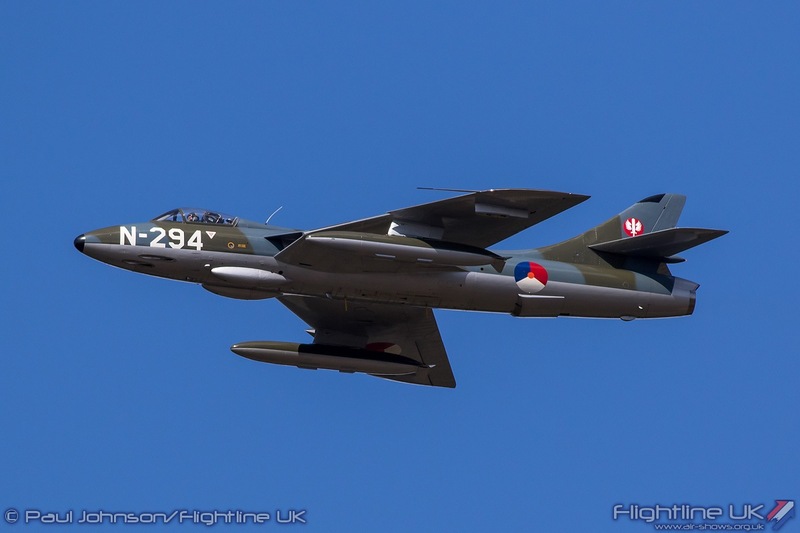 Its current scheme is of 421 Squadron of the Royal Canadian Air Force. 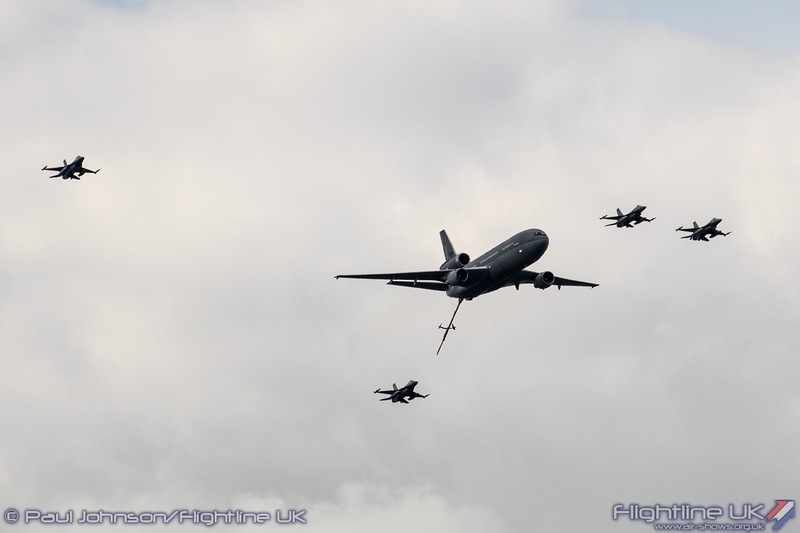 The Red Devils and the solo F-16 were not the only Belgian Air Force aircraft in the flying display. 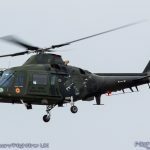 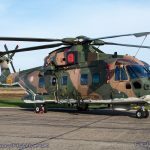 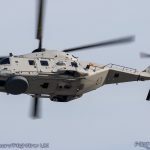 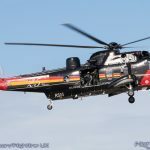 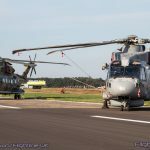 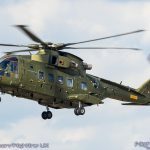 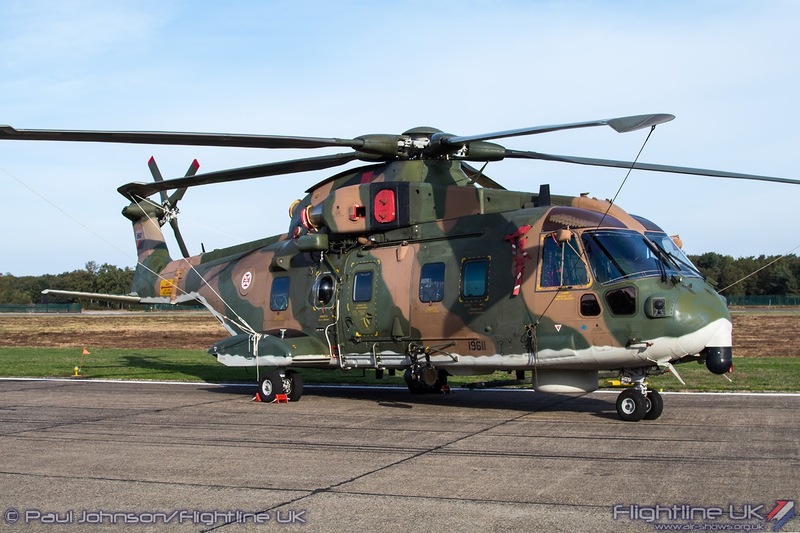 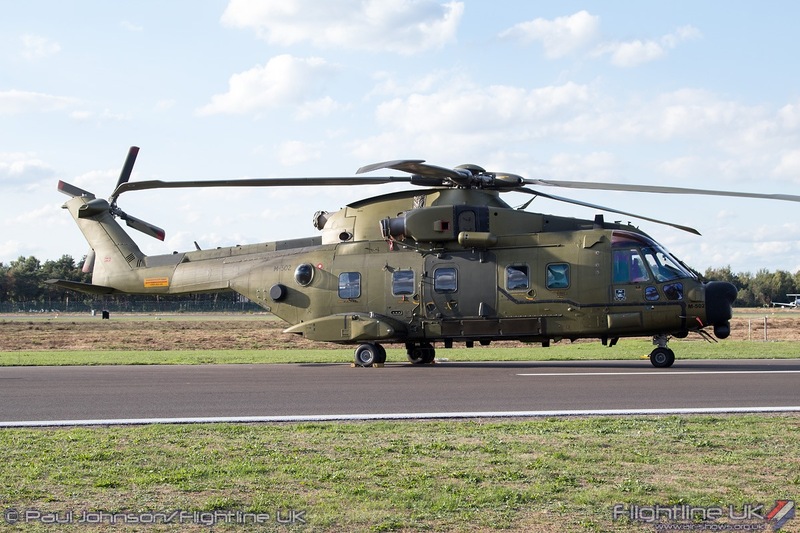 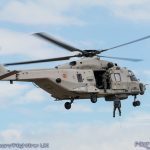 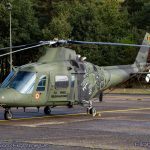 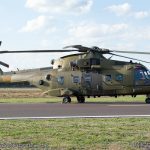 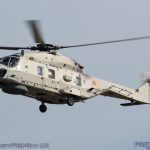 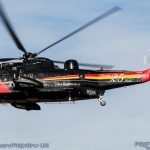 2018 is the last full year of operations for the Belgian Air Force’s venerable fleet of Westland Sea King Mk.48s operated by 40 Squadron and Kleine Brogel witnessed the last ever public demonstration by the type. 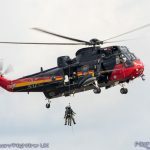 The Sea King attracts a great deal of public affection in Belgium due to its Search and Rescue role and that the type starred in a TV series called ‘Windkracht 10’ (Storm Force 10). 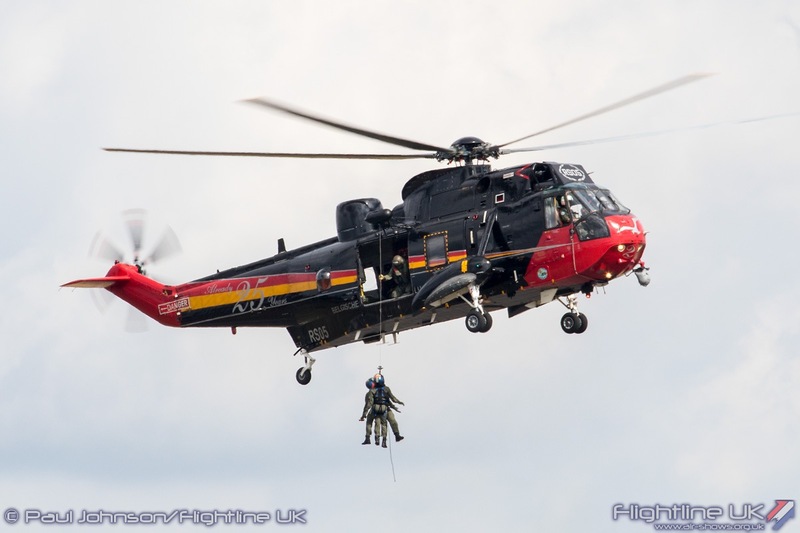 The Sea Kings entered service in 1976 and have seen over 42 years of service. 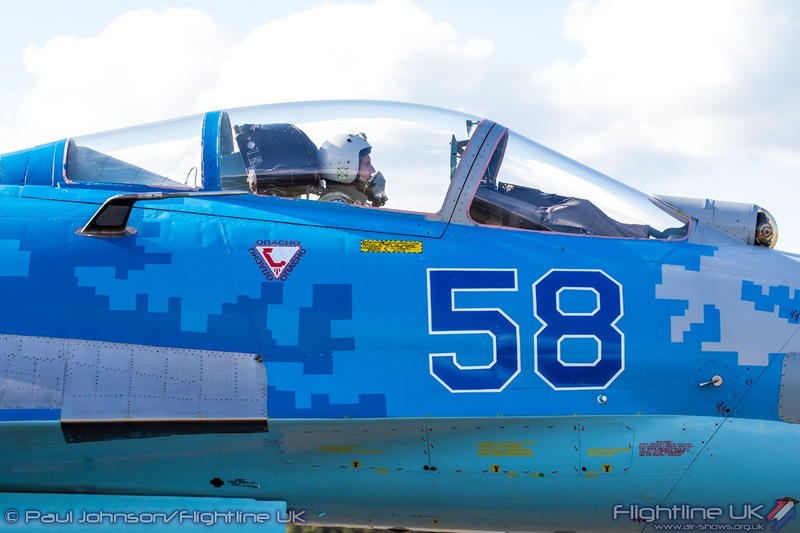 For the final display, 40 Squadron sent RS-05 which still wears the attractive 25th Anniversary markings applied in 2001! 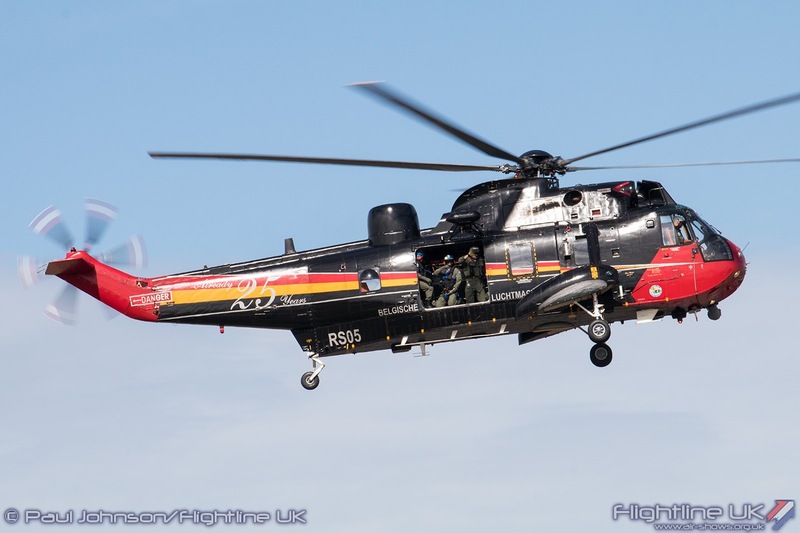 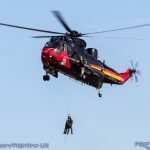 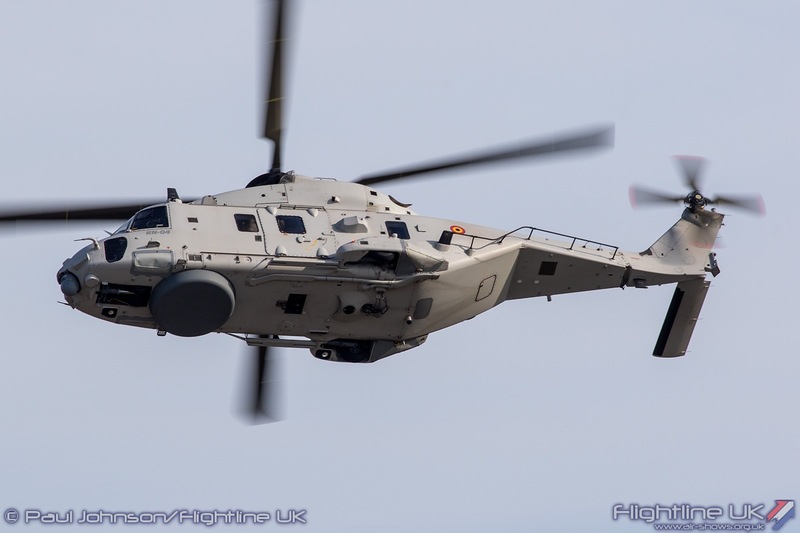 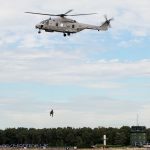 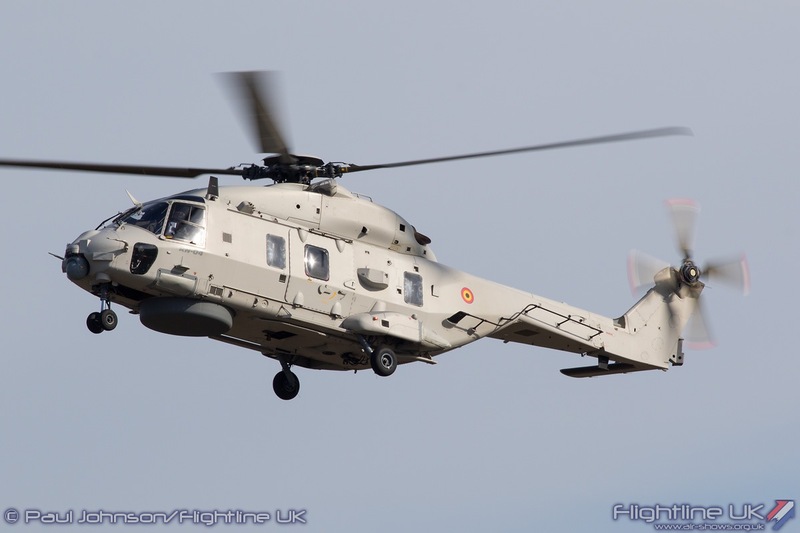 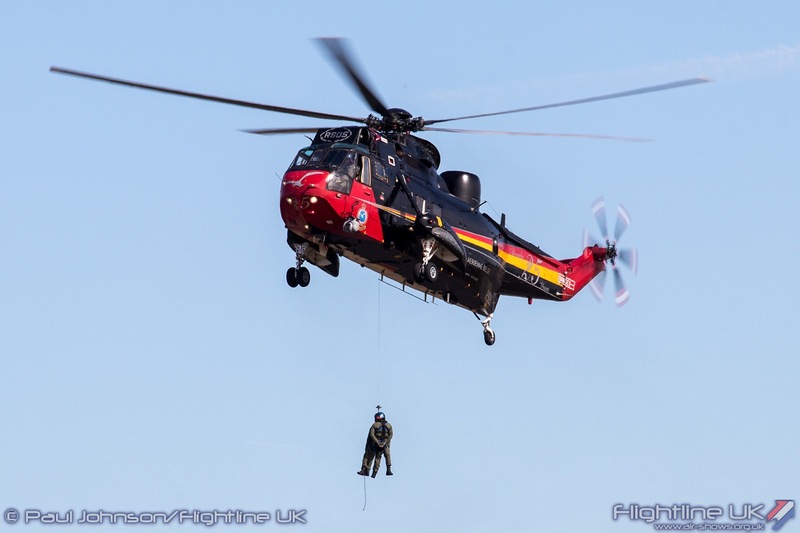 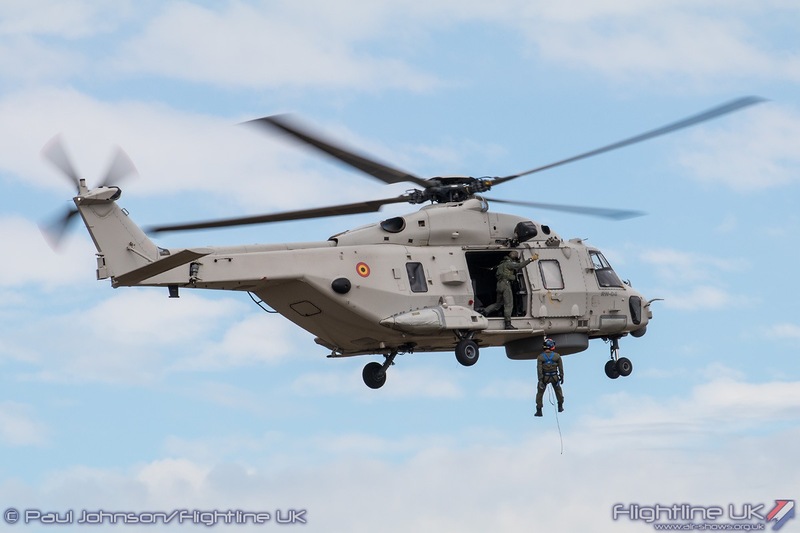 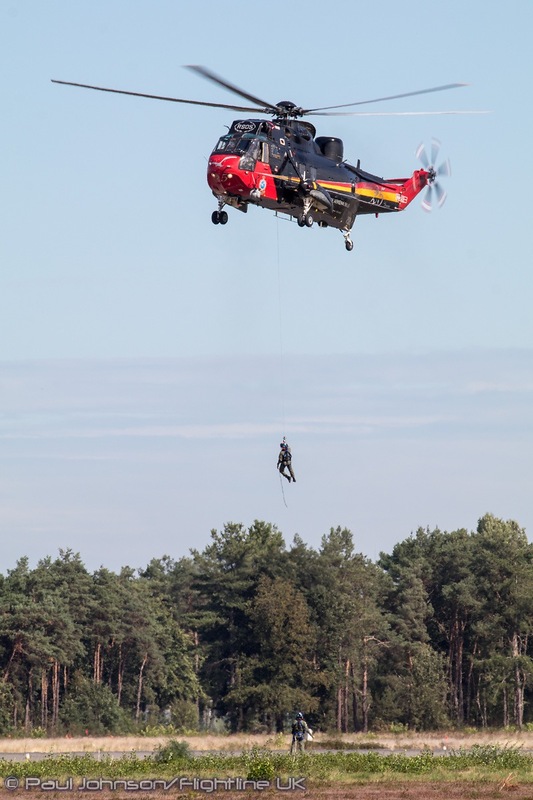 The Sea King’s successor will be the NH Industries NH90NFH Caiman and that also performed a search and rescue demo. 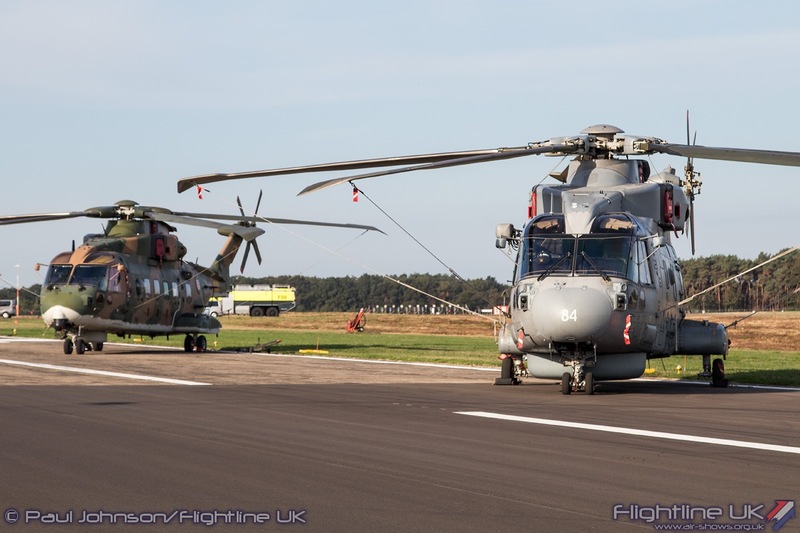 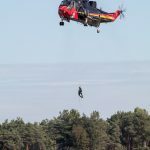 Sunday’s display by the NH90 came with an extra emergency services demonstration after one of the crewman’s flares started a grass fire out on the airfield curtailing the NH90s performance! 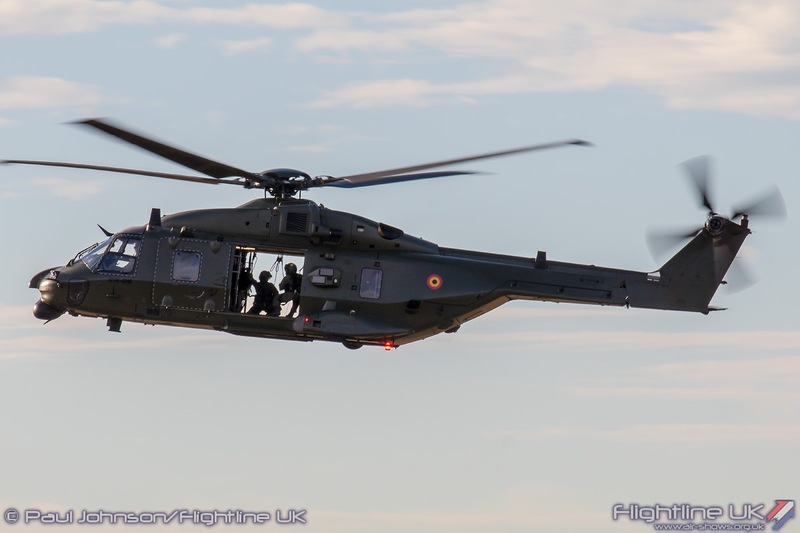 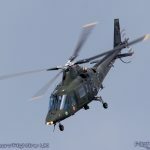 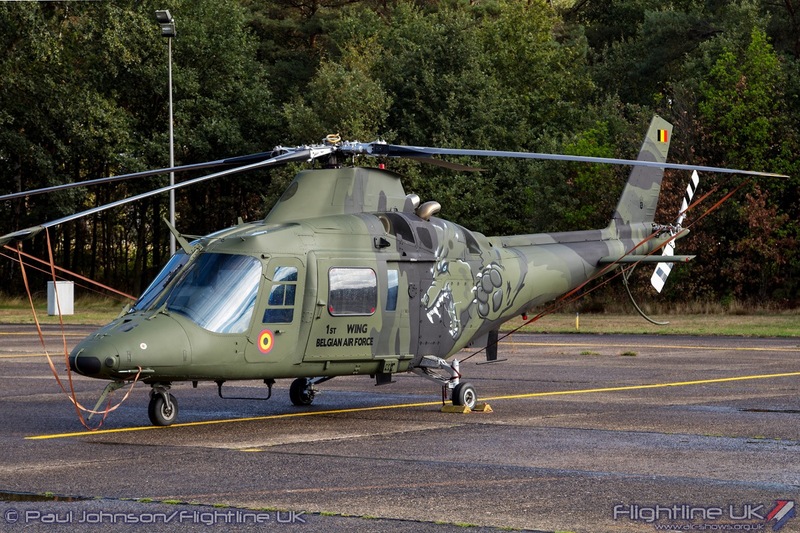 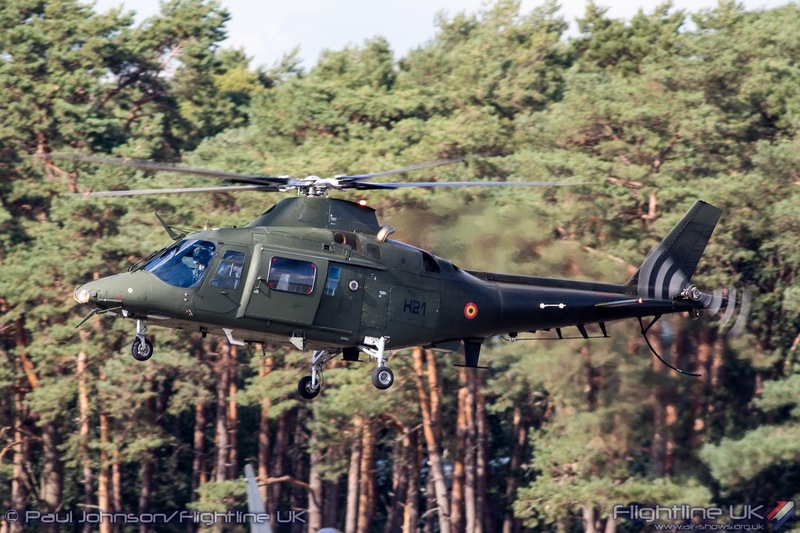 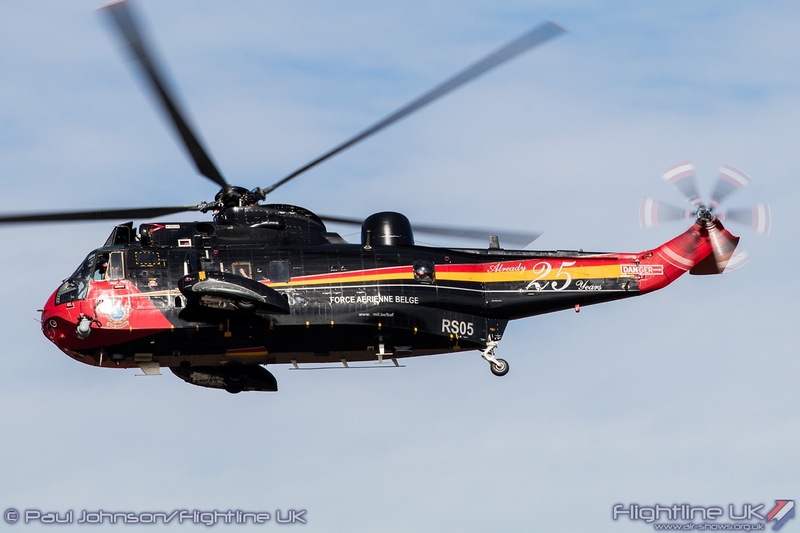 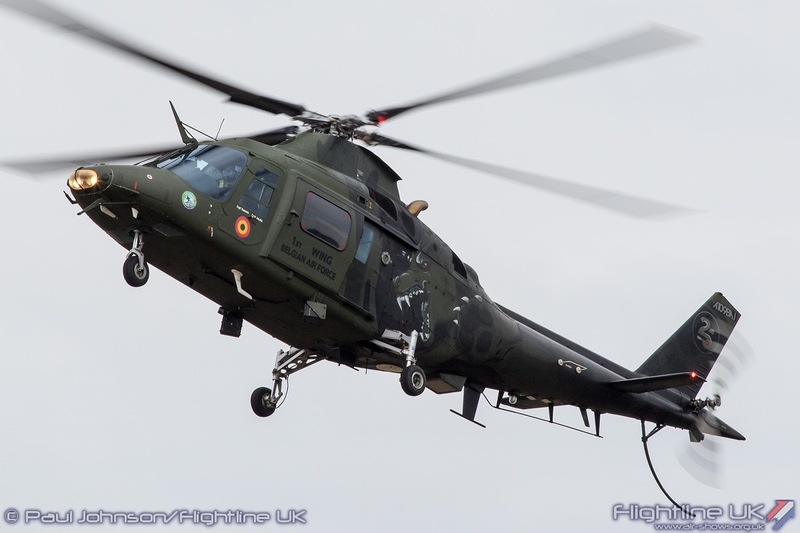 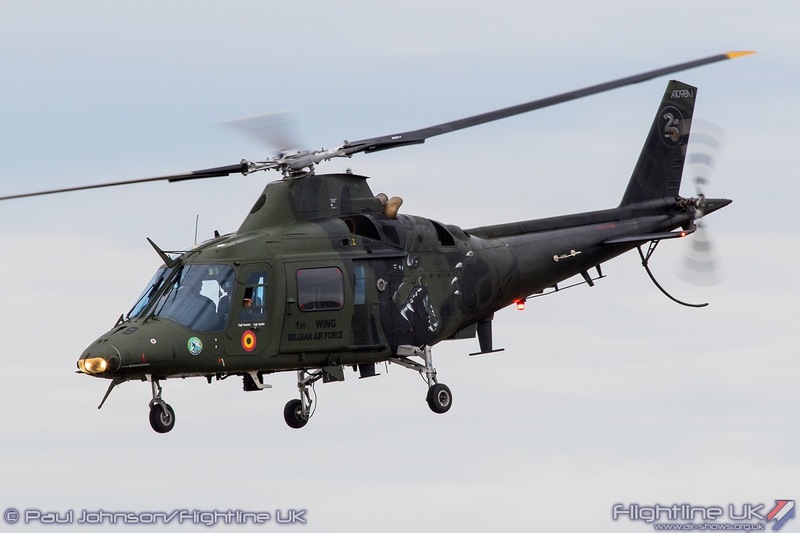 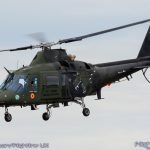 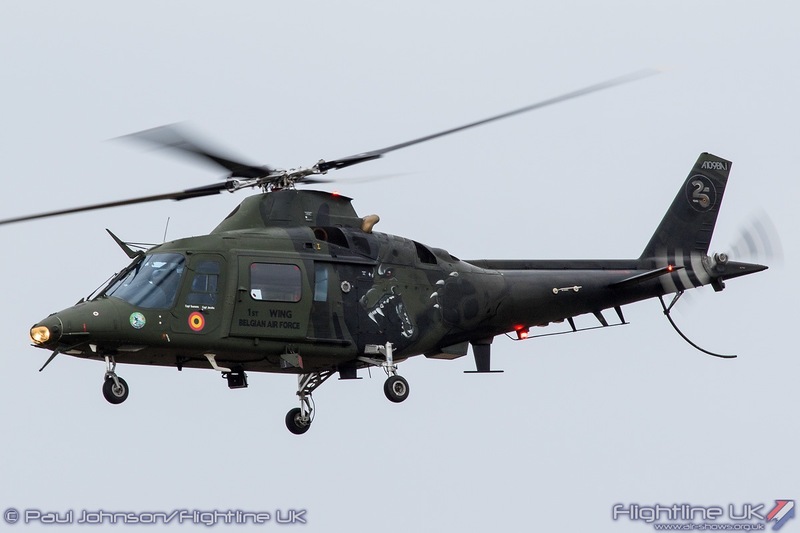 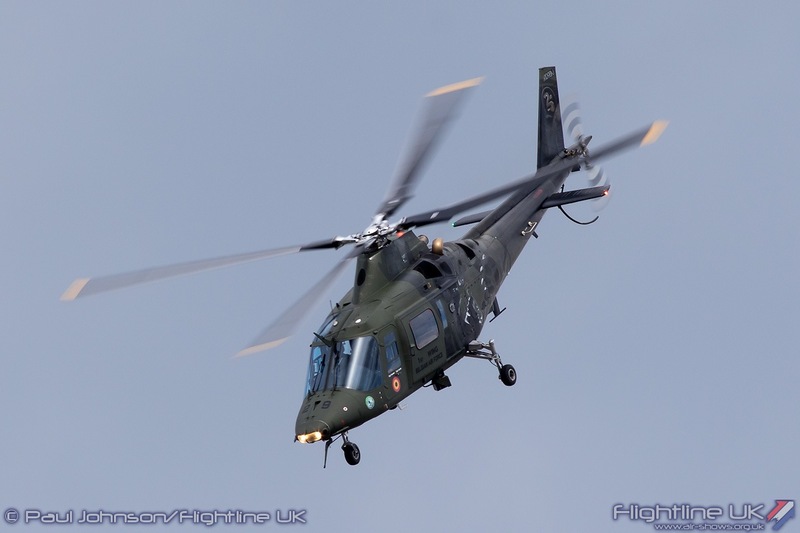 Completing the collection of Belgian helicopter displays was the Agusta A109BAi from 17 Squadron based at Beauvechain. 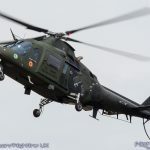 The A109 is a versatile machine capable for performing a variety of tasks such as anti-tank missions, medevac and troop transport. 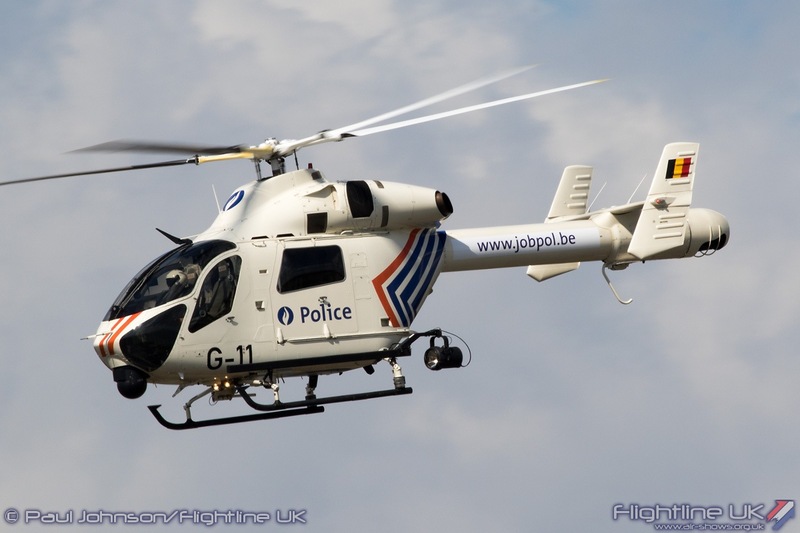 It is also a very agile machine as demonstrated by Captain Stijn Stoenens and Captain Jo “J.J.” Jacobs. 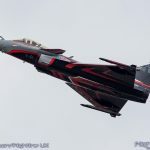 The “ThunderTigers” display from 31 Squadron at Kleine Brogel is usually a unique display to Sanicole Airshow. 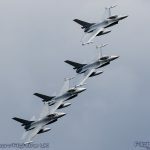 It was however added to the Air Force Days line-up this year in place of the Air Power Demo. 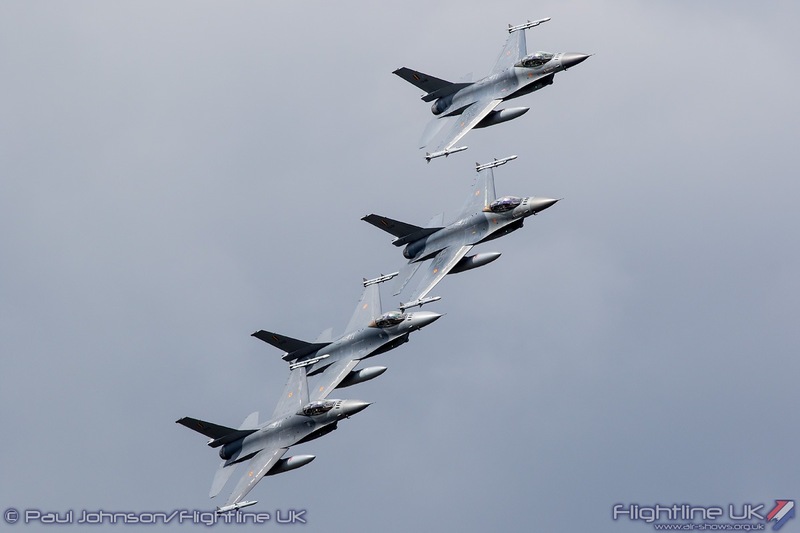 The display, from four Lockheed Martin F-16AM Fighting Falcons, is a mix of role demonstration and airshow display with aircraft performing strafing attacks, bombing runs and close formation work during the sequence. 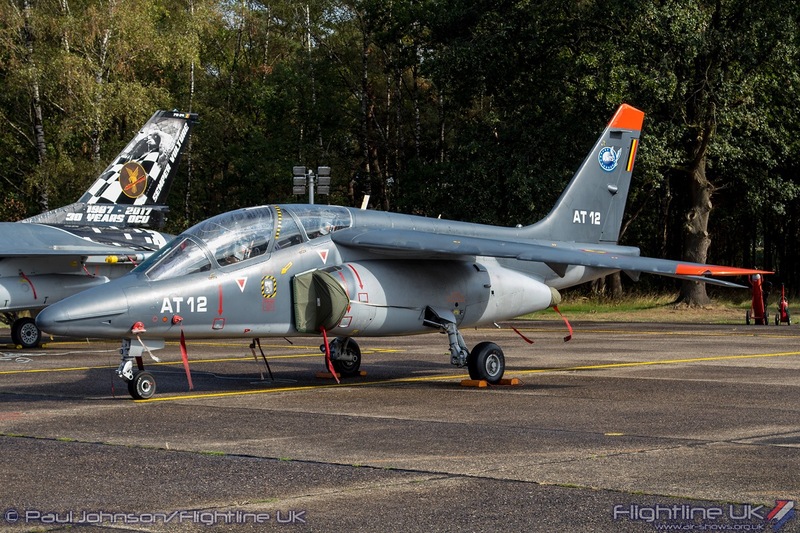 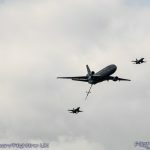 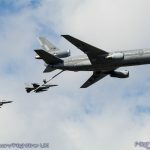 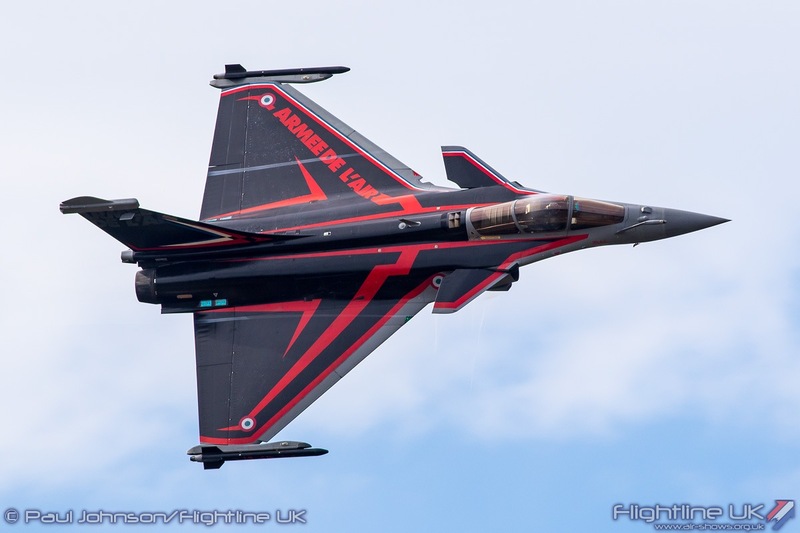 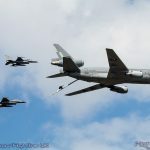 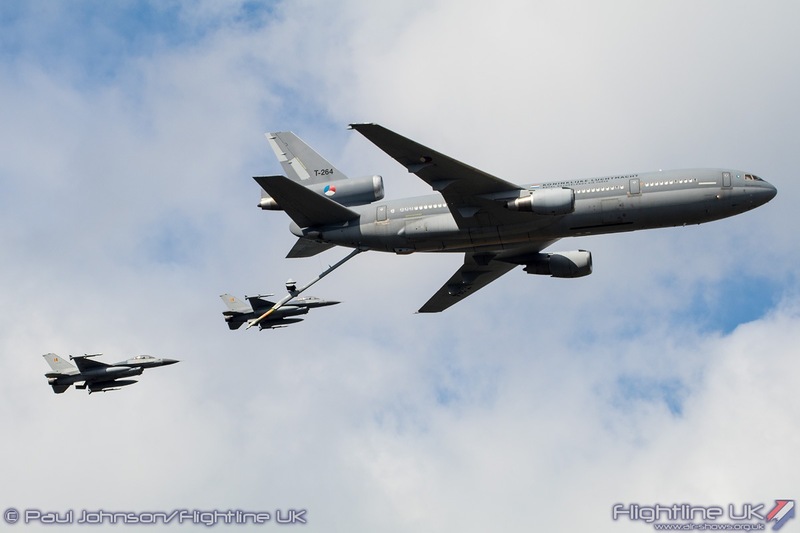 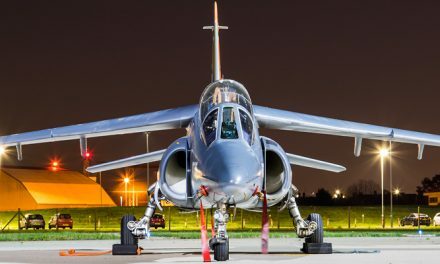 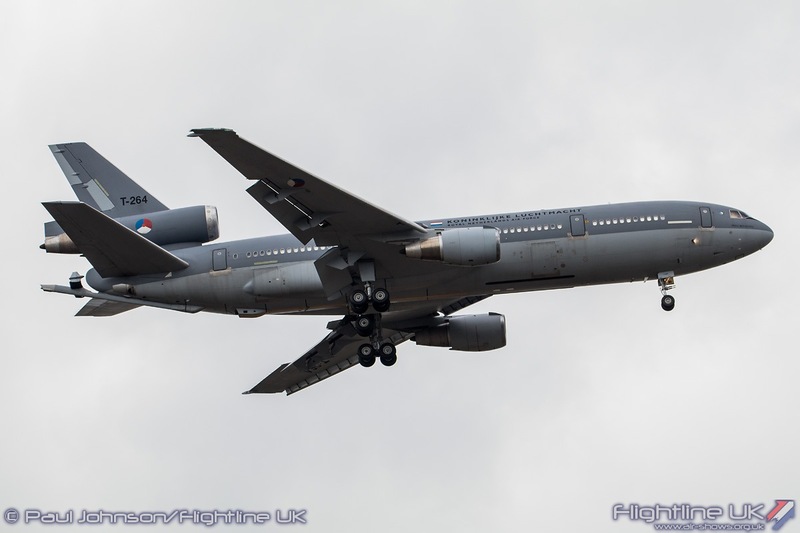 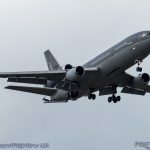 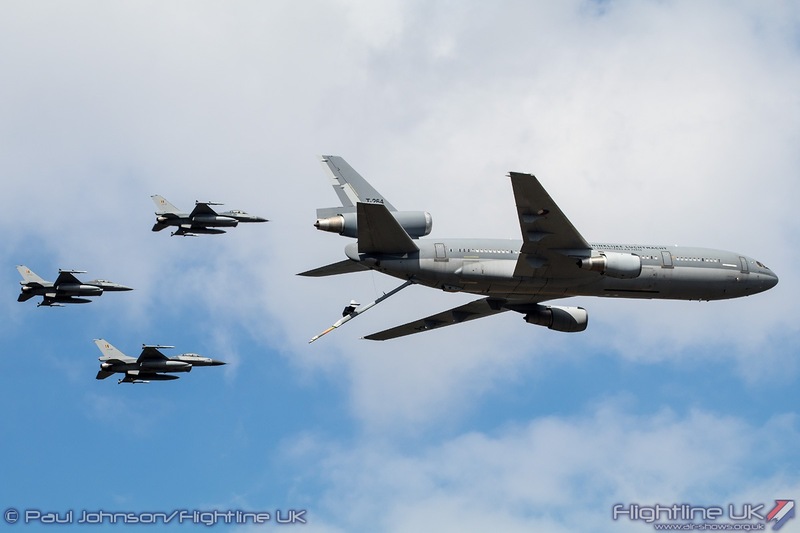 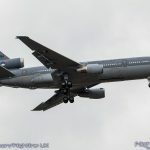 On Saturday, the display also highlighted that the Belgian Air Force operates alongside its NATO partners with a refuelling demonstration opening the display with a Royal Netherlands Air Force McDonnell Douglas KDC-10 Extender. 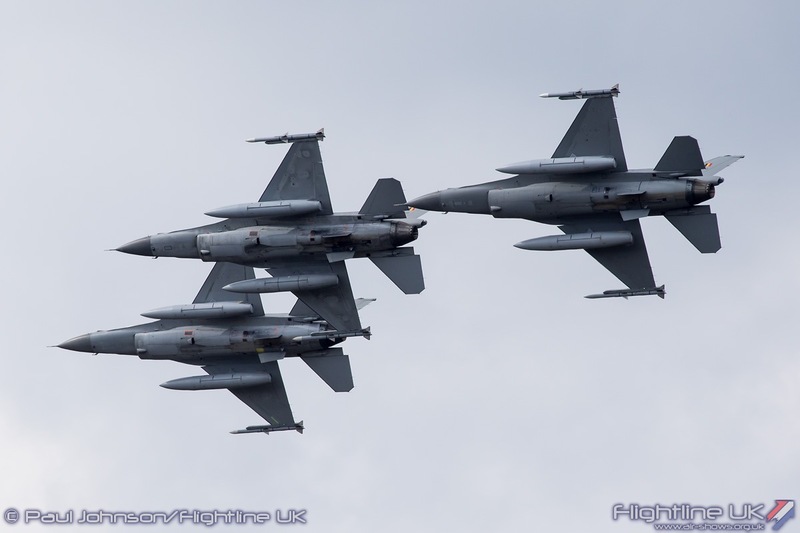 Just two big jet teams made it to Kleine Brogel this year. 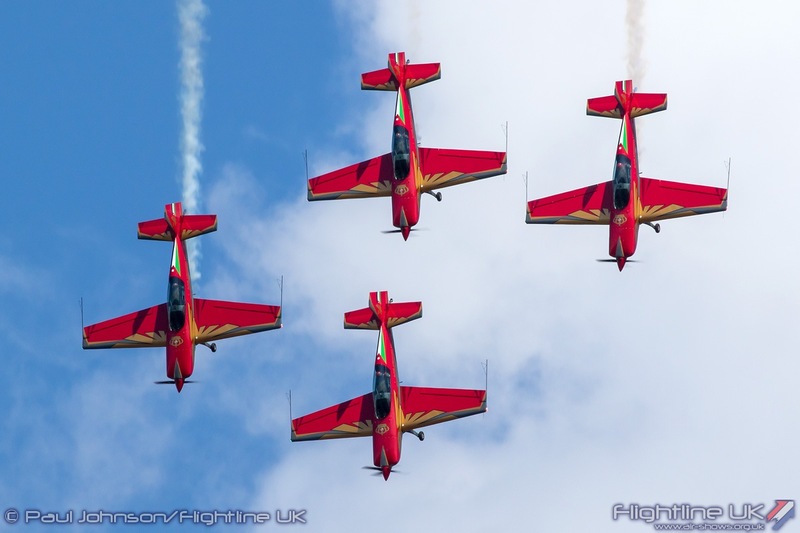 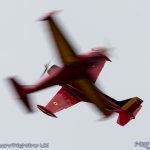 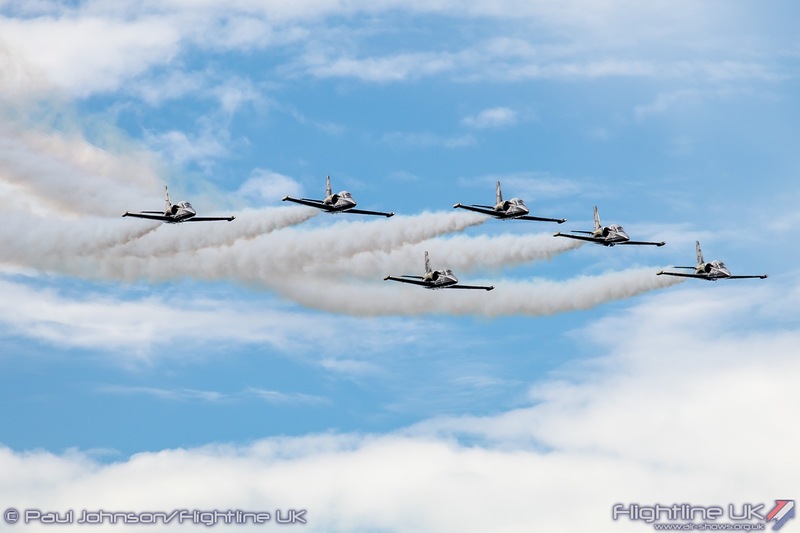 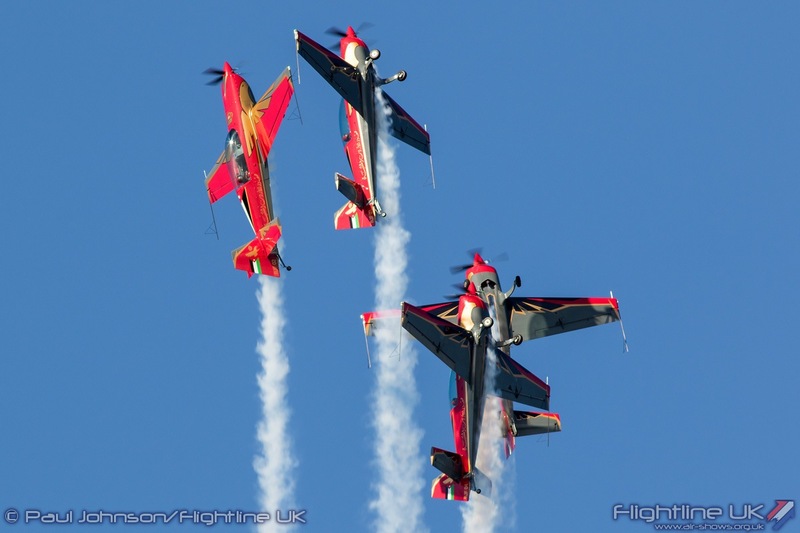 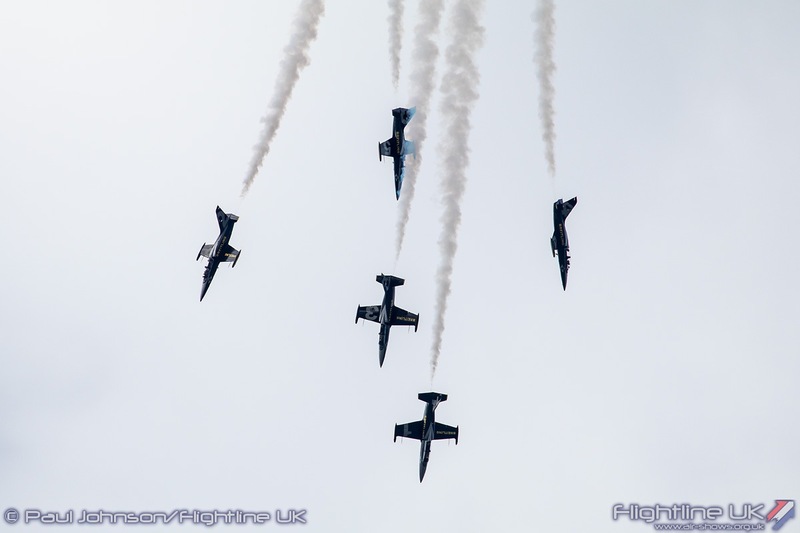 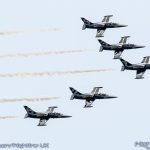 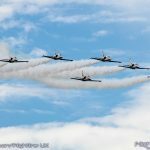 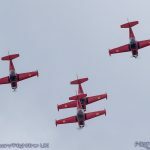 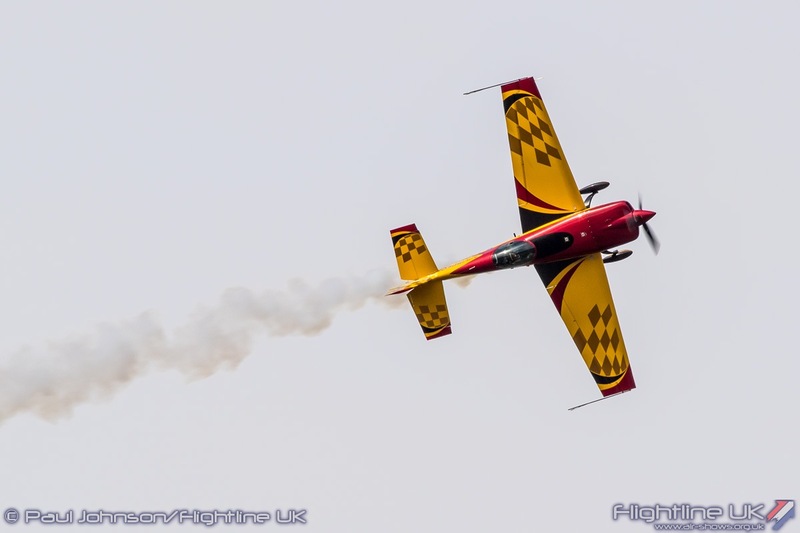 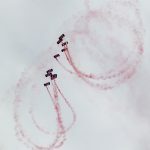 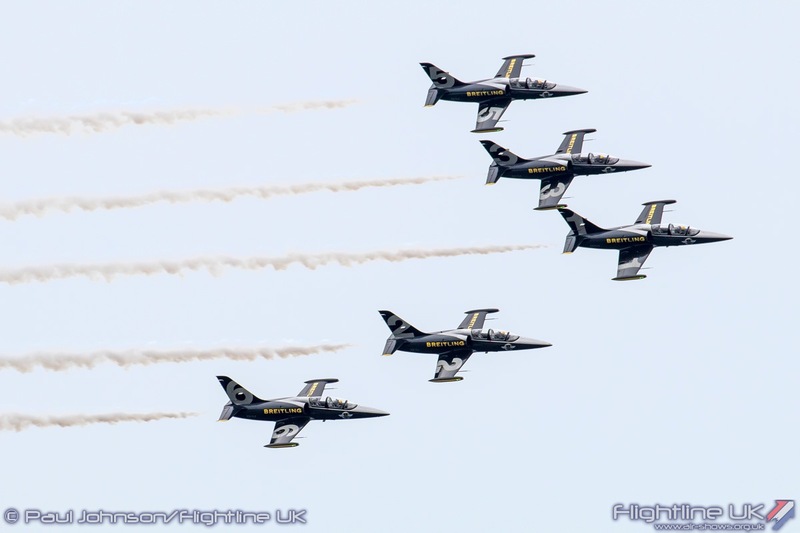 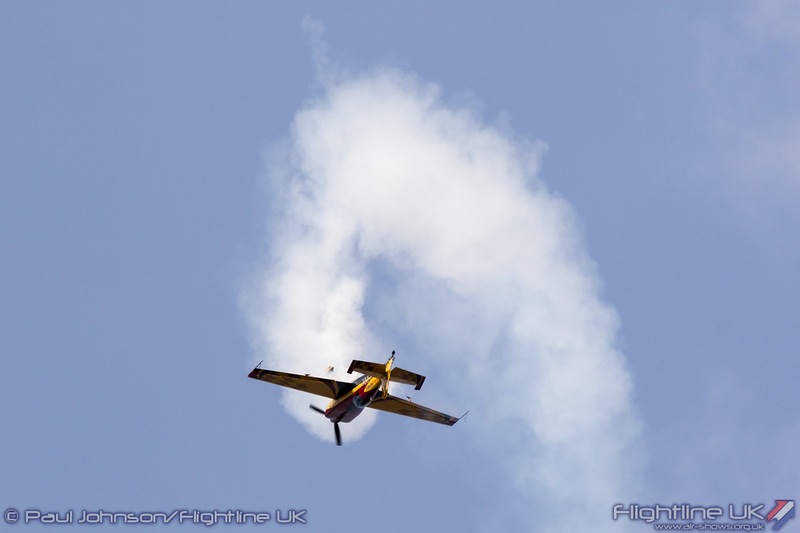 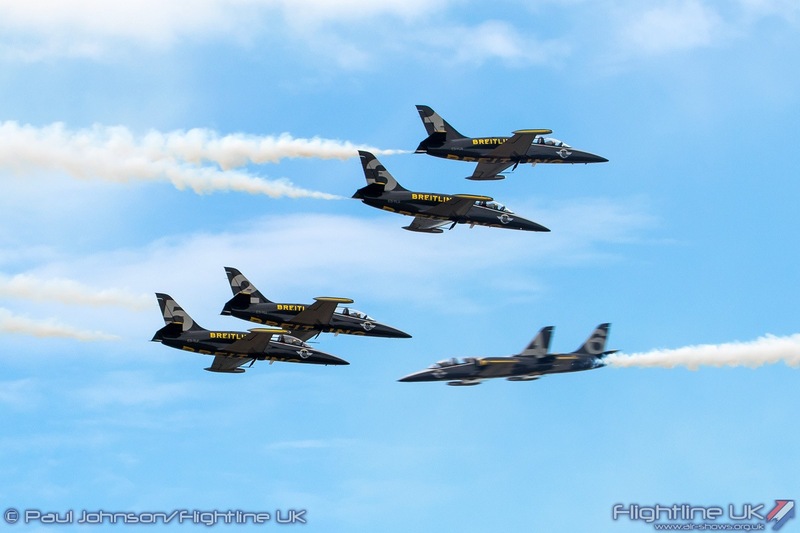 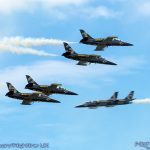 Performing on both days were the Breitling Jet Team with their six Aero Vodochody L-39C Albatross aircraft and closed the flying display on the Saturday. 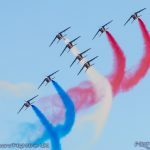 The team who are based in France have performed across Europe, the Middle East, Asia and North America is renowned for their precise and elegant display which was greatly appreciated by the Belgian audience. 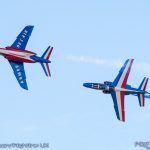 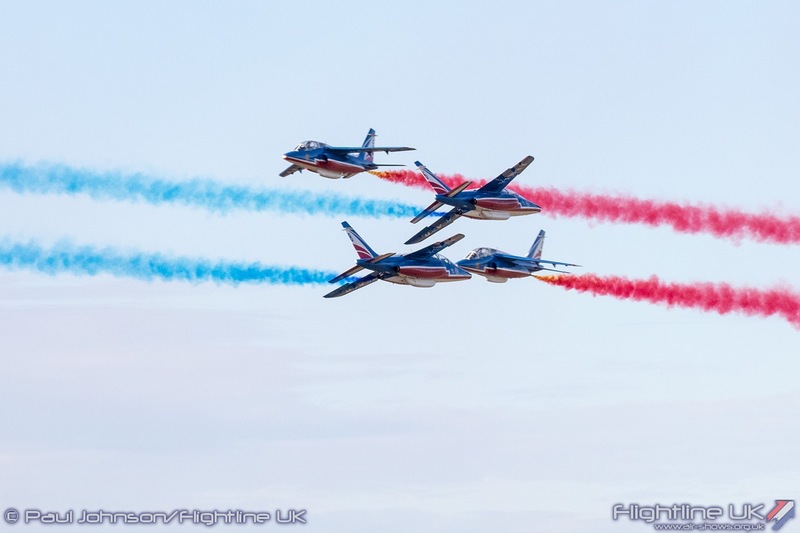 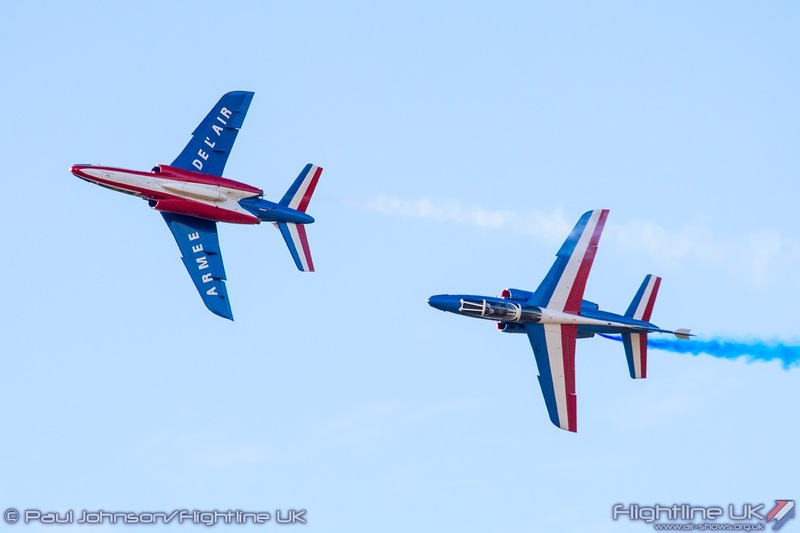 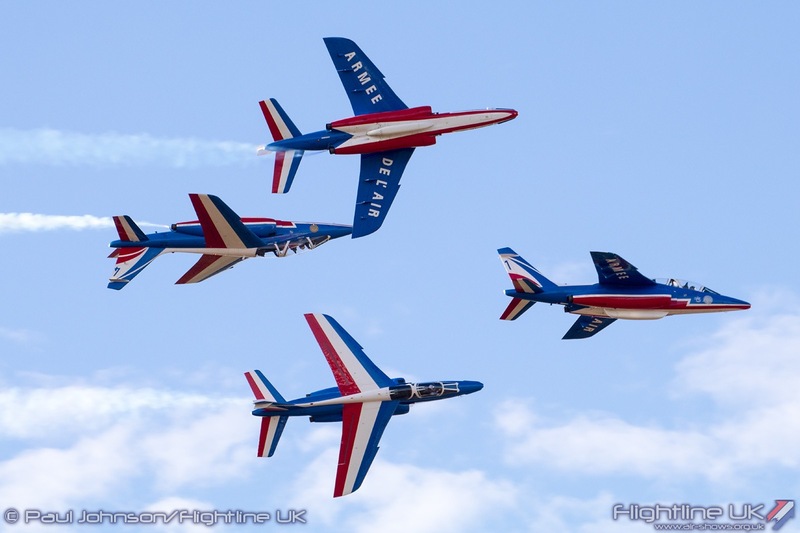 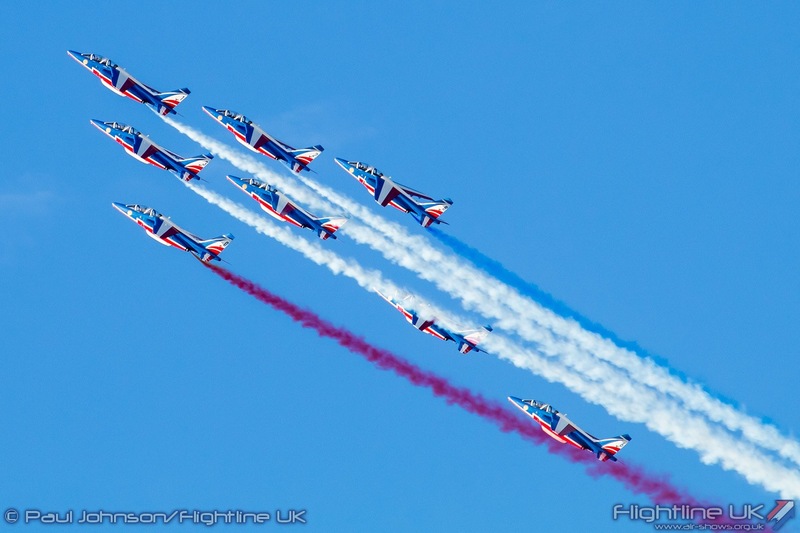 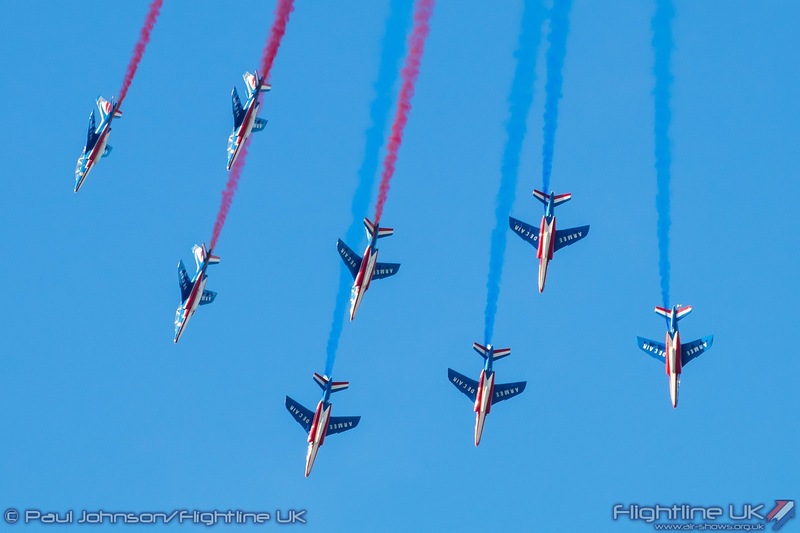 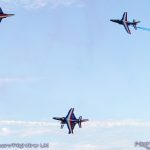 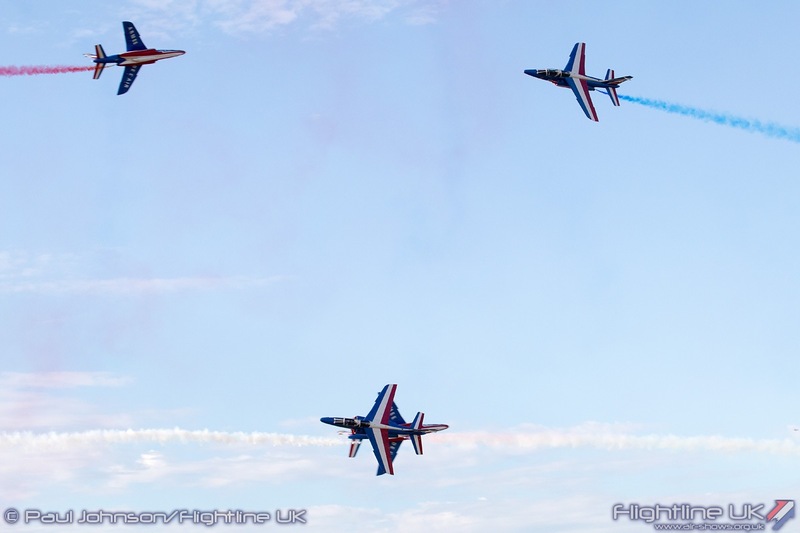 Closing the event on the Sunday were La Patrouille de France flying eight Dassault Alpha Jet Es. 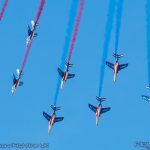 Their display is full of gallic flair with some unique formation passes and brilliant artistic use of smoke and was a fitting end to the whole event. 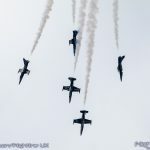 Belgian Air Force Days at Kleine Brogel was a hugely enjoyable weekend. 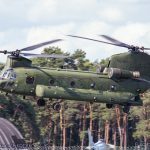 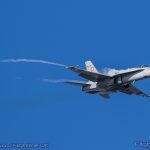 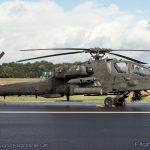 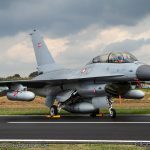 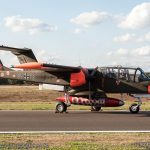 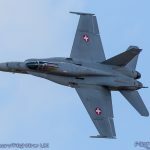 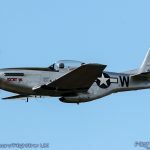 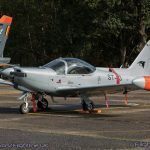 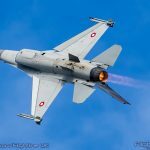 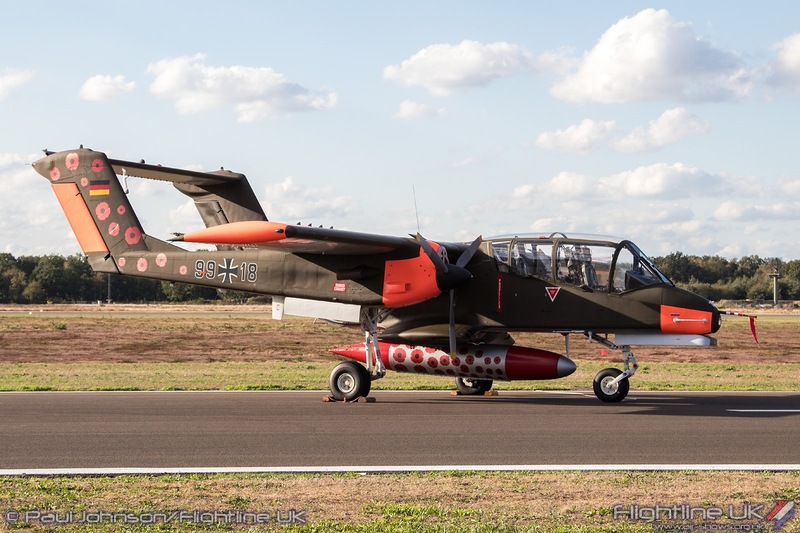 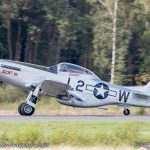 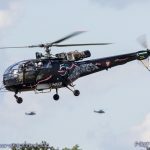 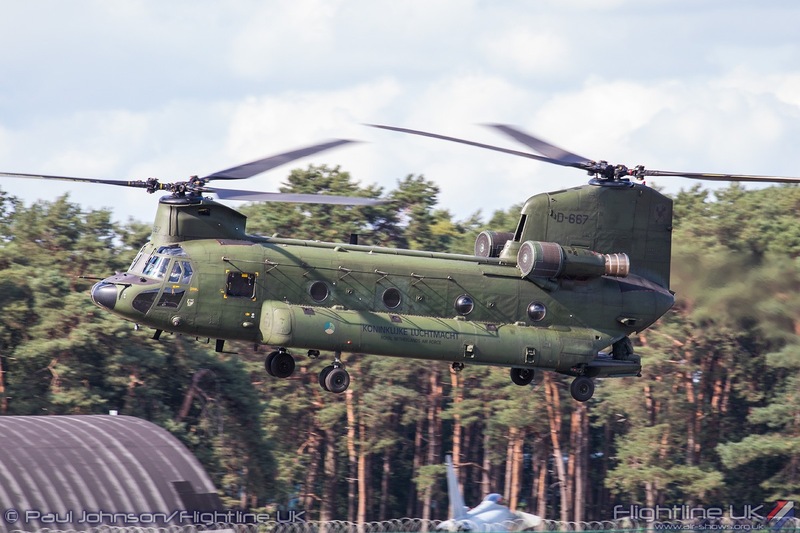 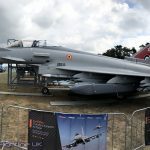 While it may have had a slightly smaller static display and lacked the big jet teams that were present at the show when it was last held at Kleine Brogel in 2014, the quality of the show was top class throughout. 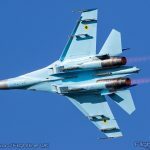 There were nice first time visitors and plenty of unique formations. 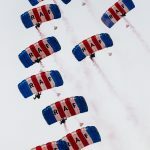 The organisation too was hard to fault with relatively straight forward access and exit on all three days plus there was more than enough catering throughout the showground! 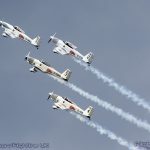 Next year, Kleine Brogel will once again be a busy place supporting the International Sanicole Airshow which is held over the weekend of 13th and 15th September 2019.